Today was the last outing for the Marmots in Calgary, and it was one of the best ones so far! After breakfast the marmots had english lessons and then lunch. 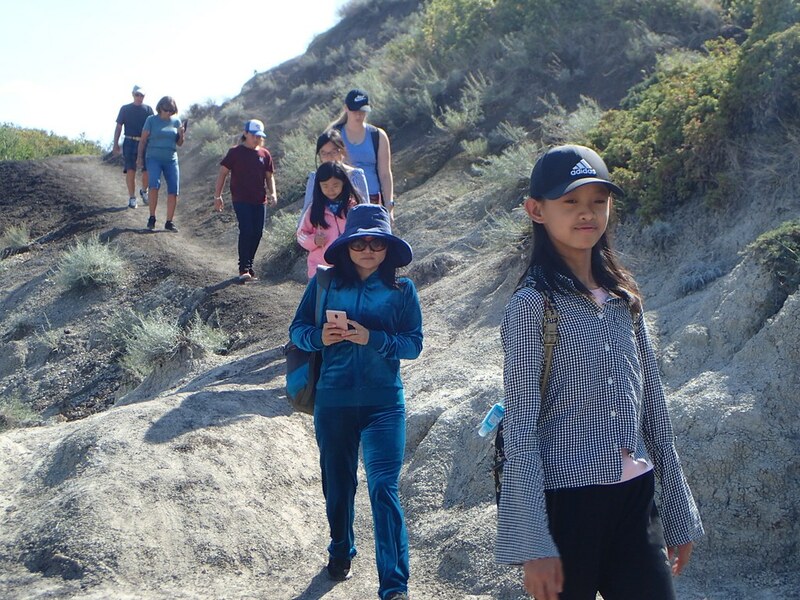 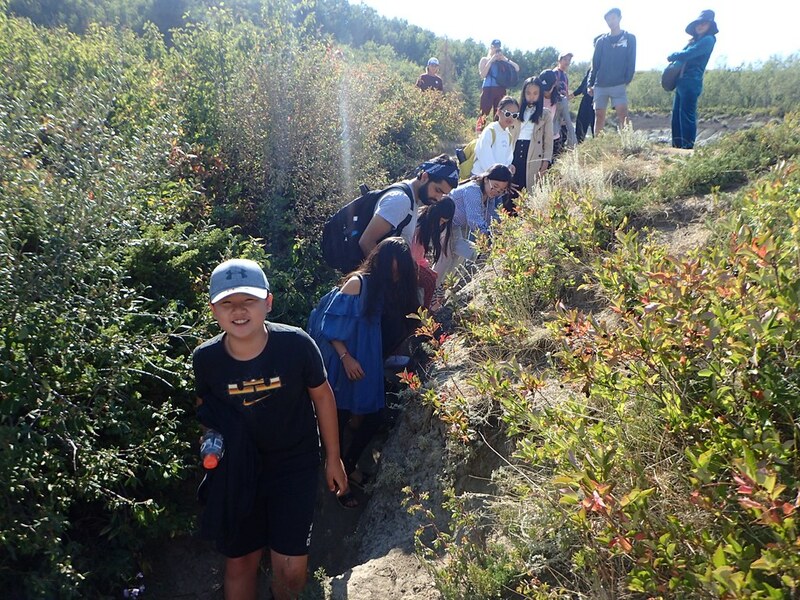 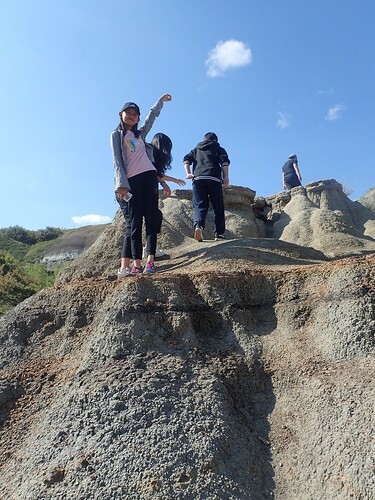 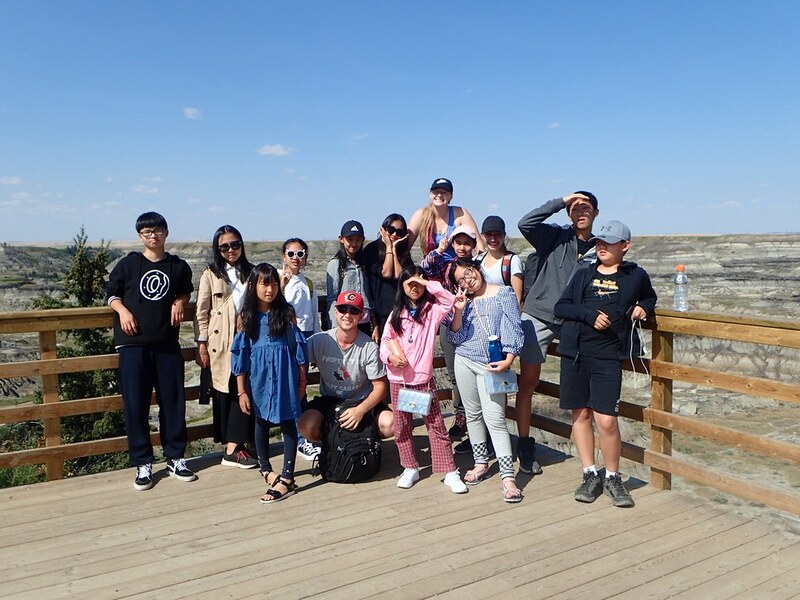 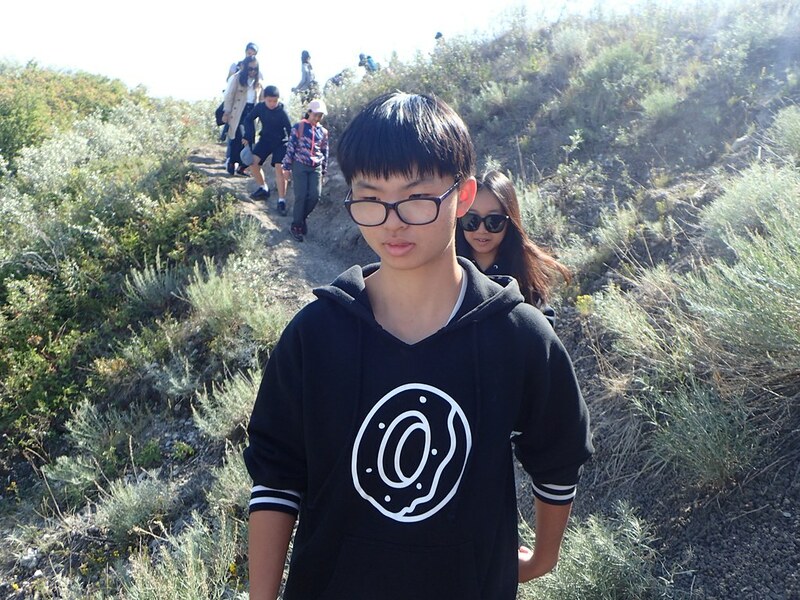 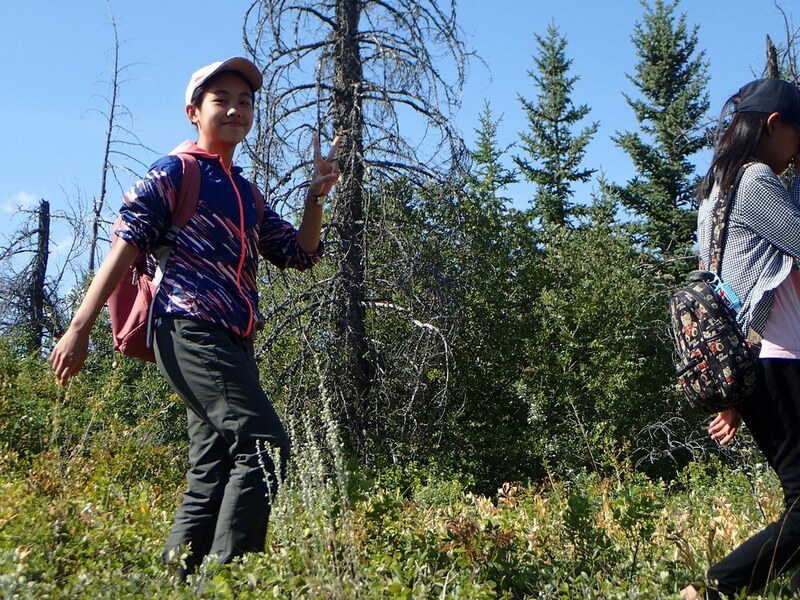 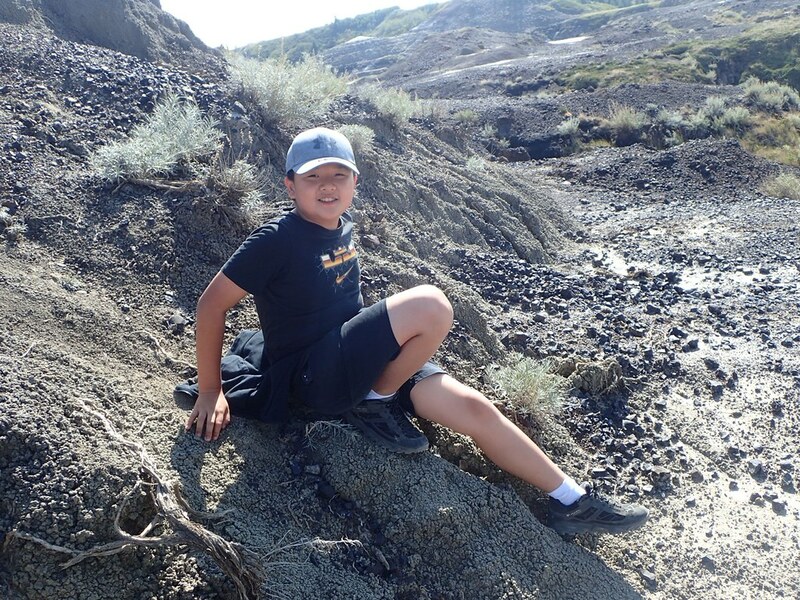 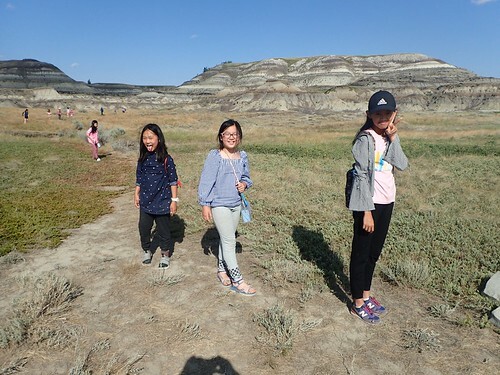 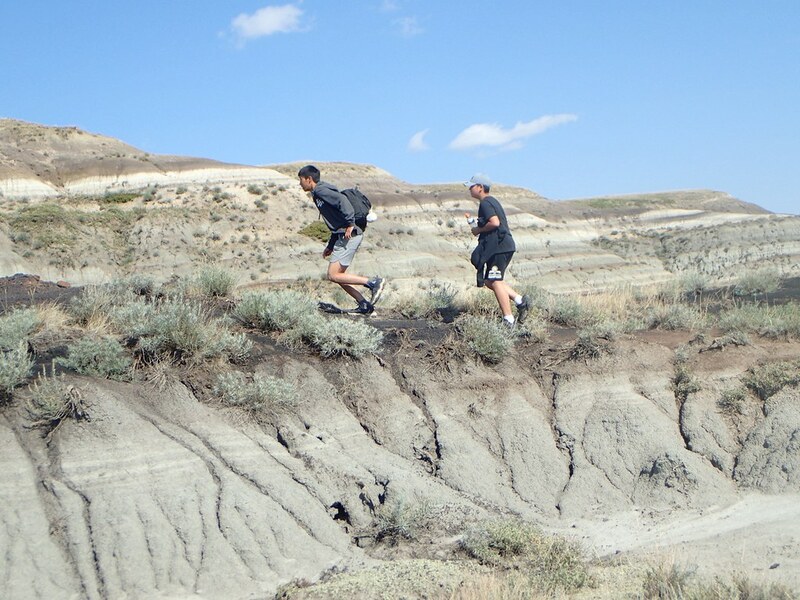 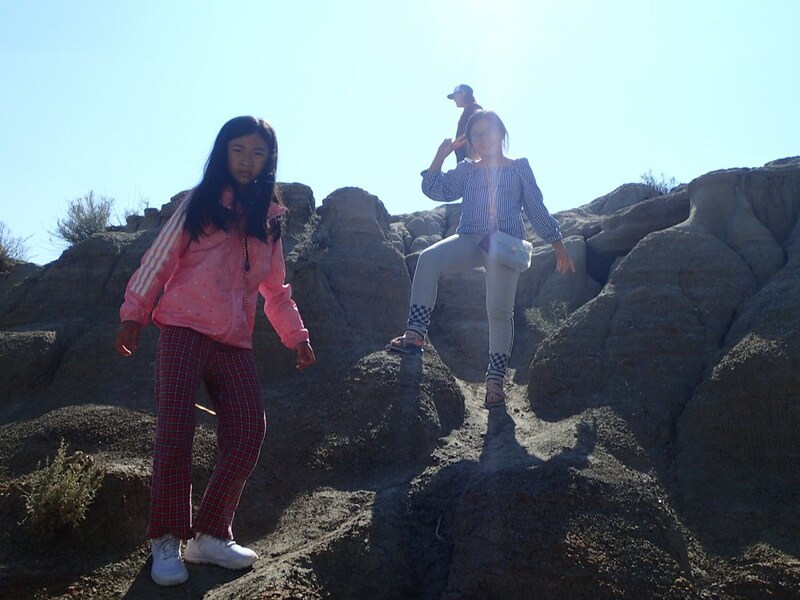 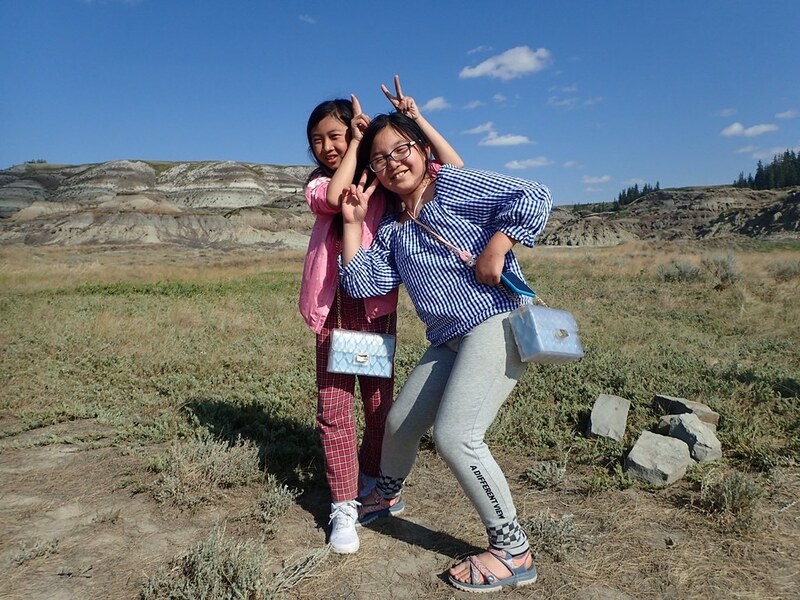 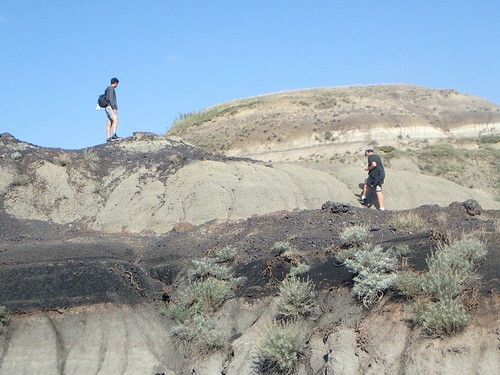 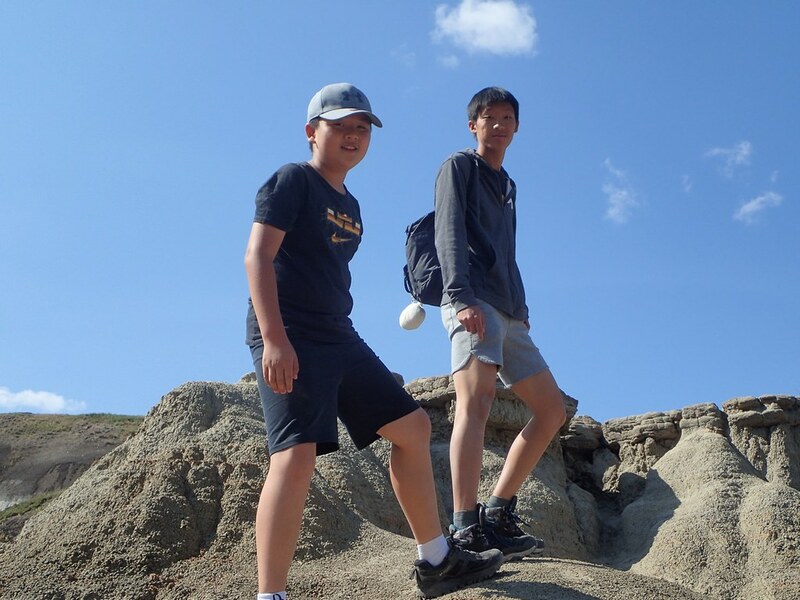 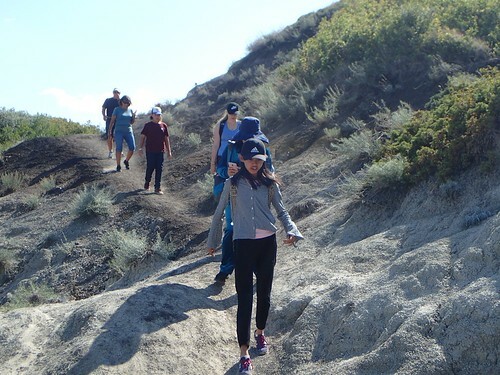 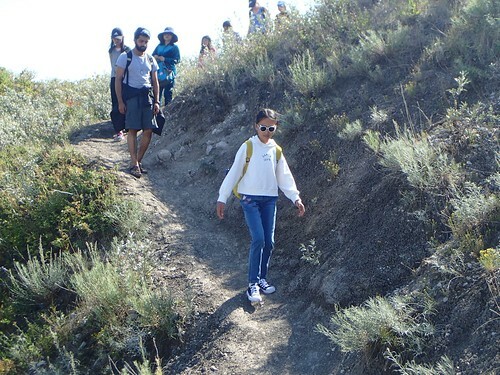 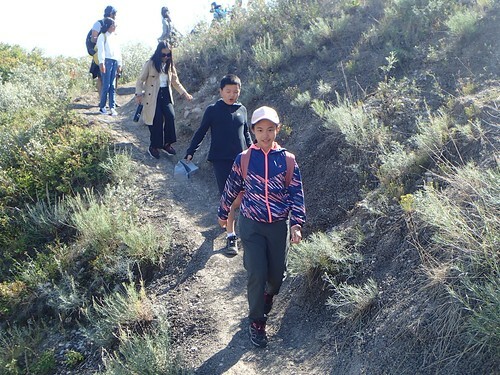 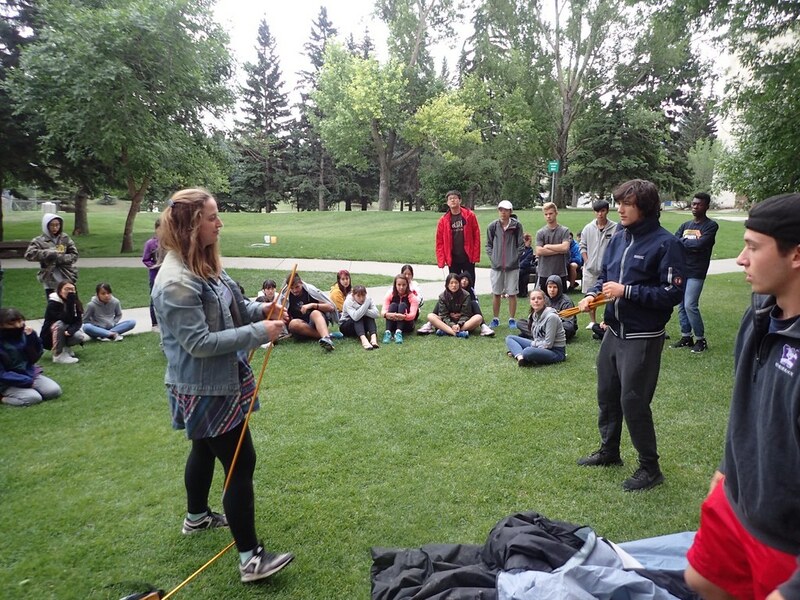 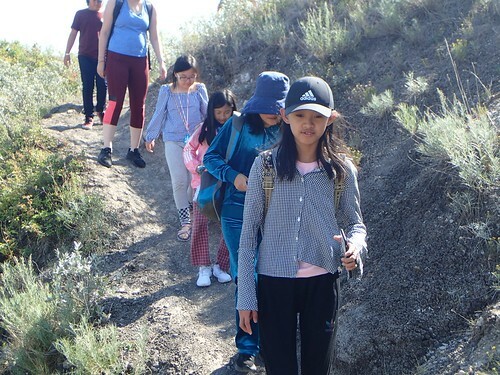 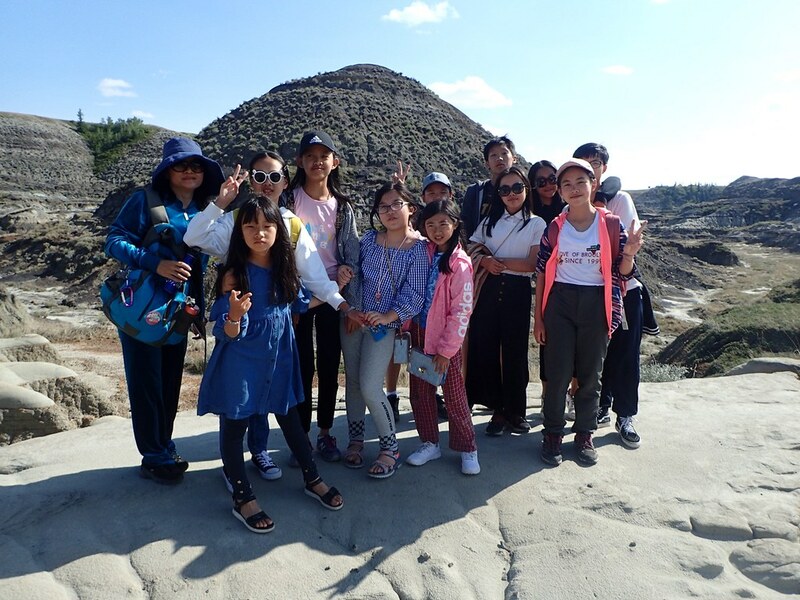 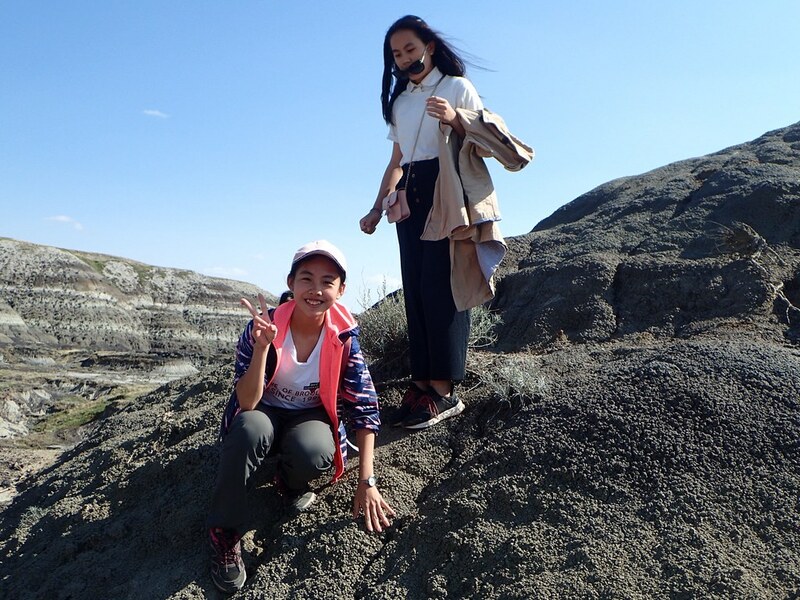 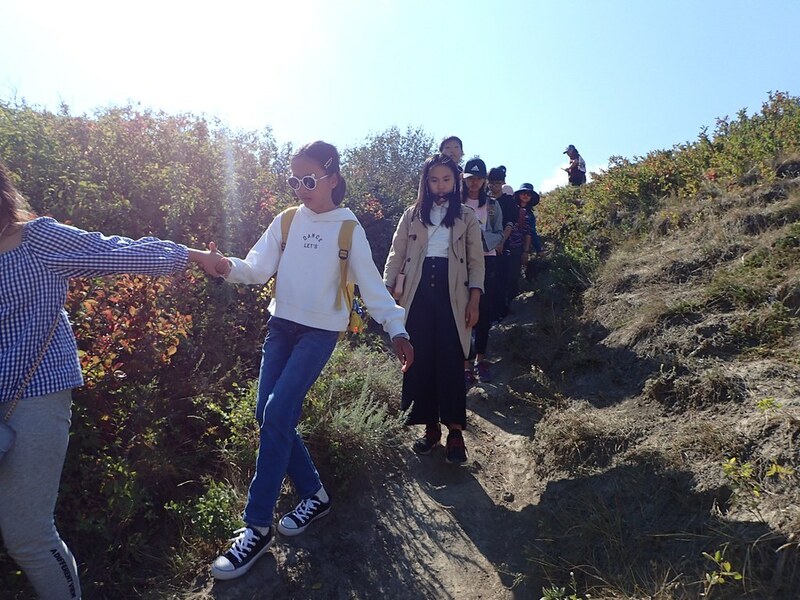 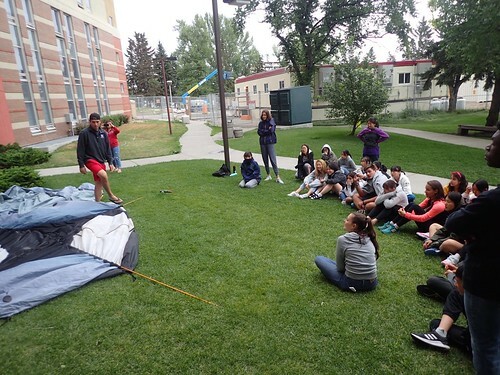 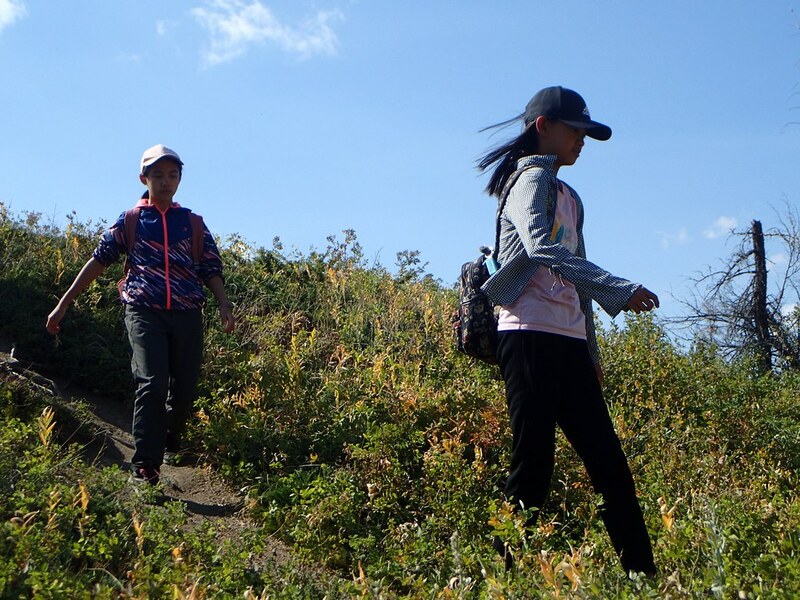 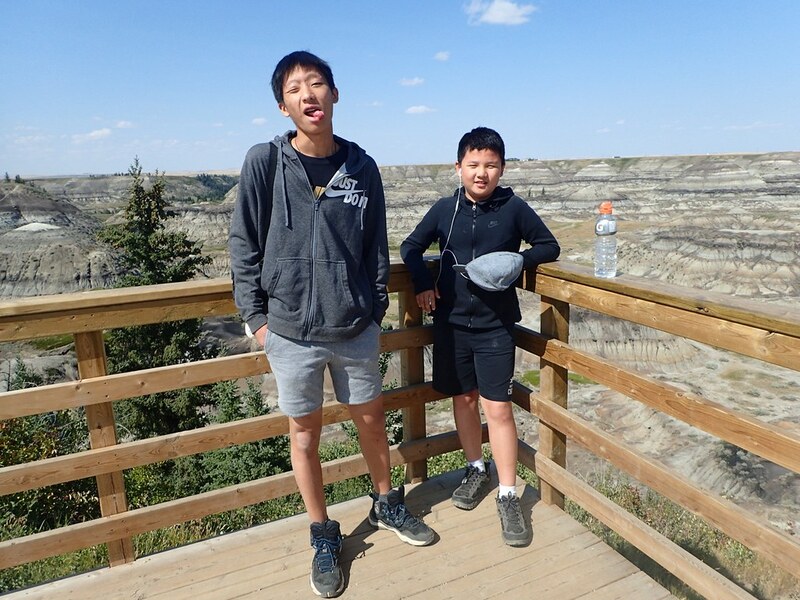 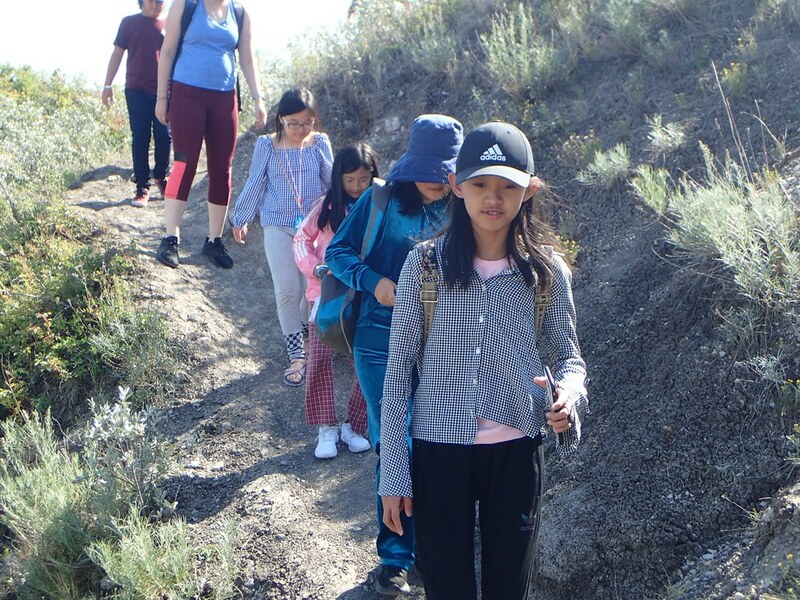 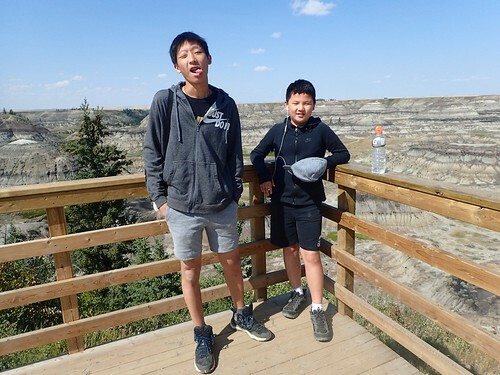 After lunch, they were in for a long bus ride to Horseshoe Canyon where they hiked around for an hour. 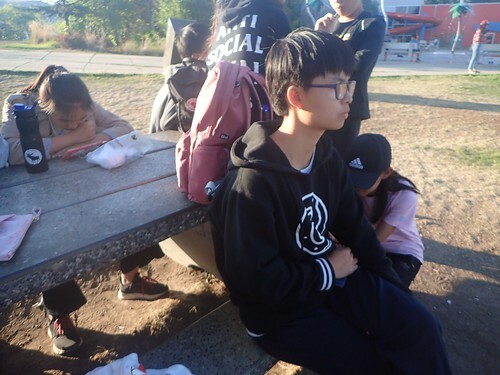 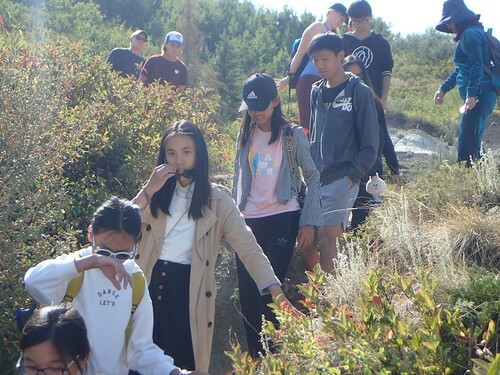 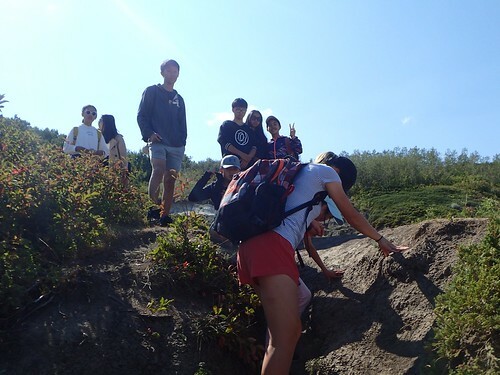 They were so exhausted but there was fresh juicy watermelon waiting for them at the end of the hike so they can get refreshed. 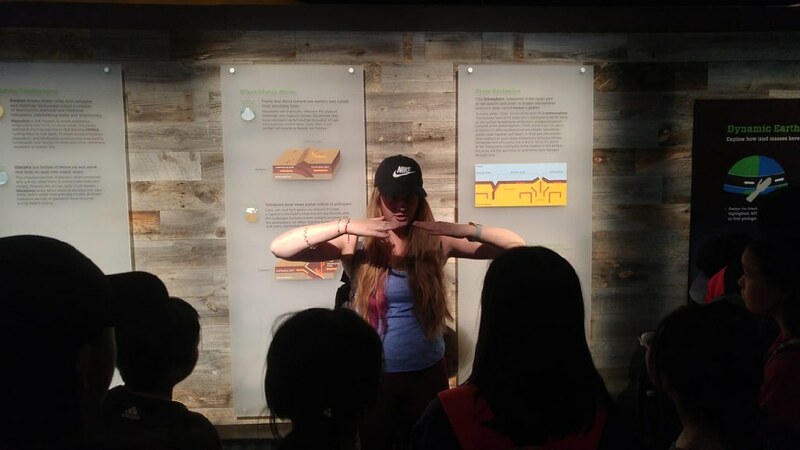 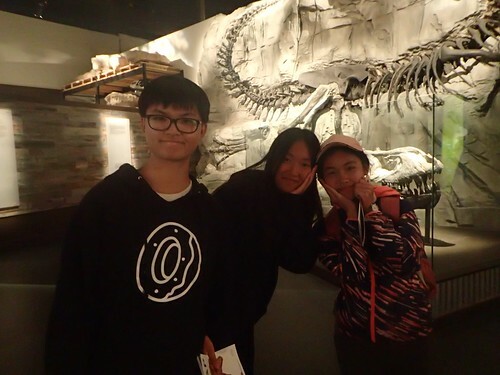 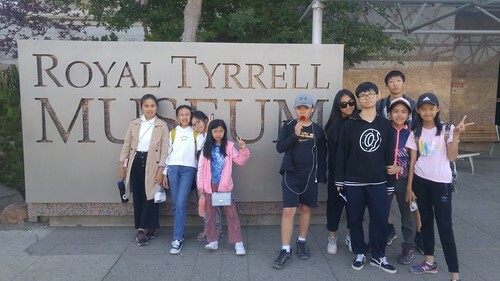 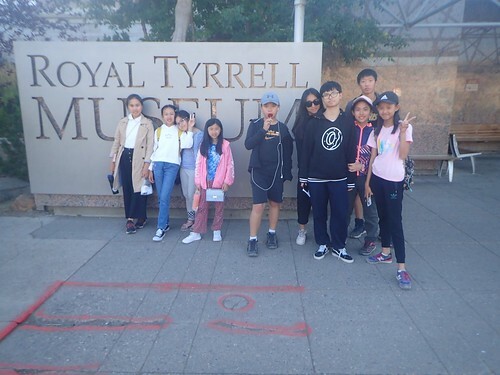 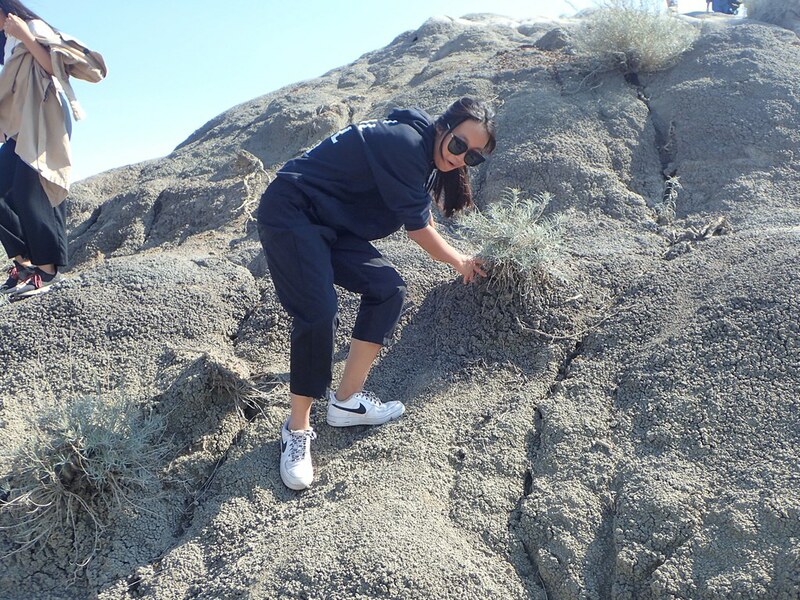 The next stop was the Royal Tyrrell Museum where the students learnt a whole bunch of things about dinosaurs! 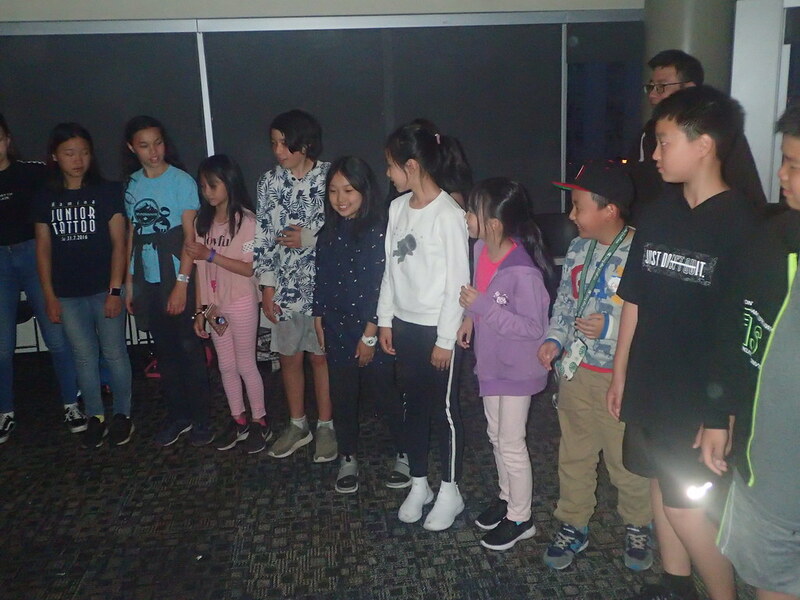 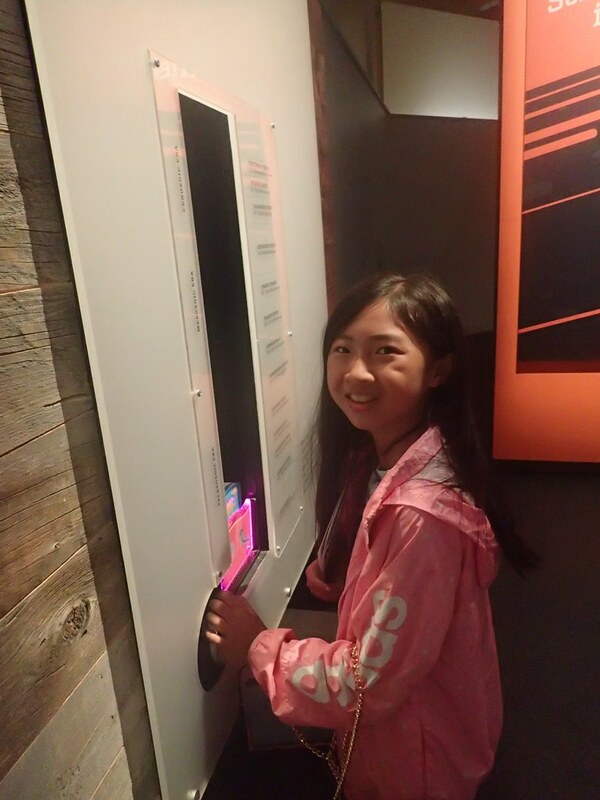 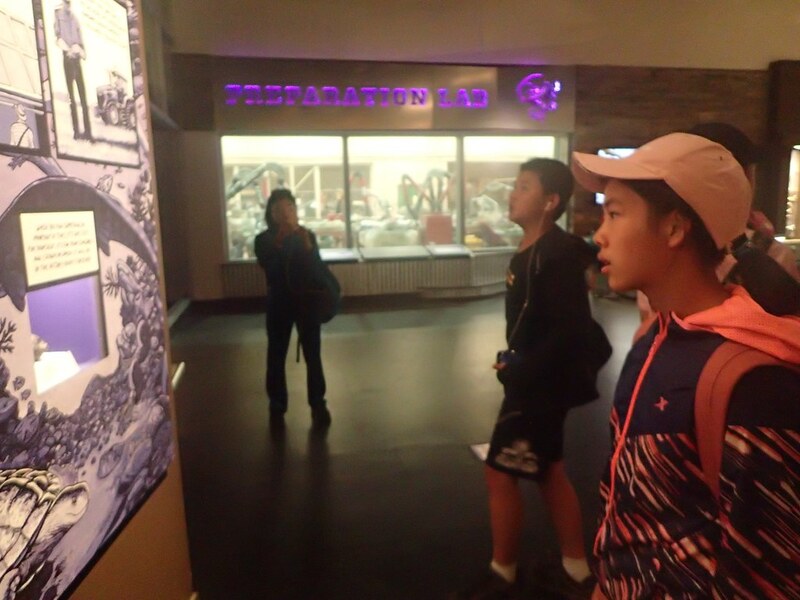 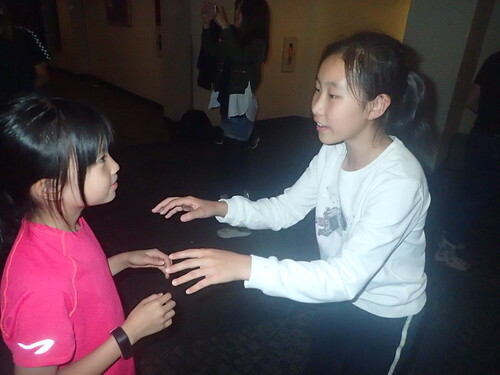 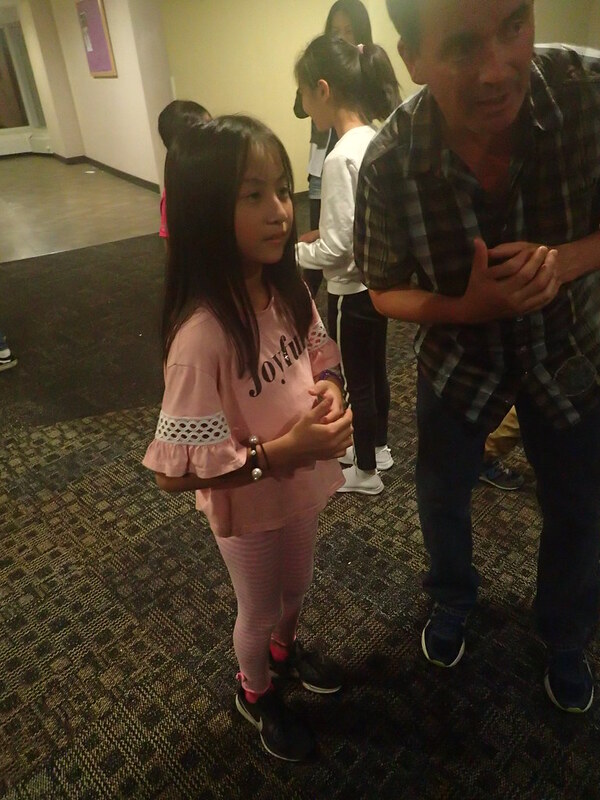 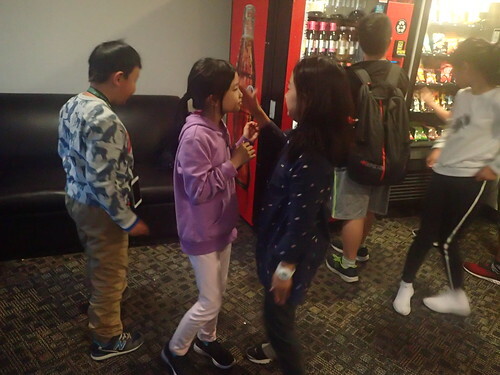 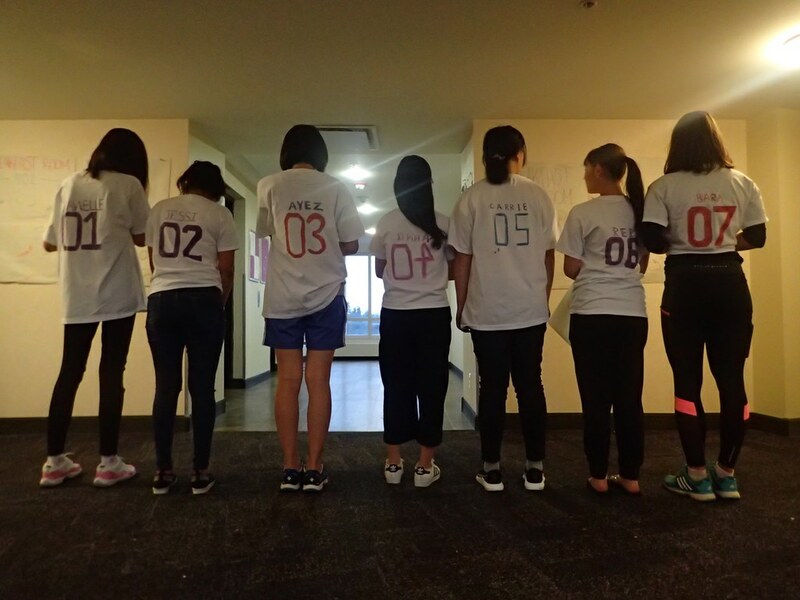 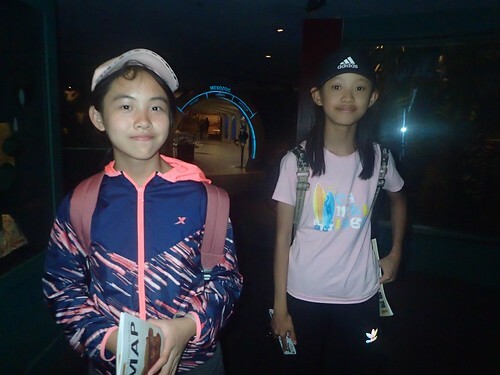 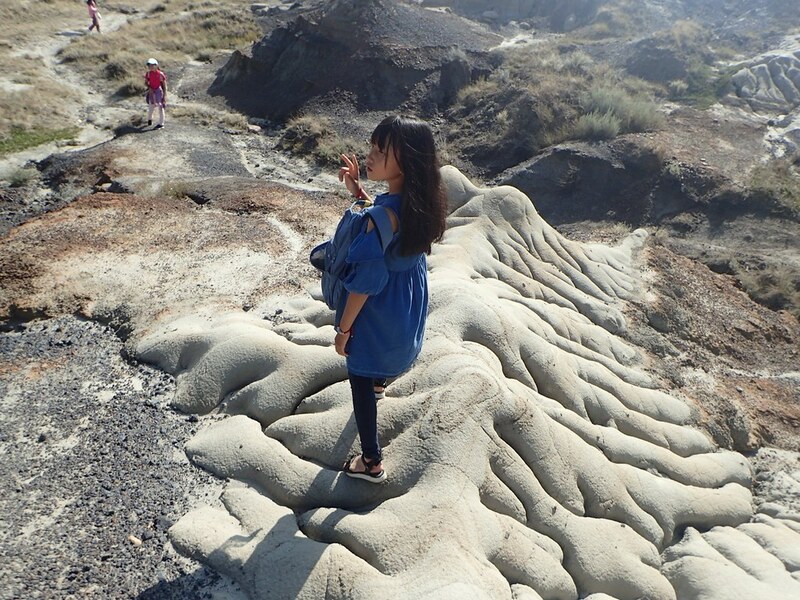 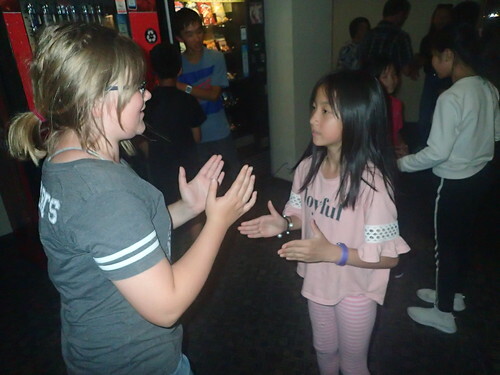 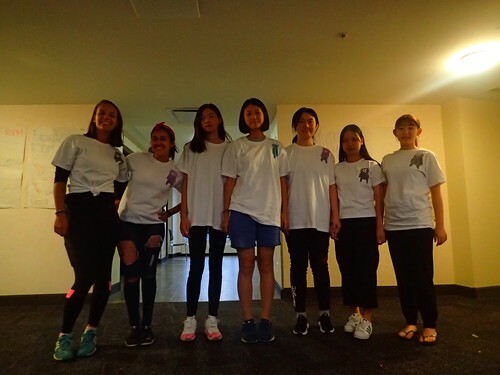 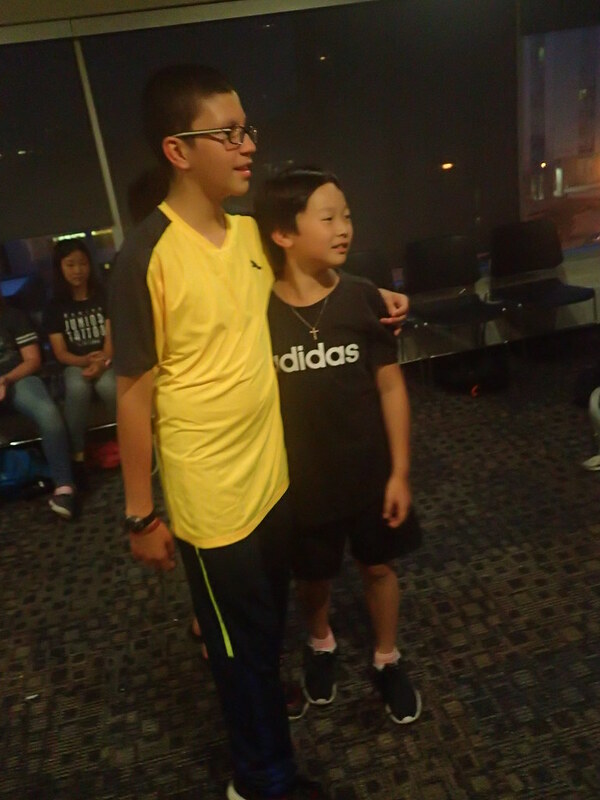 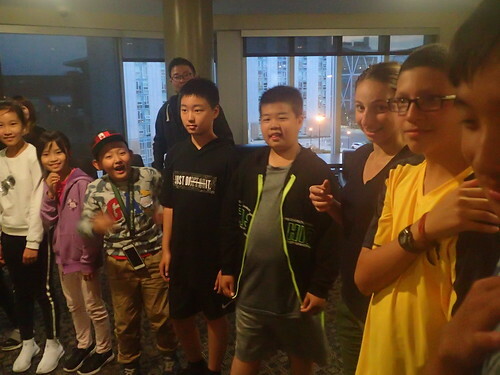 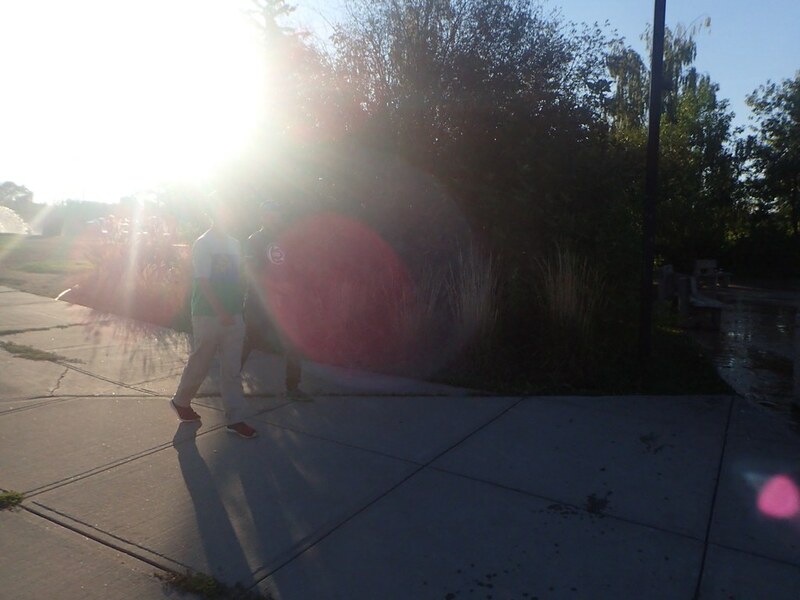 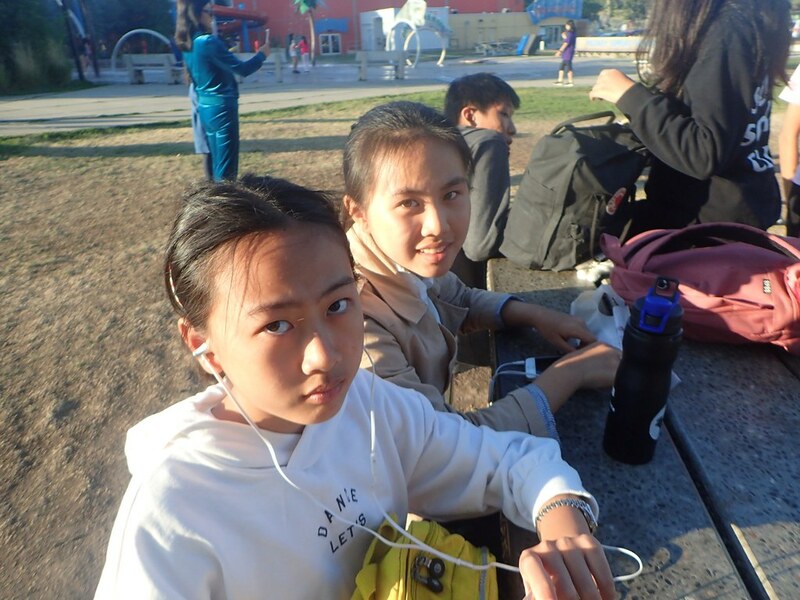 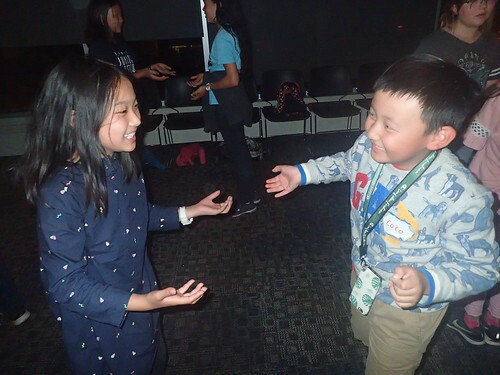 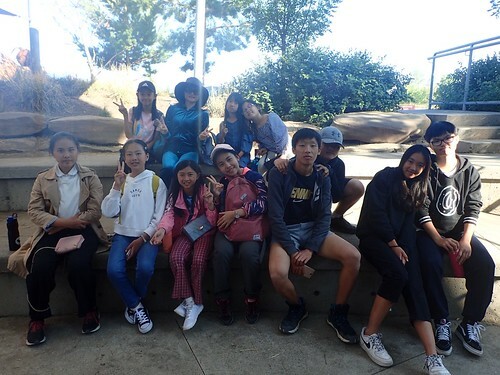 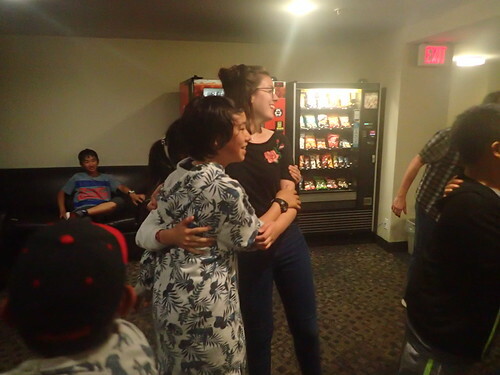 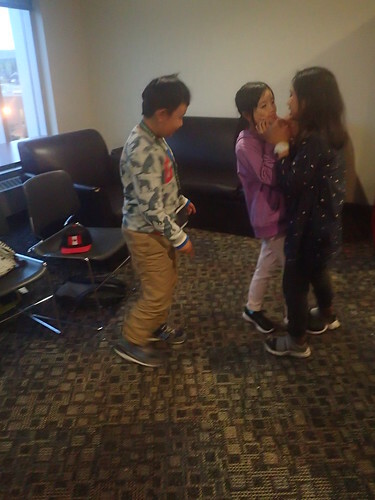 They went through the different times and also got to visit the planetarium. 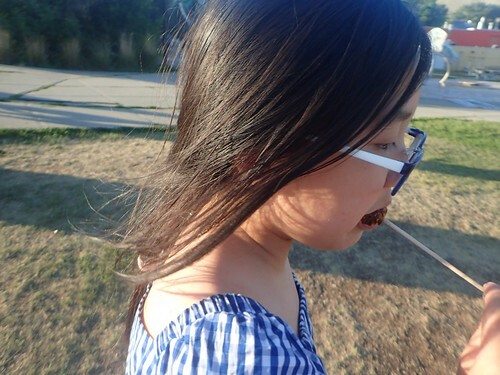 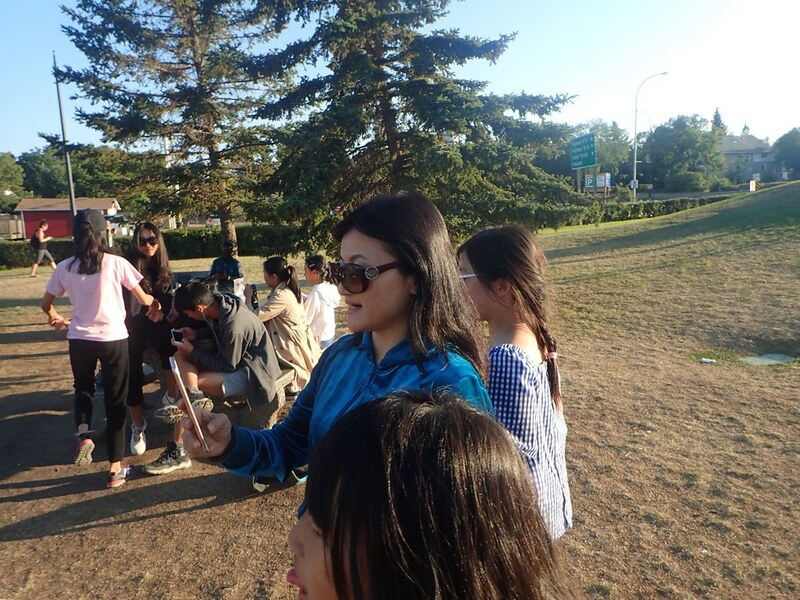 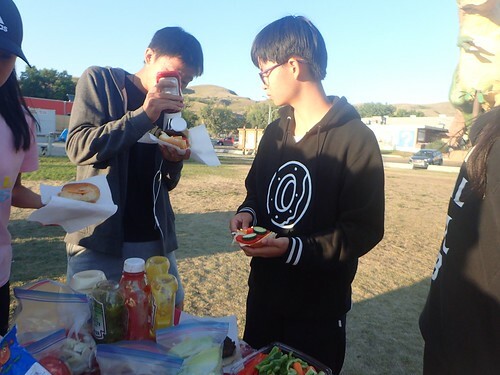 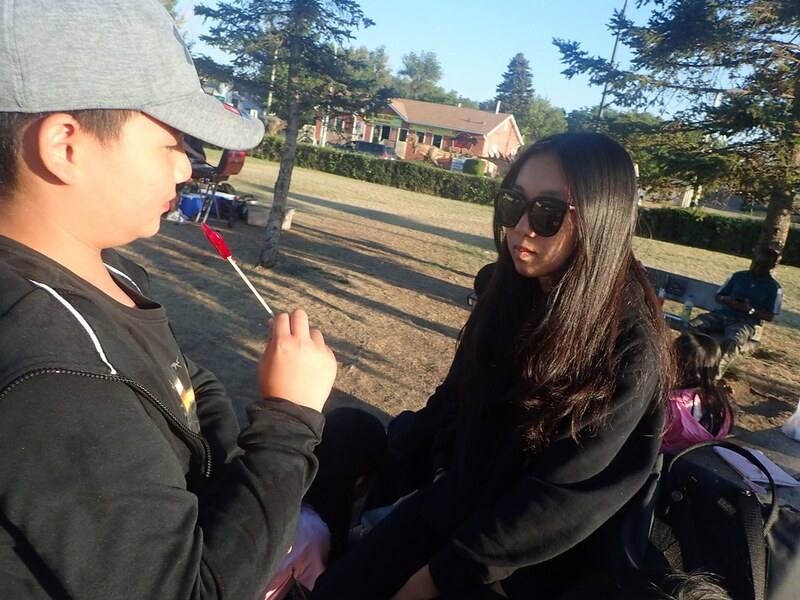 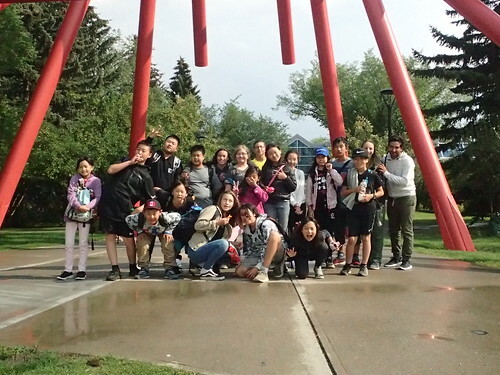 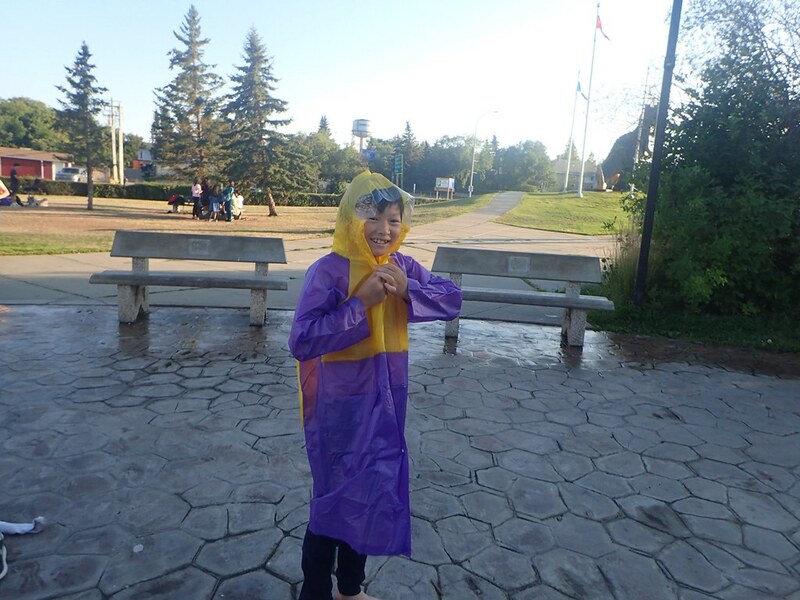 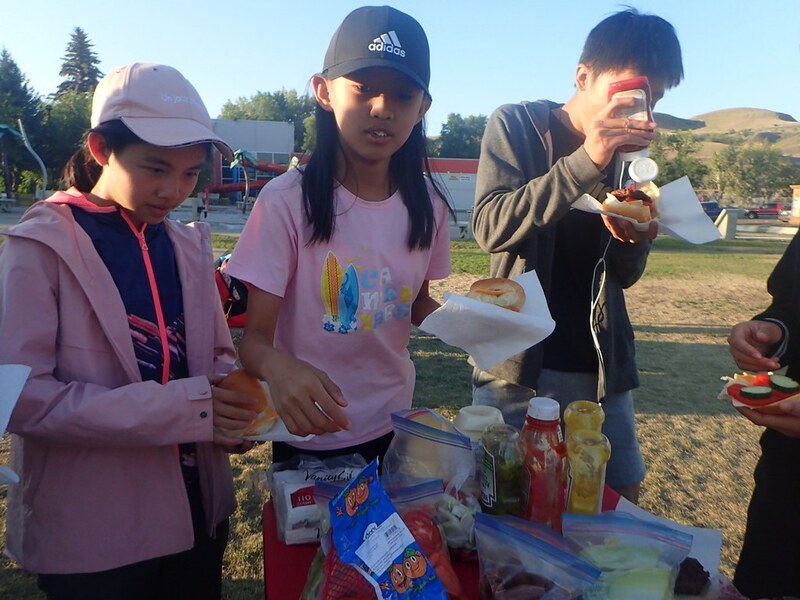 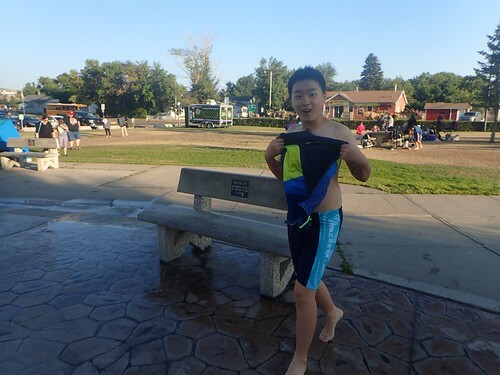 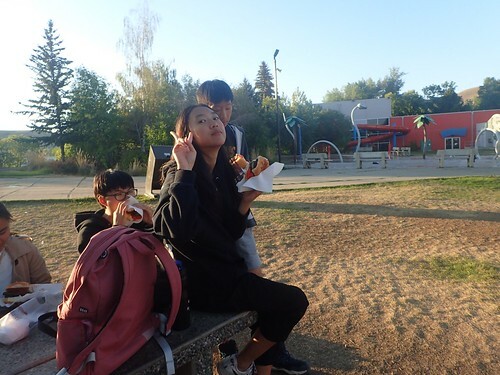 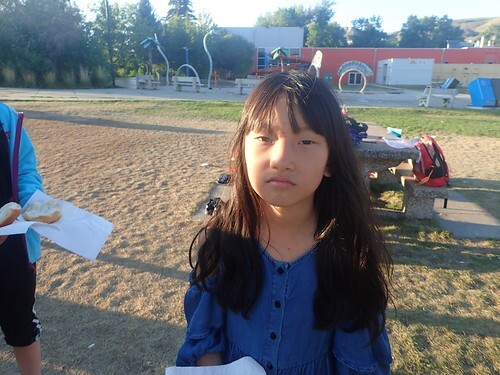 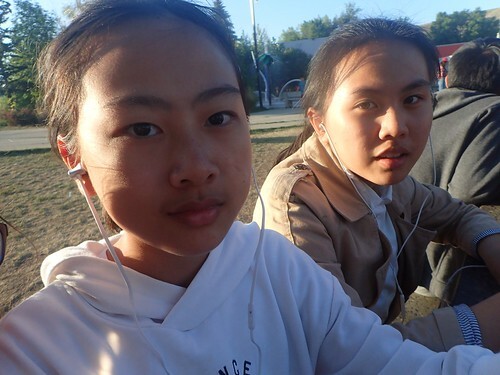 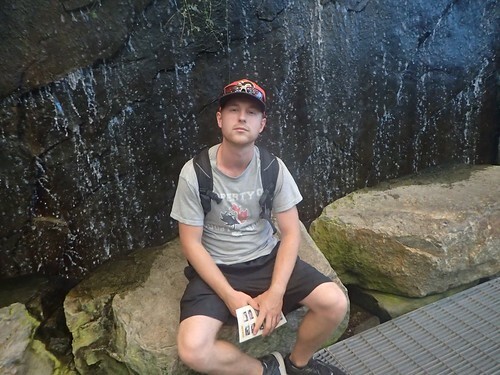 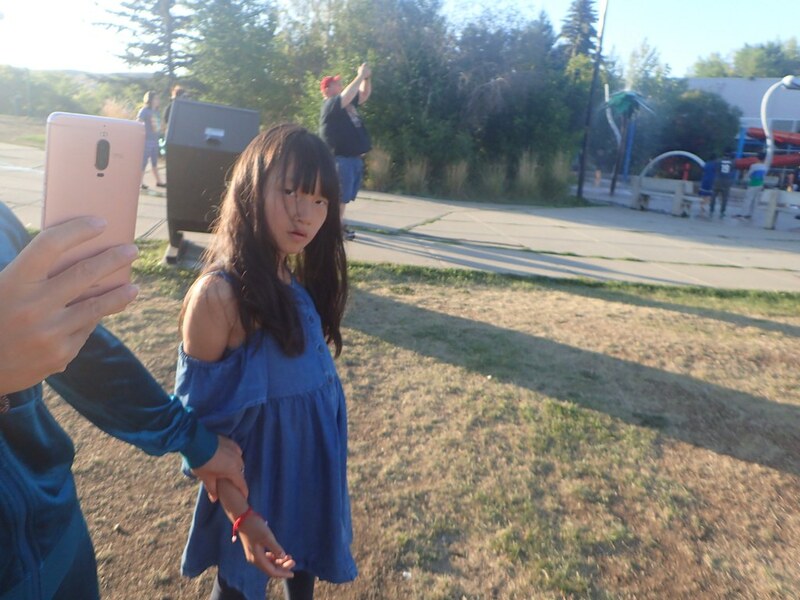 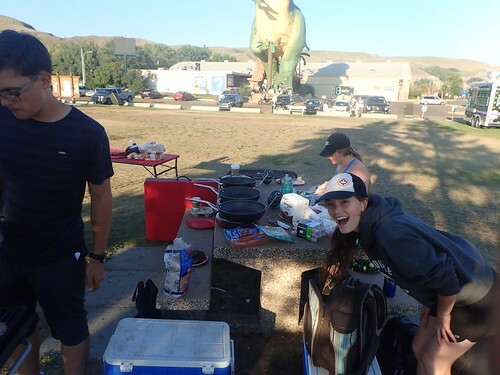 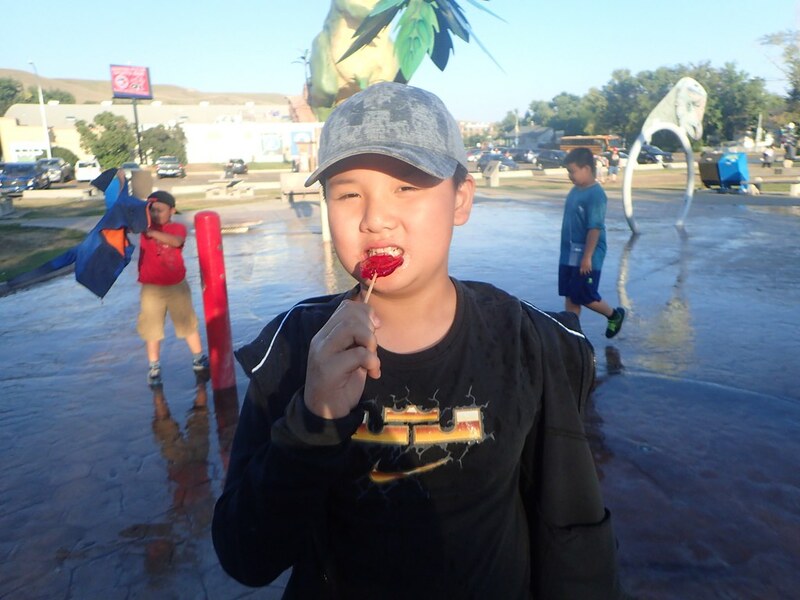 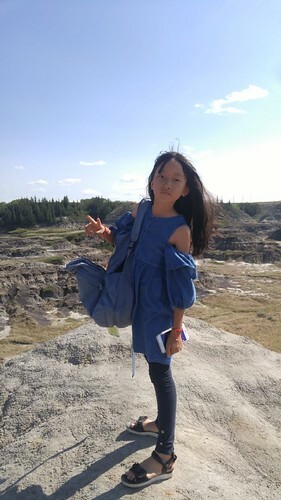 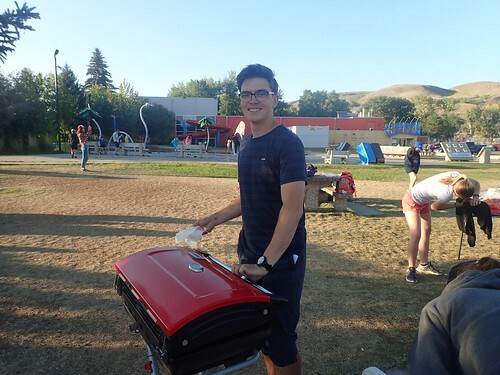 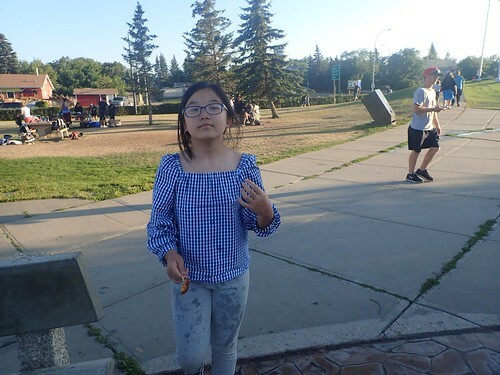 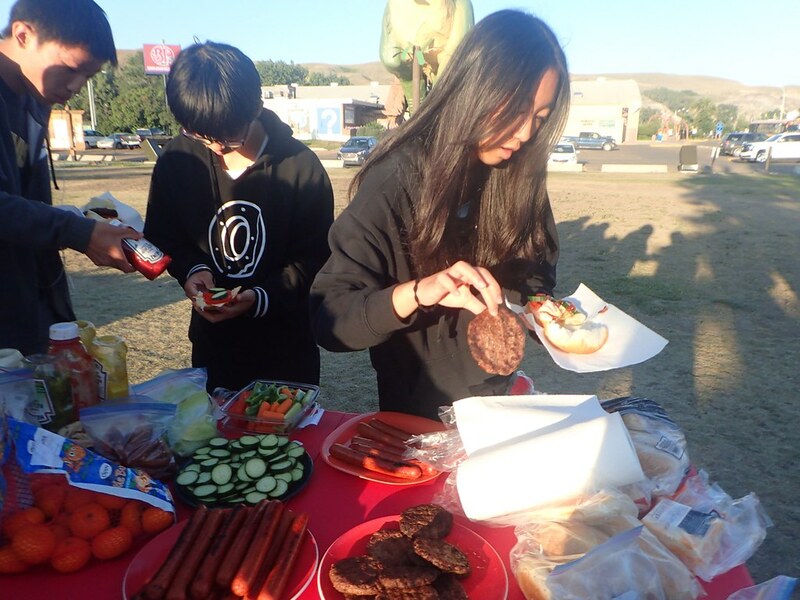 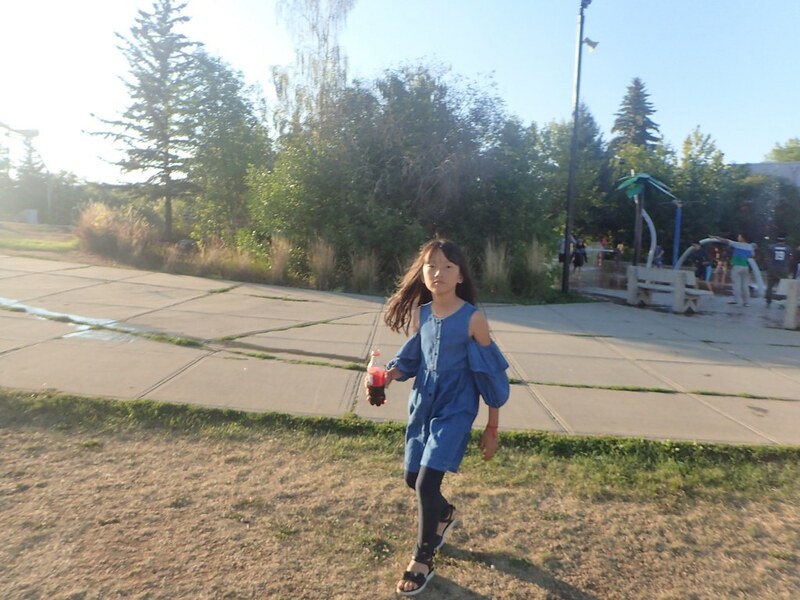 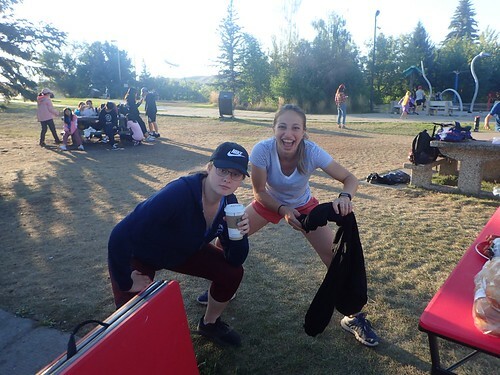 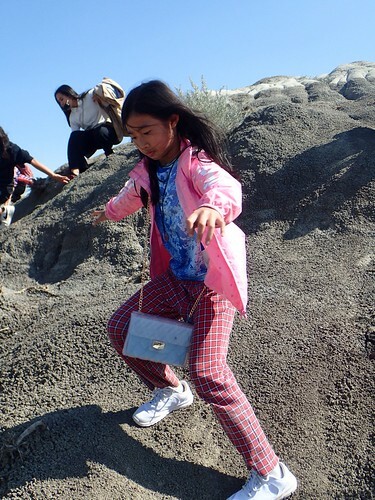 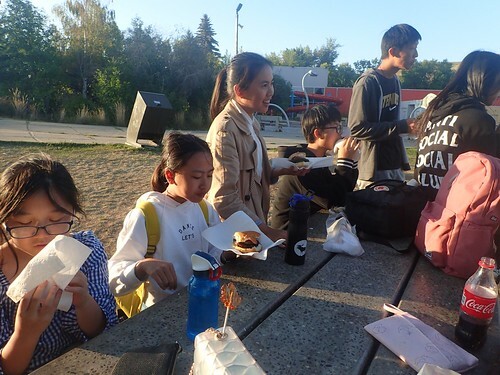 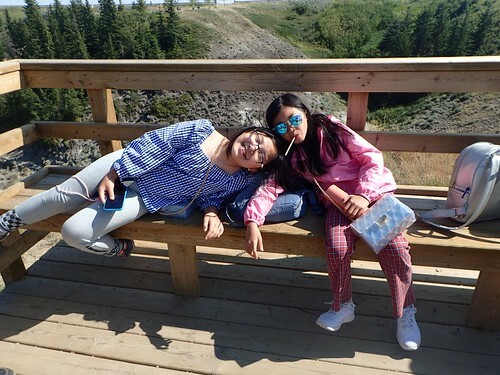 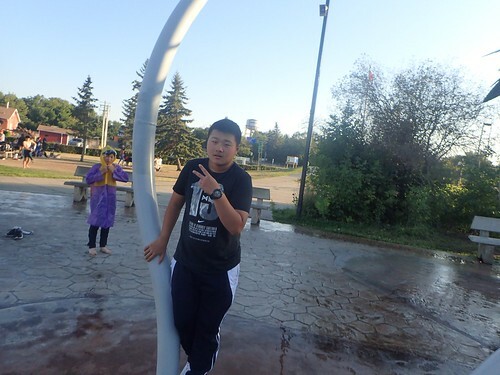 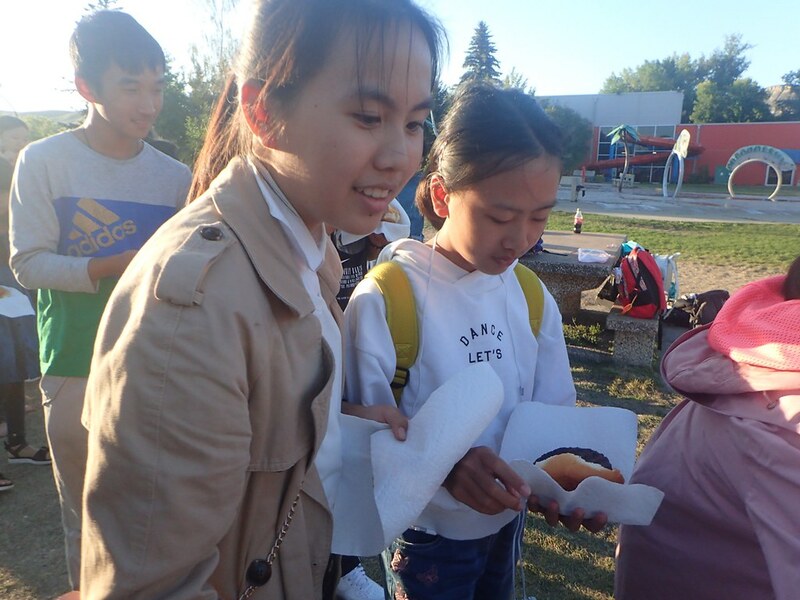 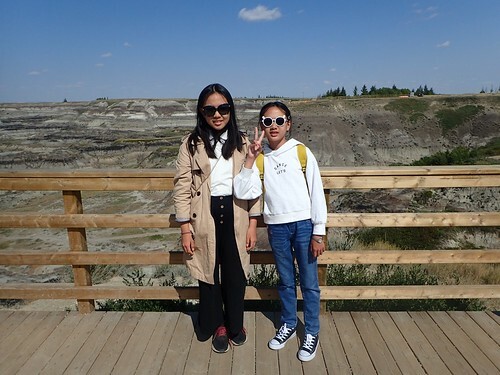 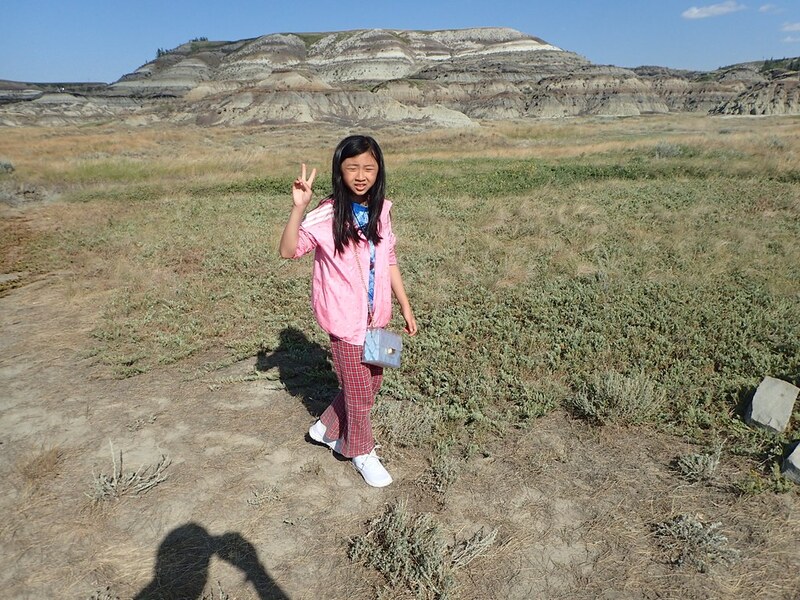 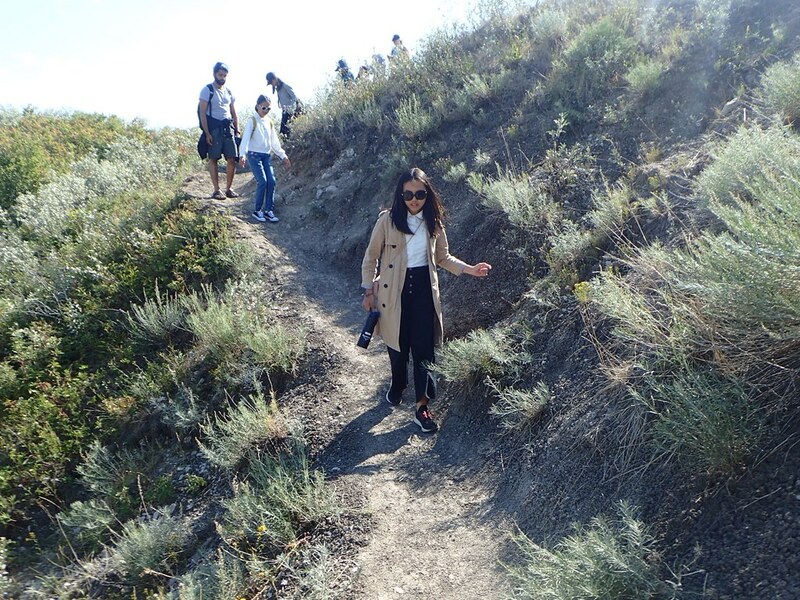 After the visit to the museum, they had a picnic in Drumheller at a park where they enjoyed some hot dogs and hamburgers. They also enjoyed the sprinklers and pool. 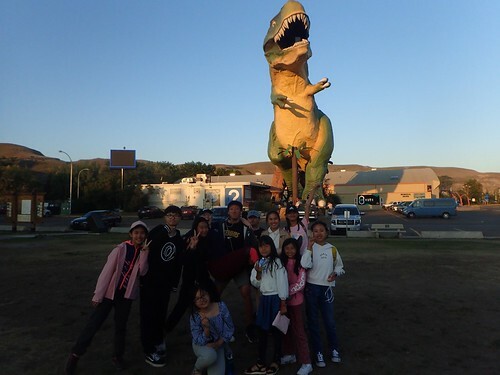 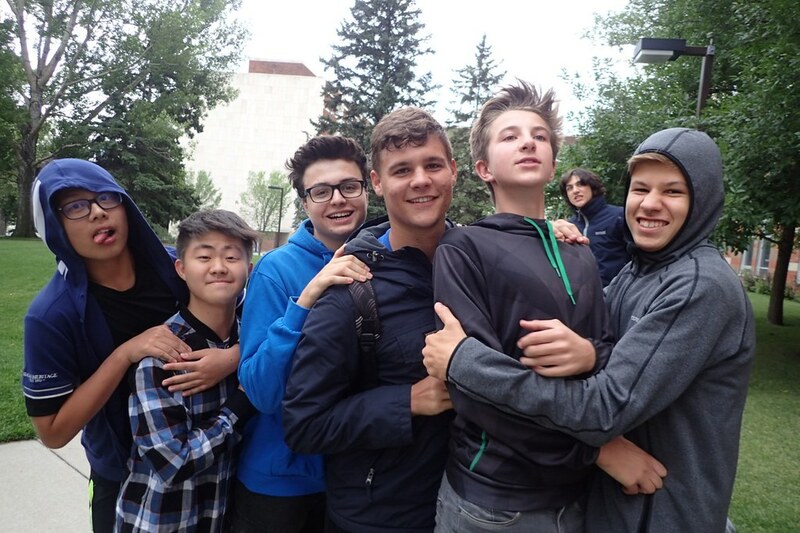 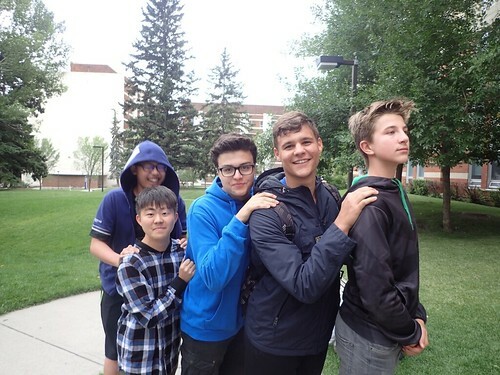 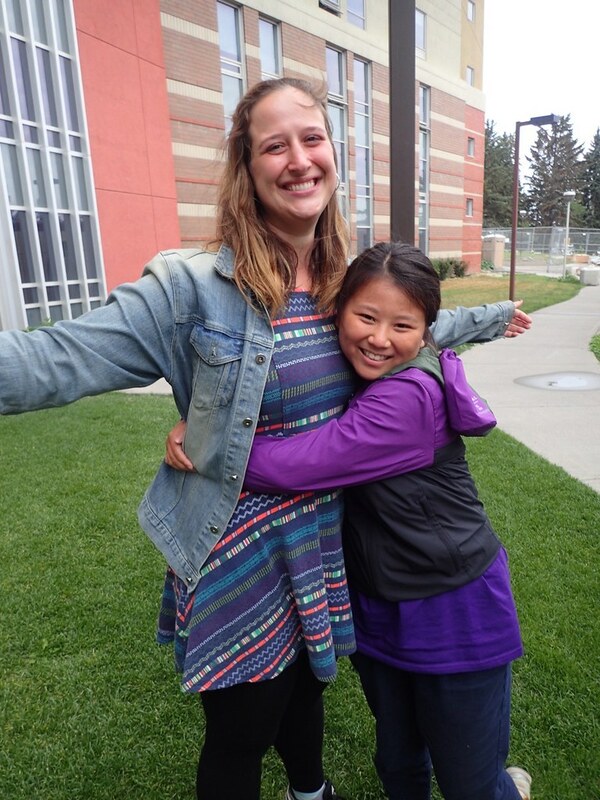 They took a final picture with a giant dinosaur and headed back to SAIT. 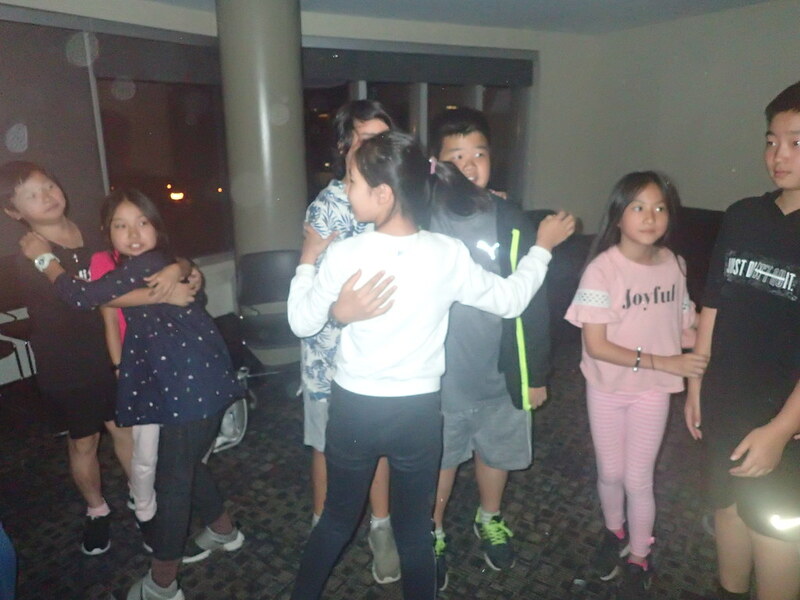 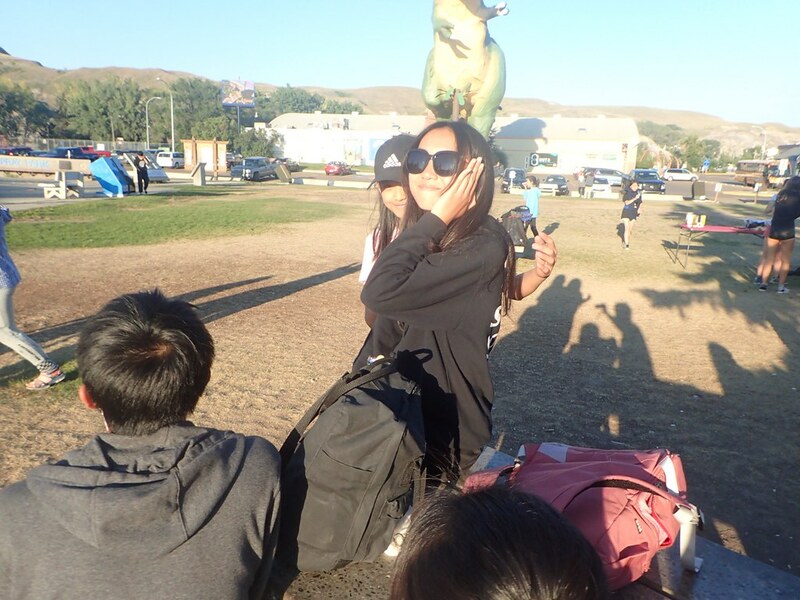 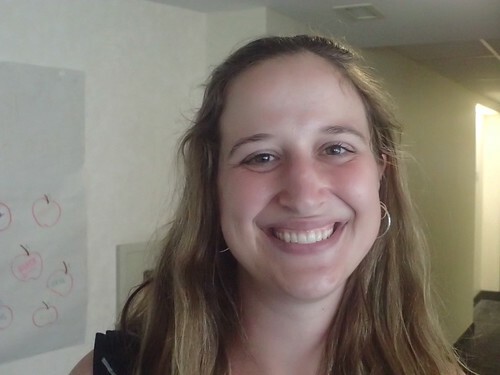 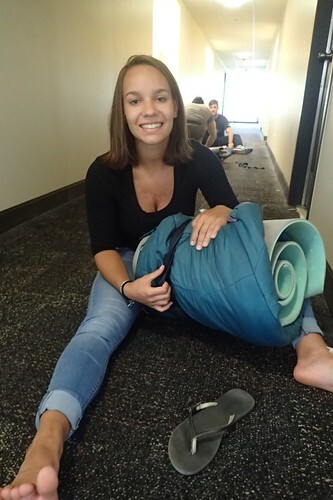 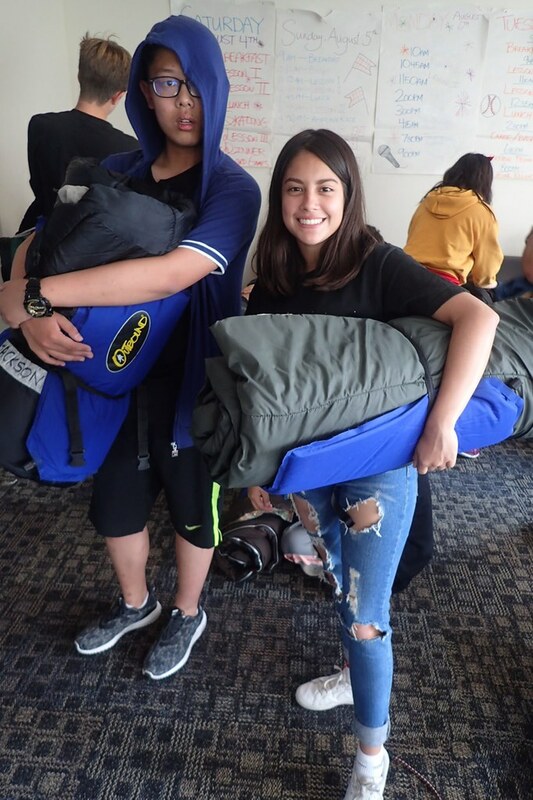 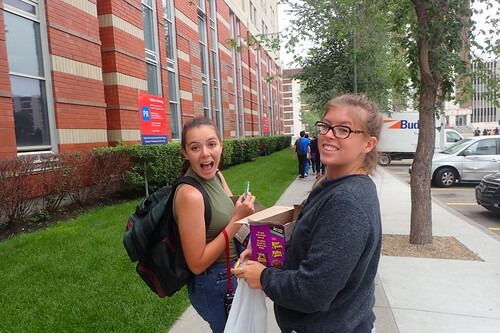 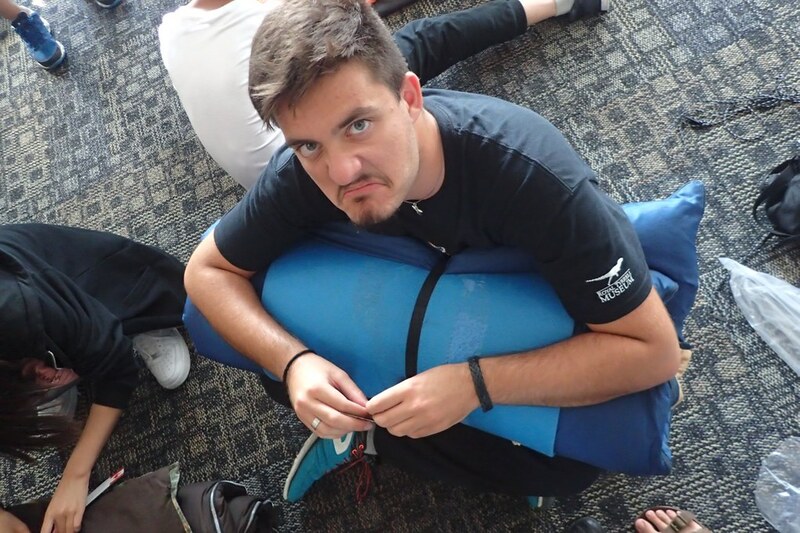 They had a fun road trip back where the students sang, danced and napped. 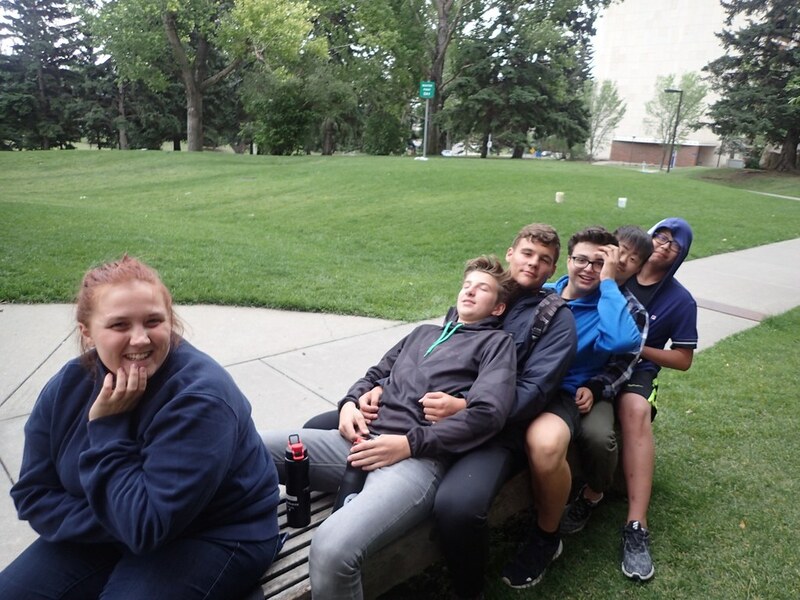 They were exhausted and went to bed right away in preparation for tomorrow being their last full day at Wynchemna! 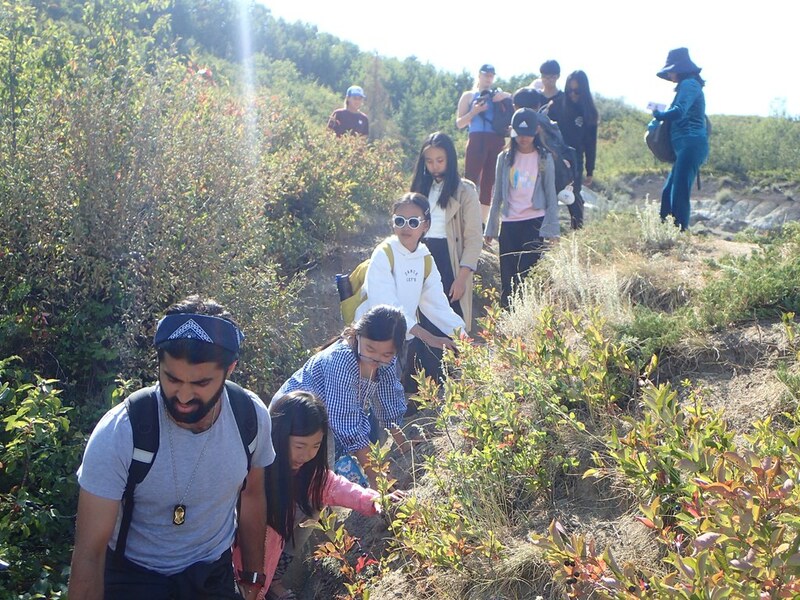 Such an amazing day for the Cunning Arctic Foxes today! 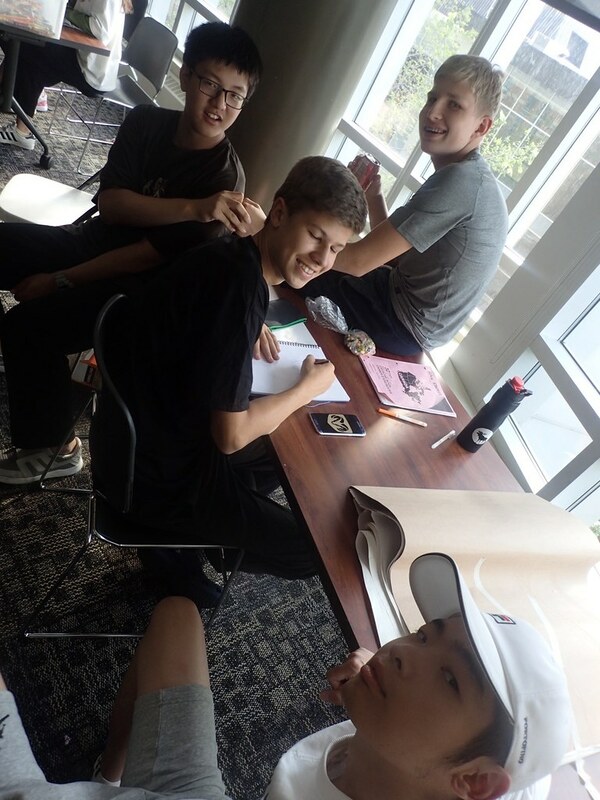 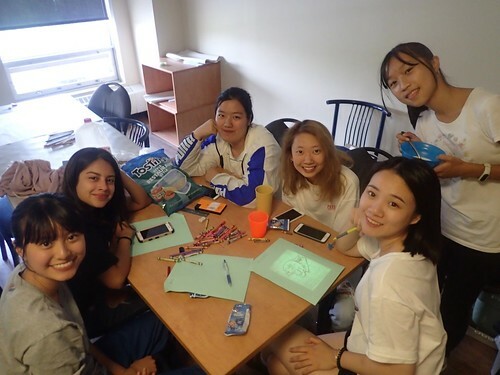 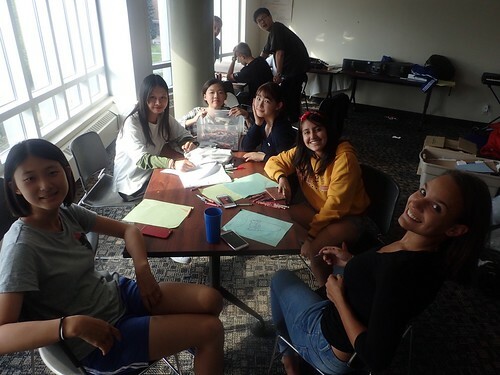 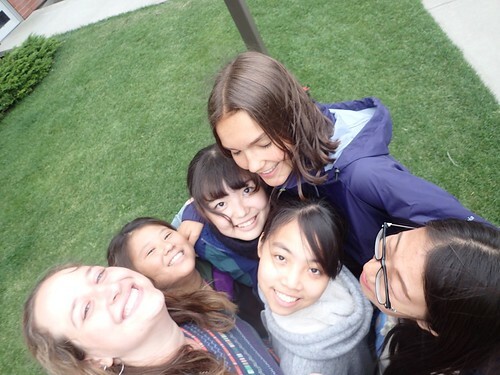 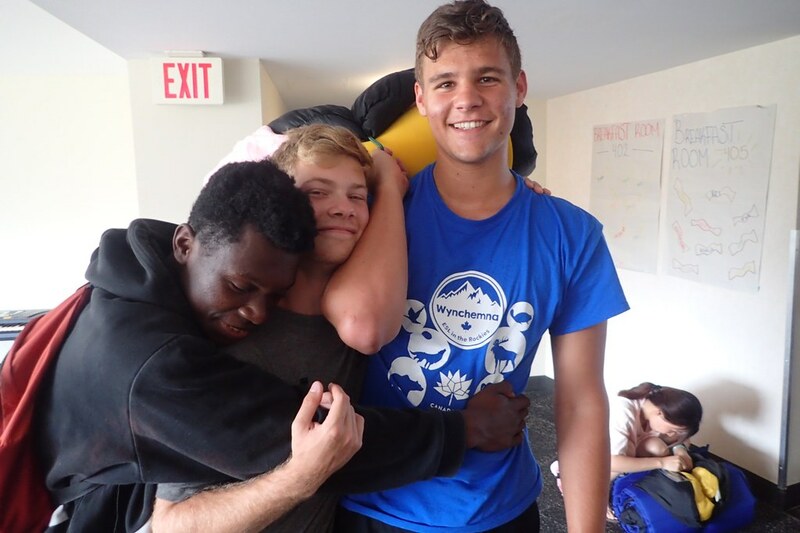 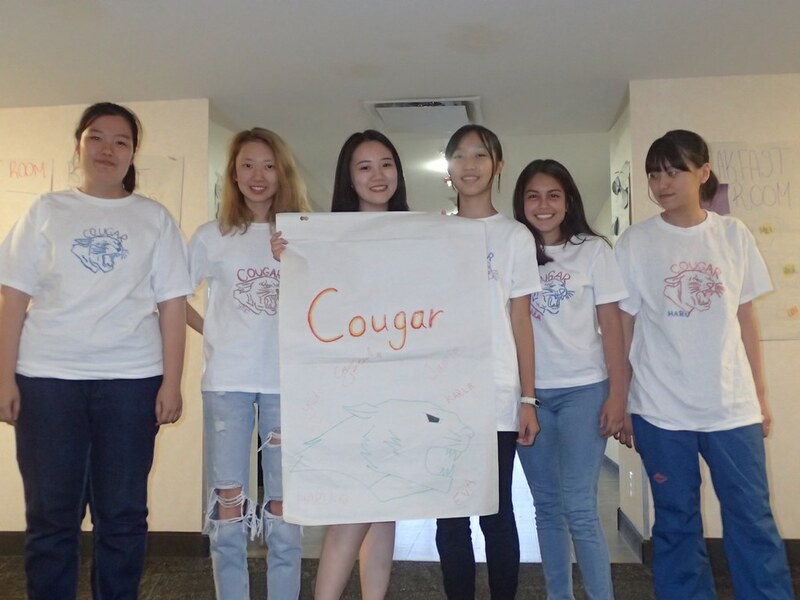 They started off the day with a great breakfast and two short English and French lessons. 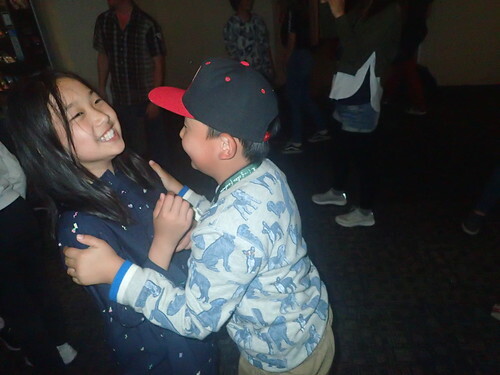 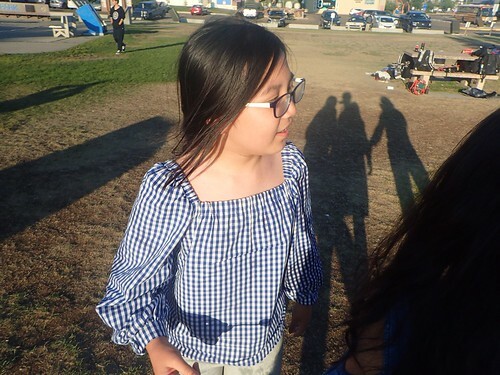 Little did they know….they had two more short lessons planned for the evening (which they enjoyed anyways). 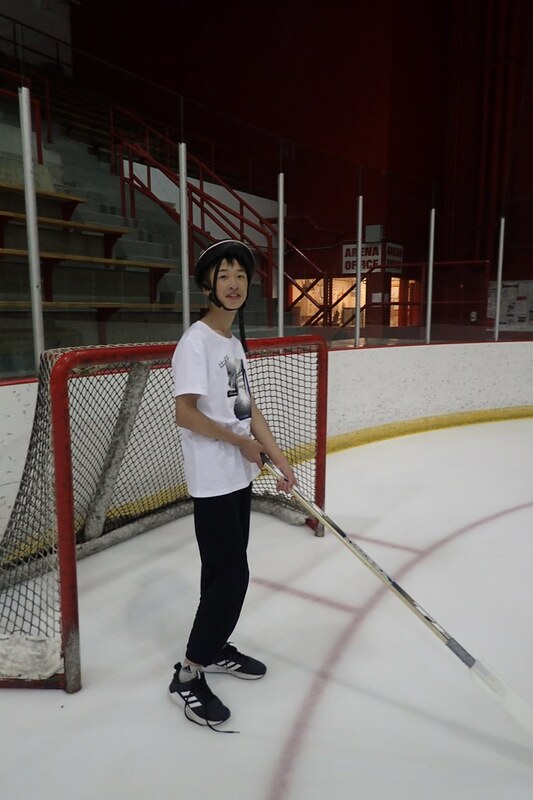 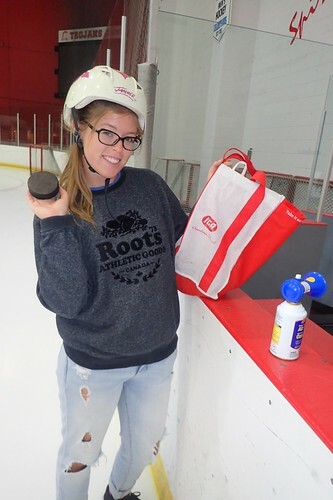 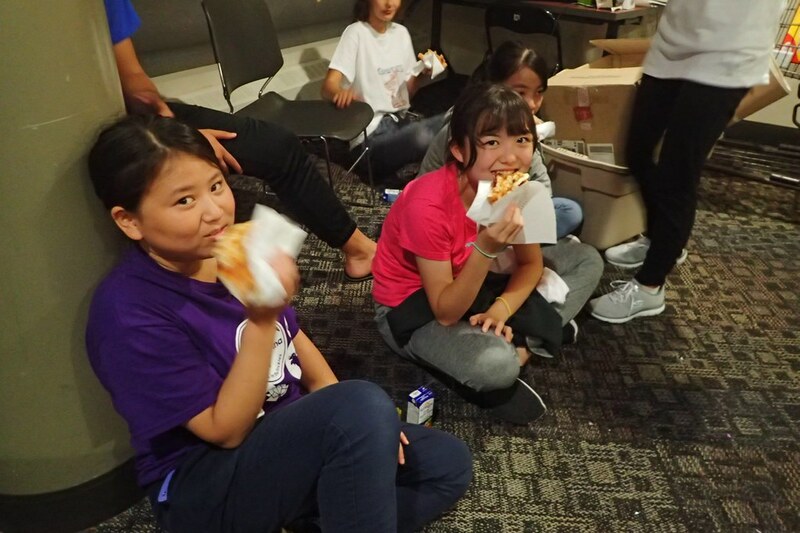 They later enjoyed a great and nutritious lunch and then they had to head on over quickly to the SAIT rink to play some hockey. 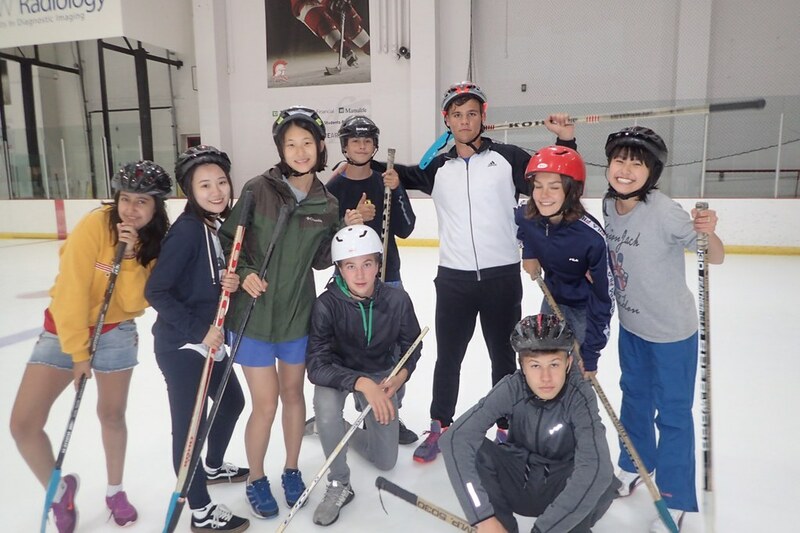 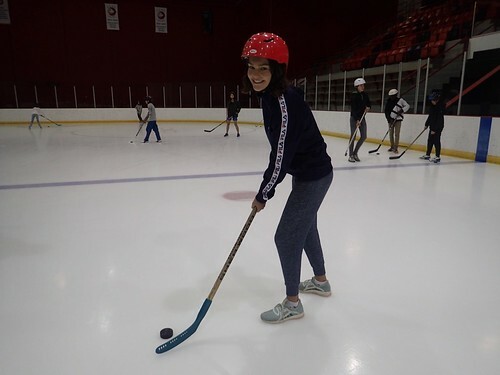 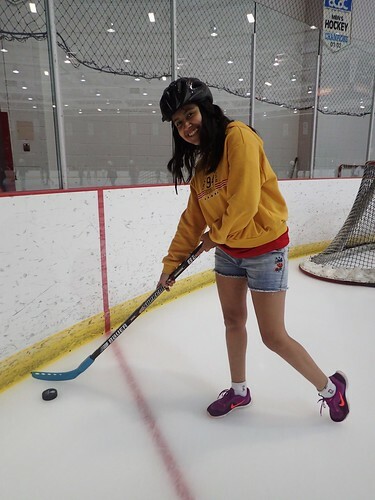 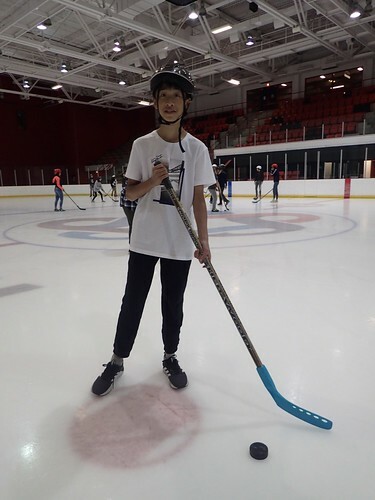 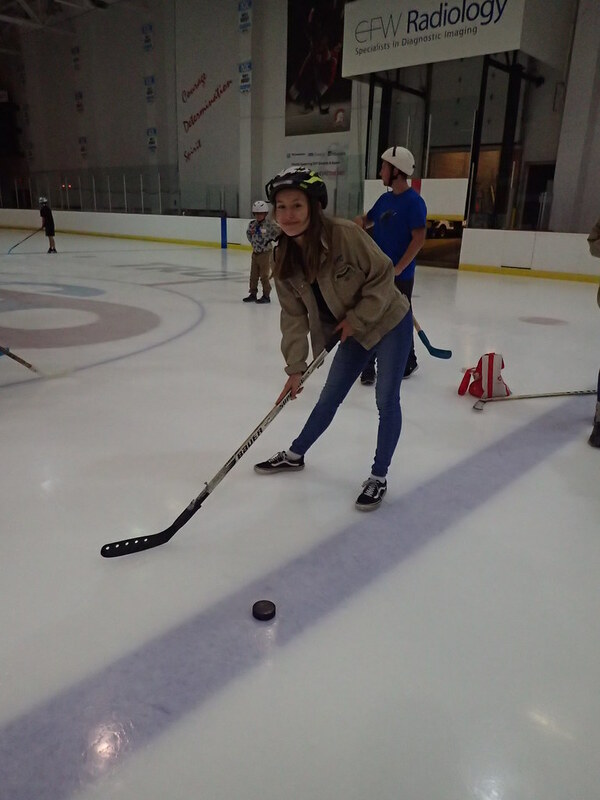 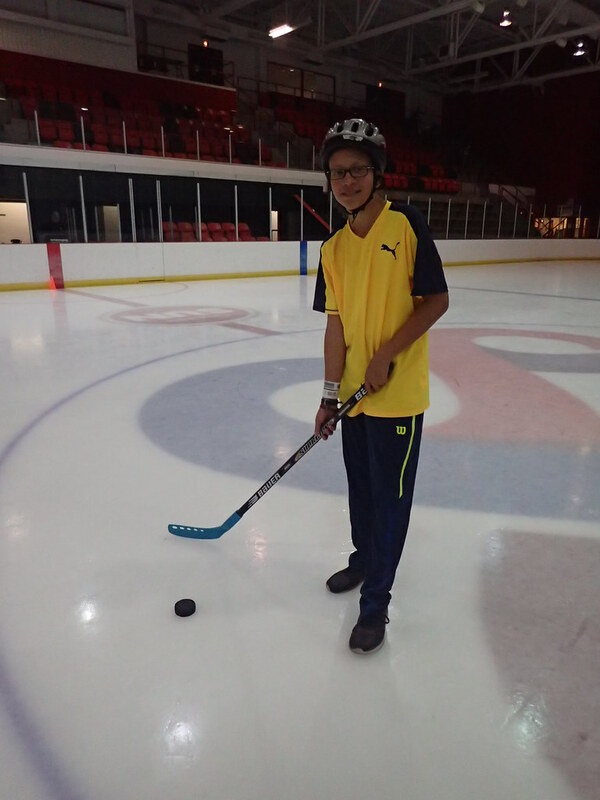 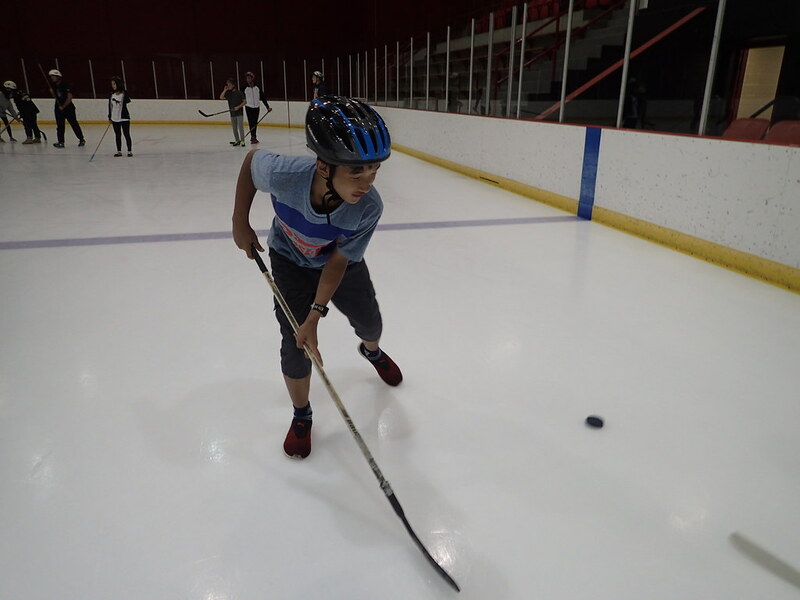 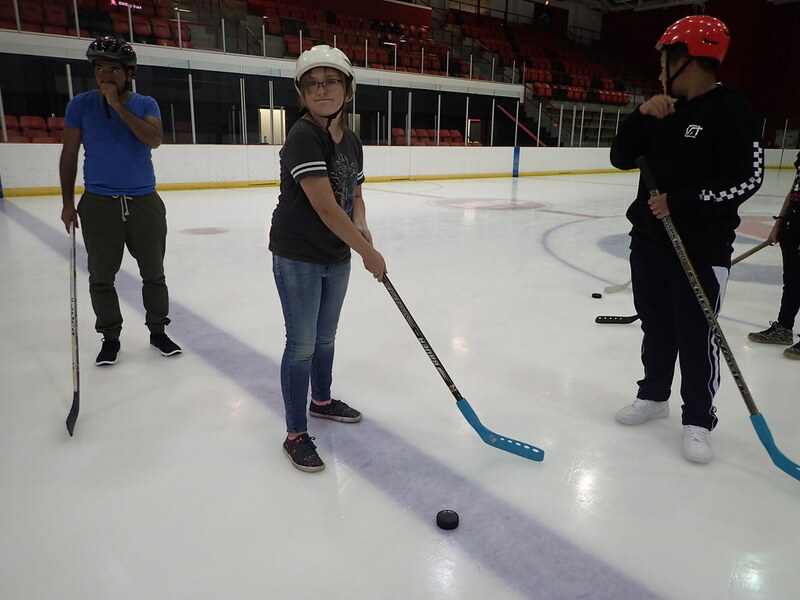 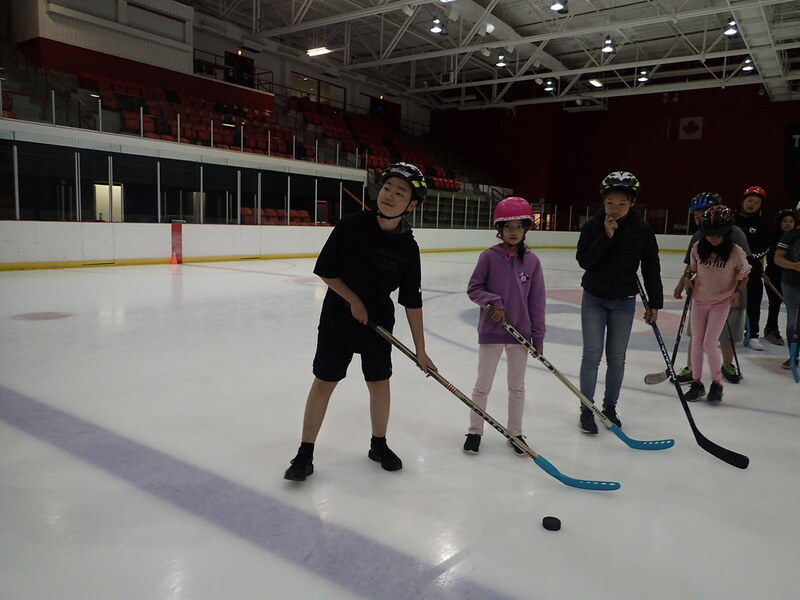 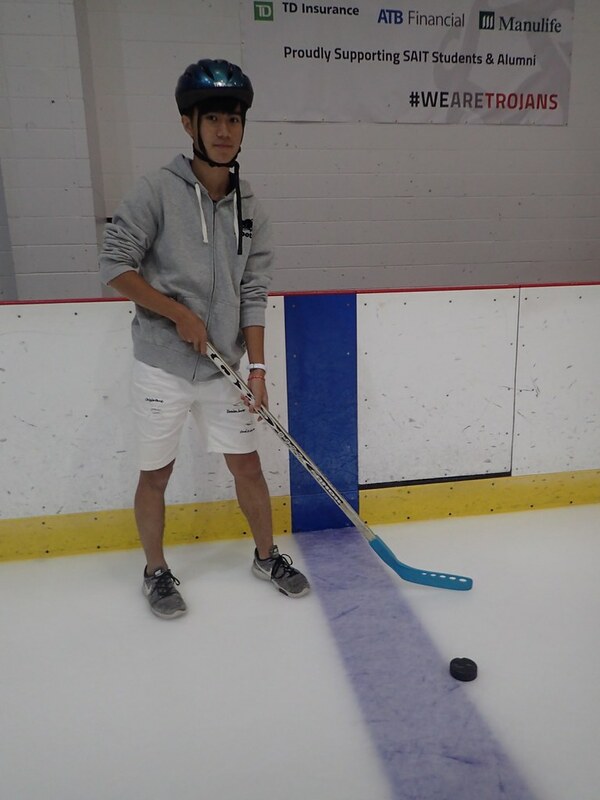 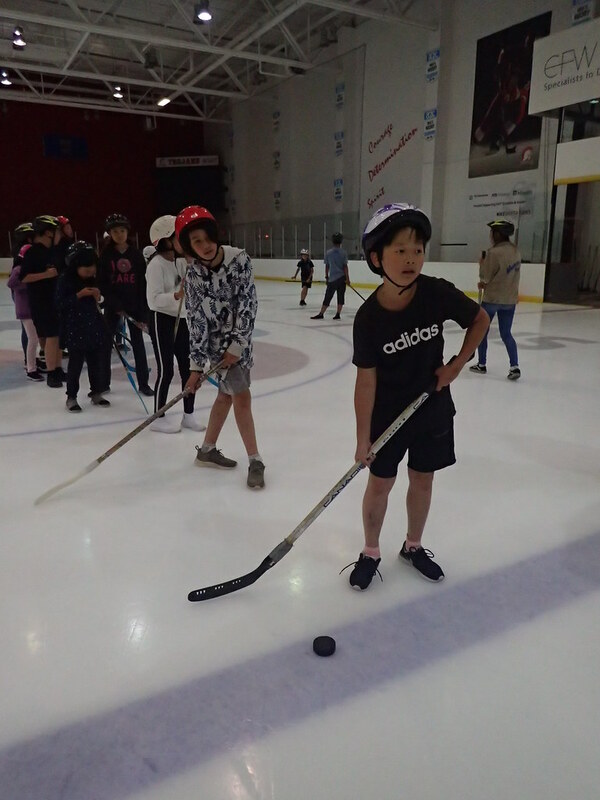 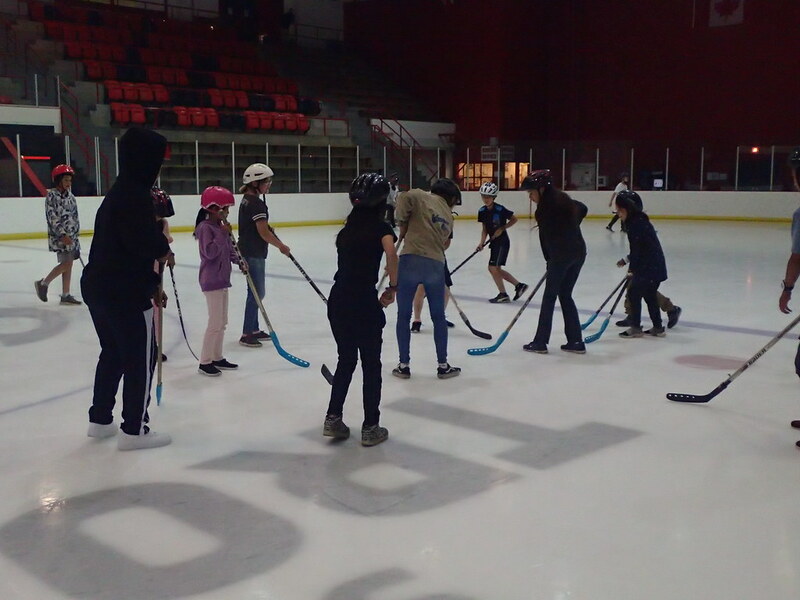 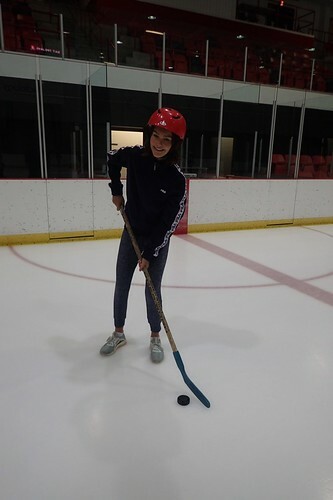 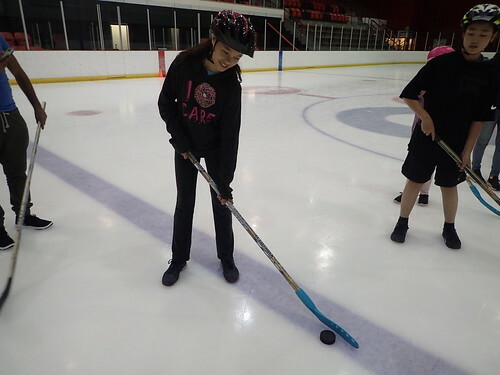 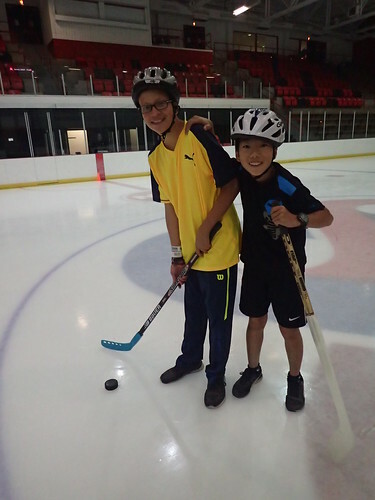 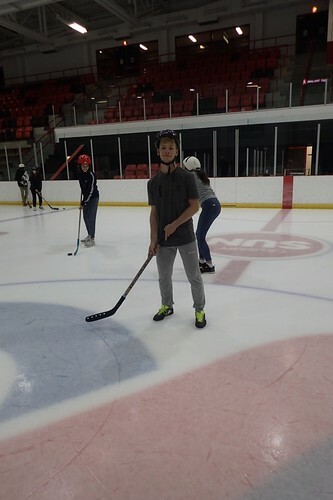 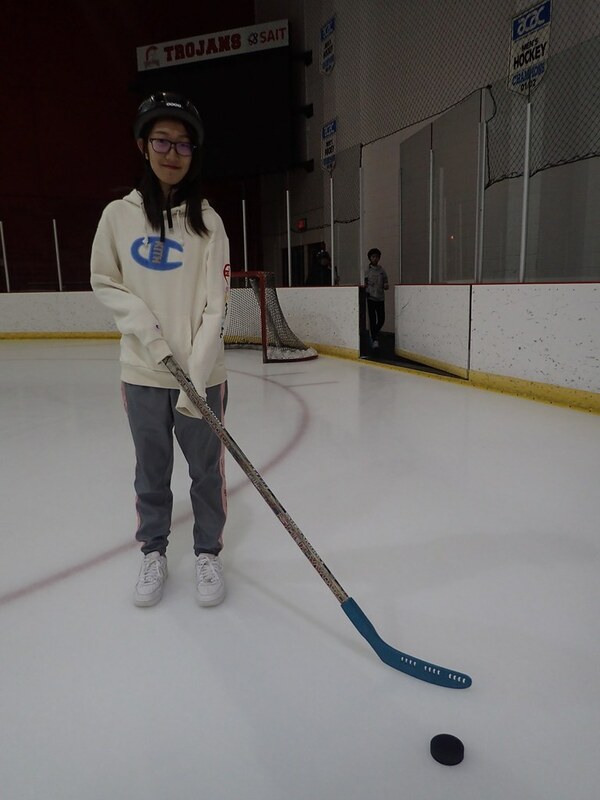 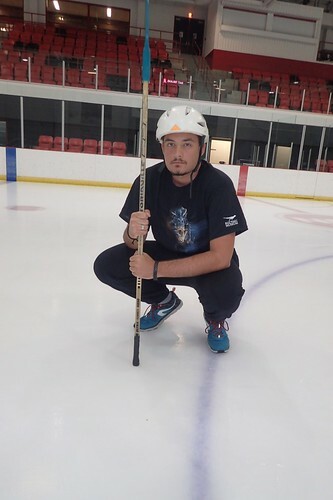 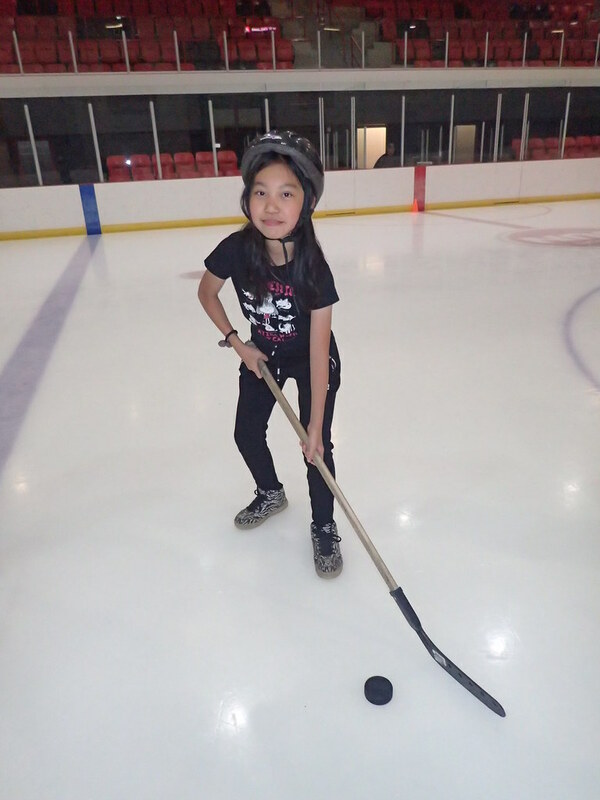 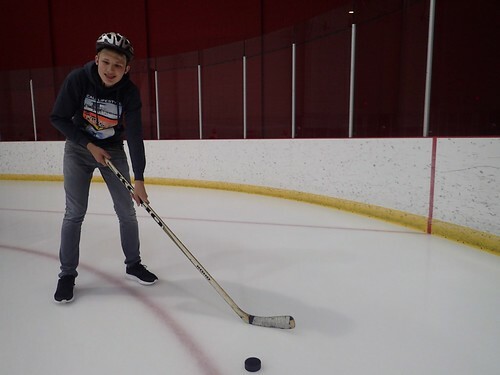 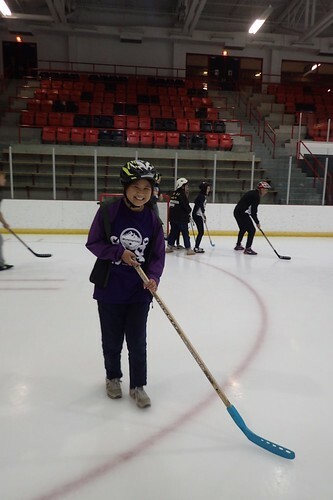 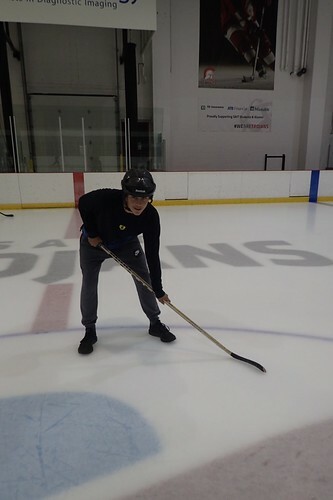 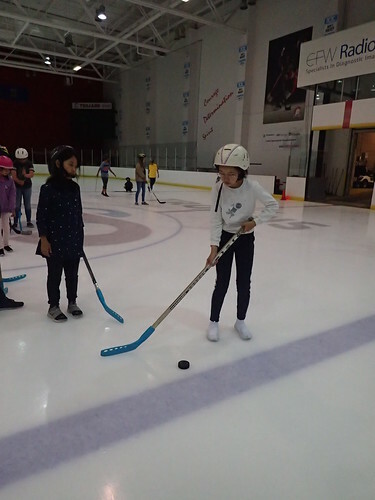 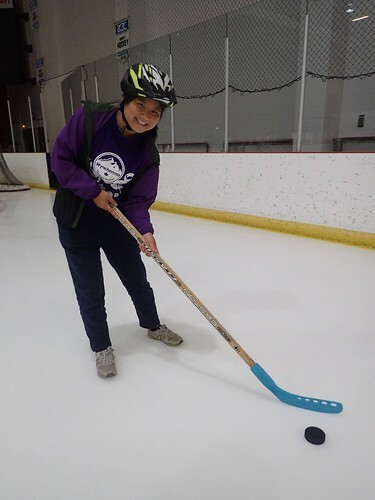 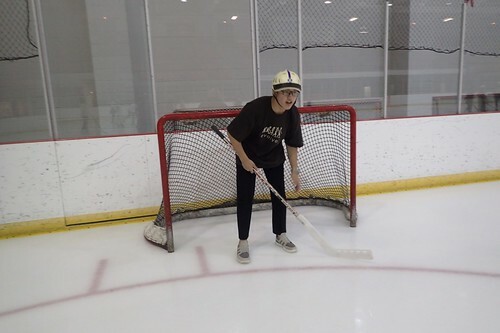 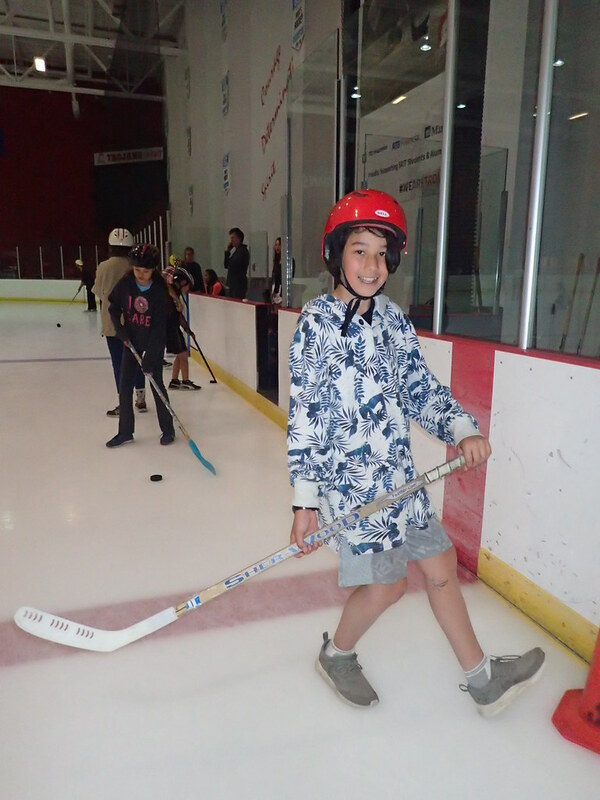 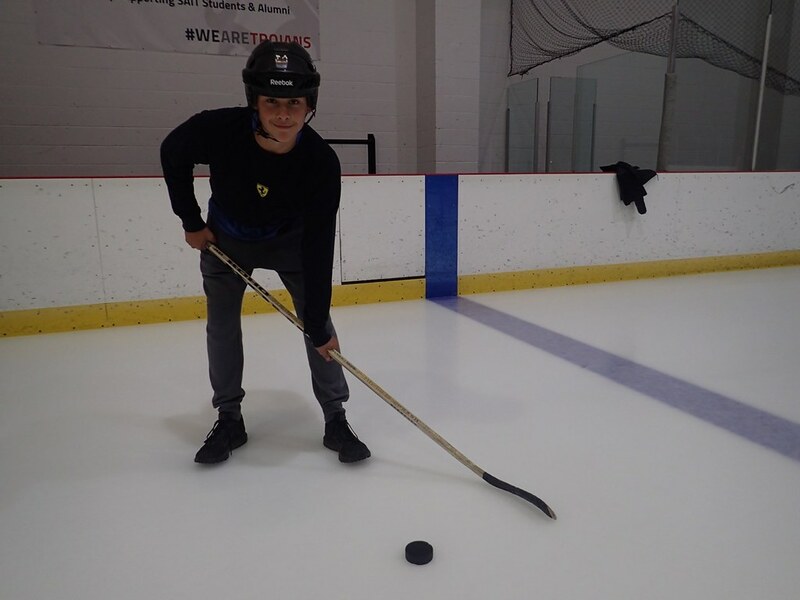 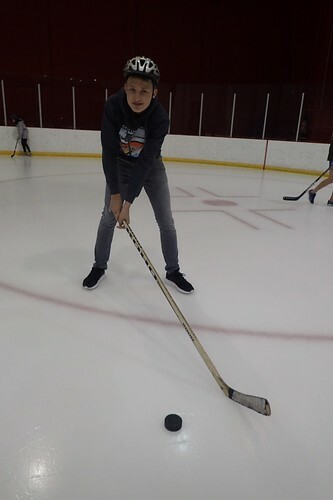 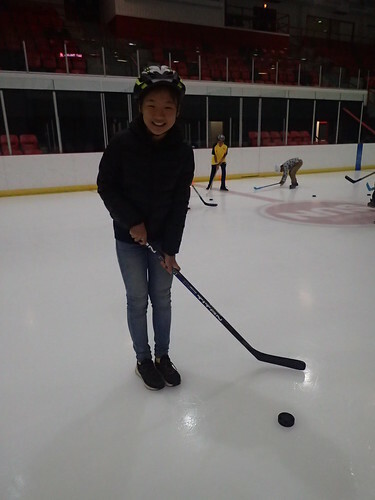 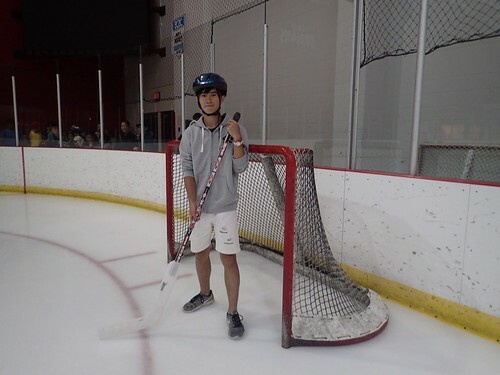 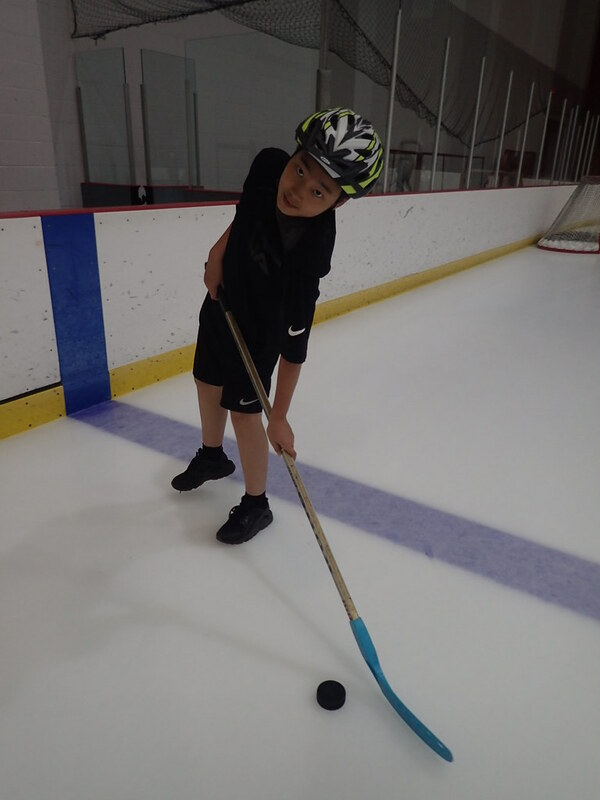 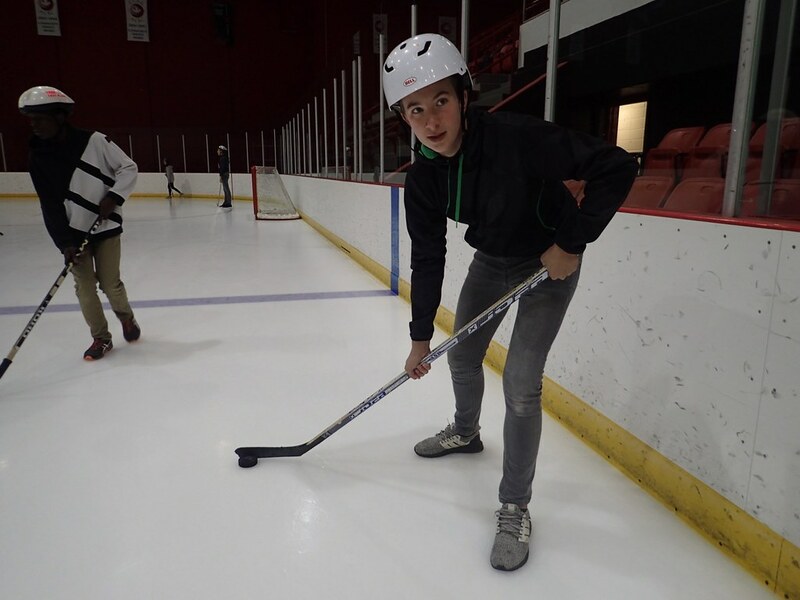 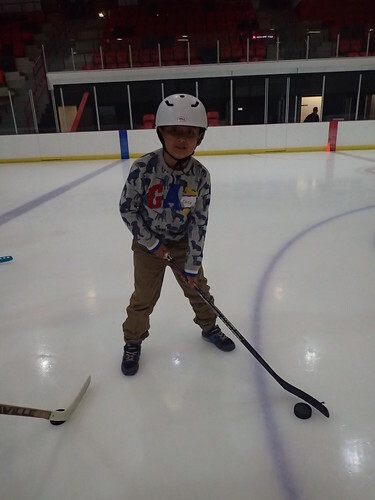 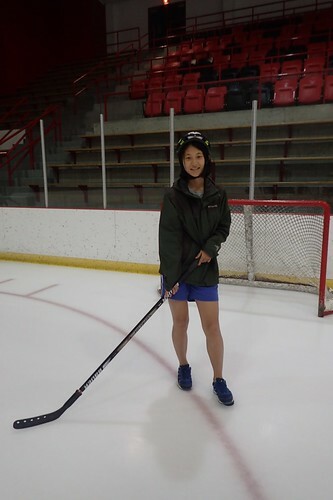 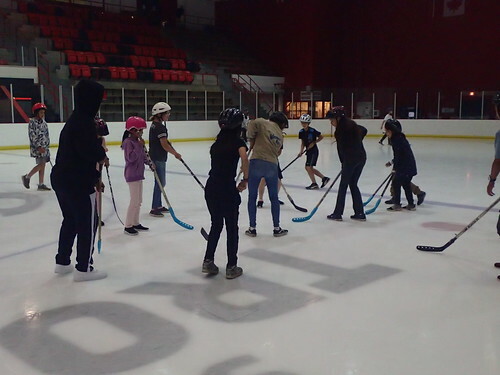 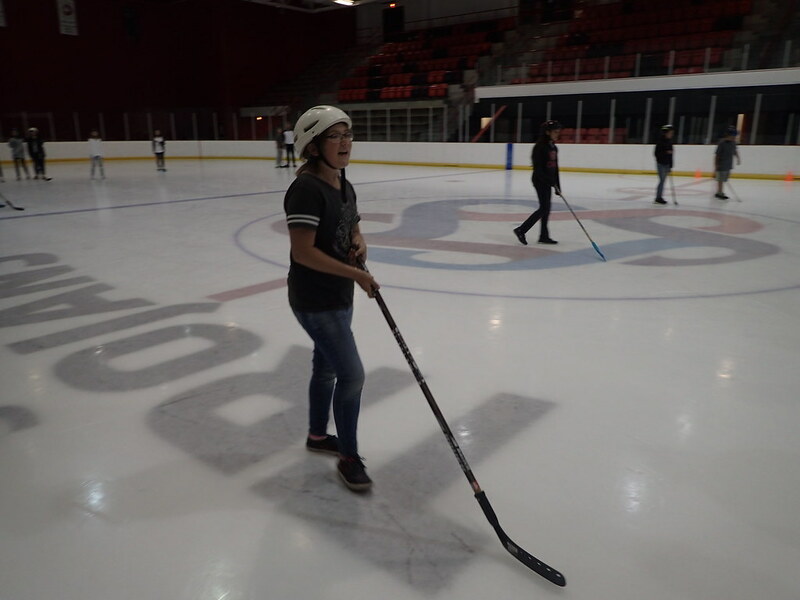 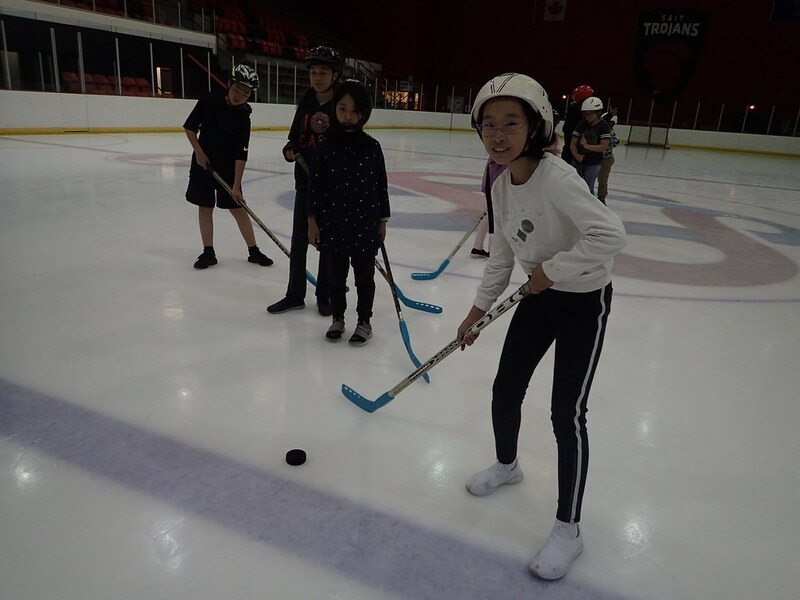 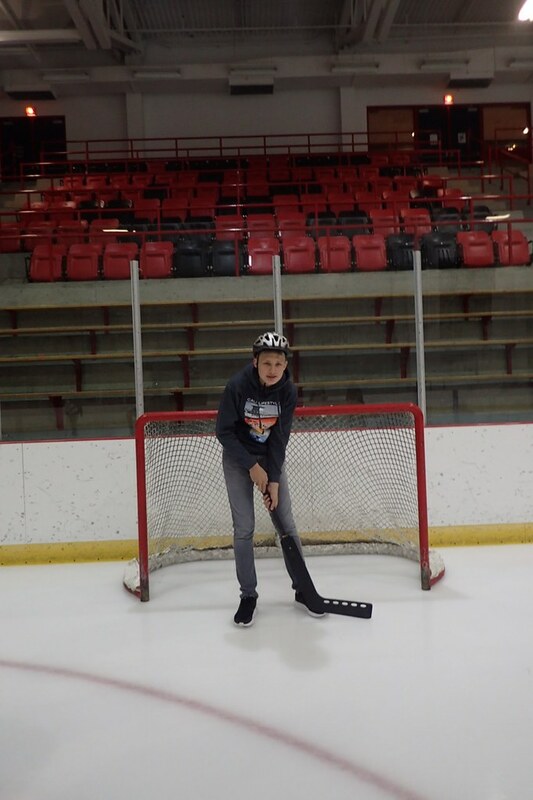 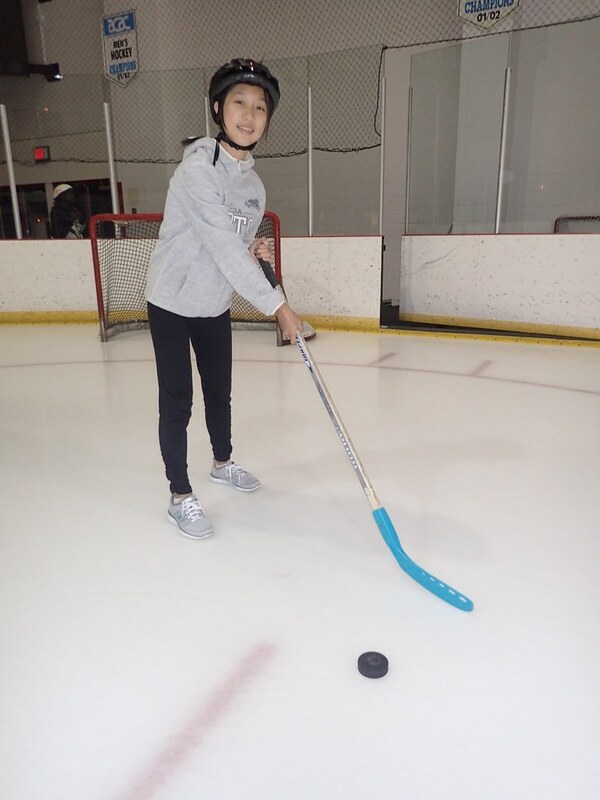 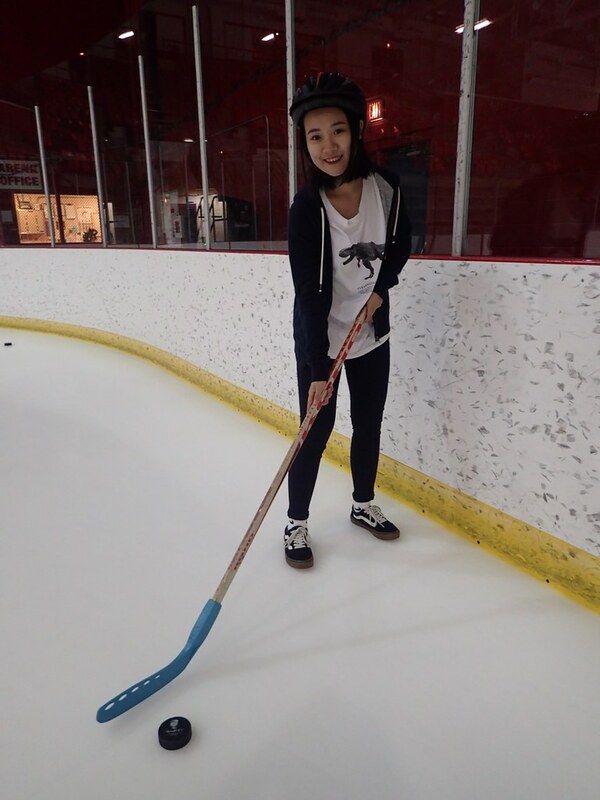 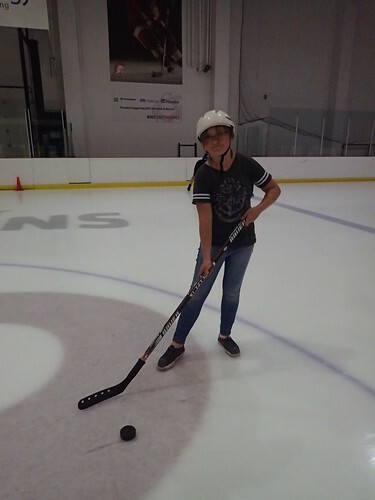 They learnt about hockey, practiced some hockey essentials like passing and shooting and so much more! 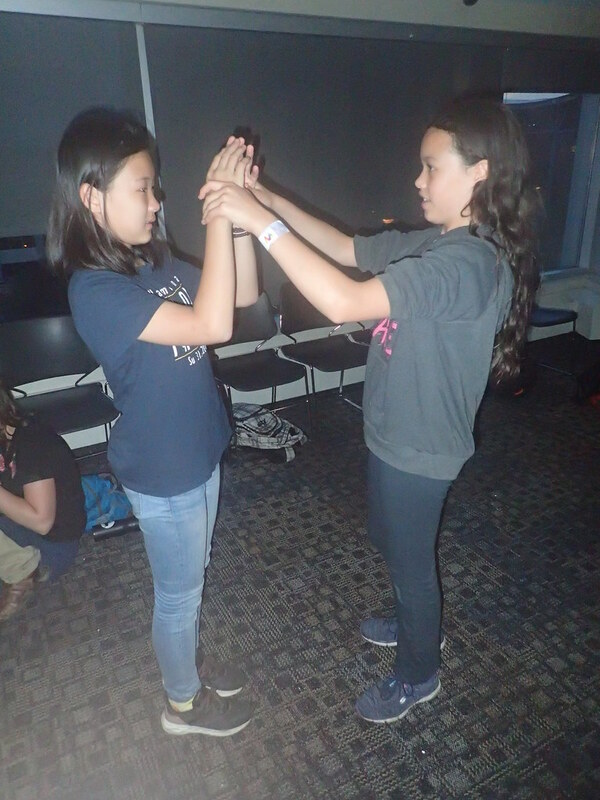 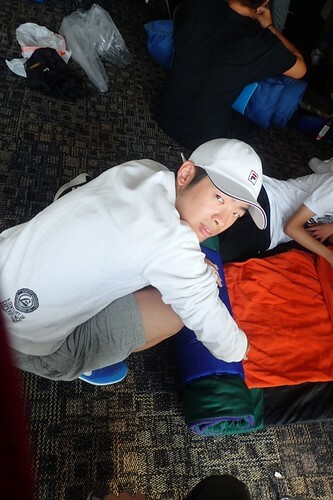 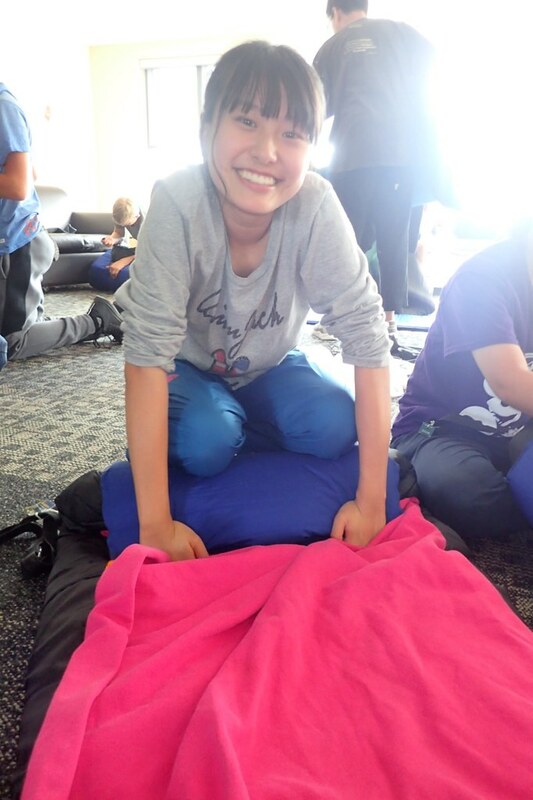 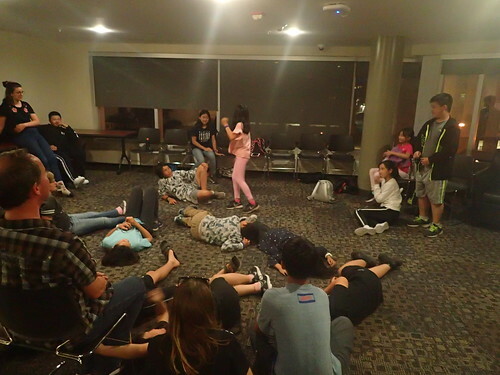 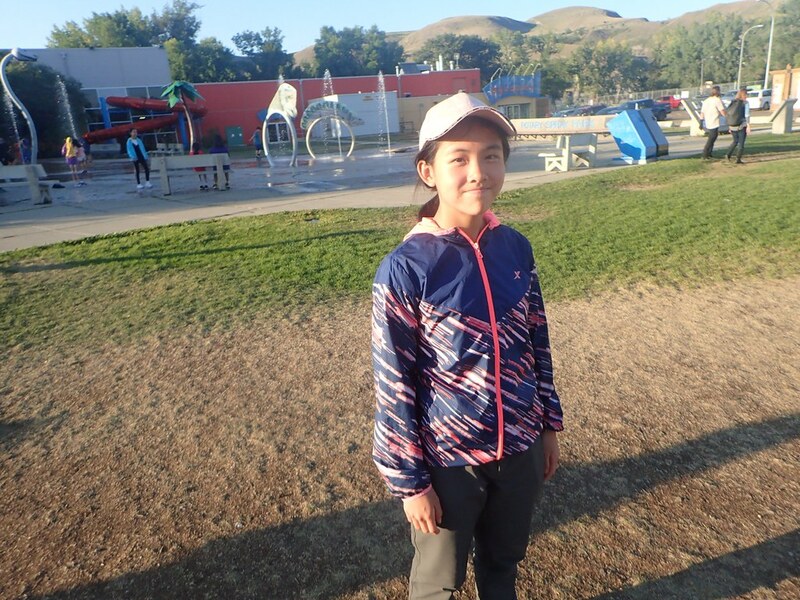 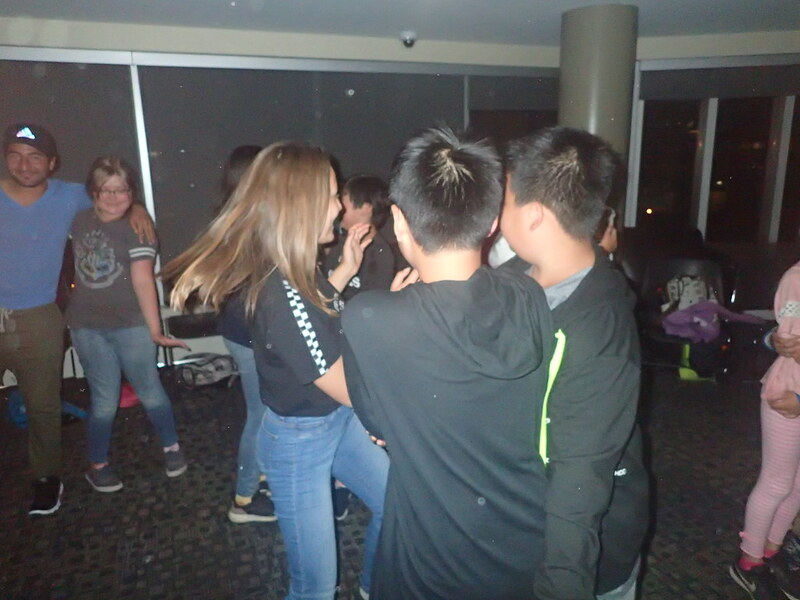 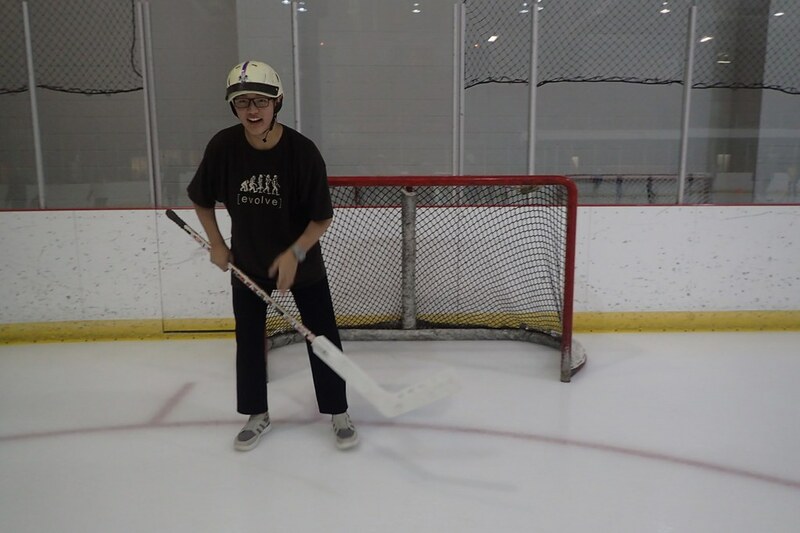 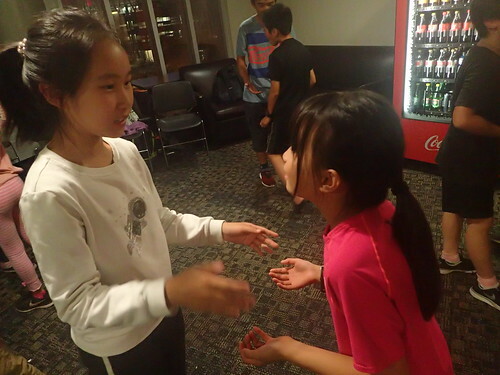 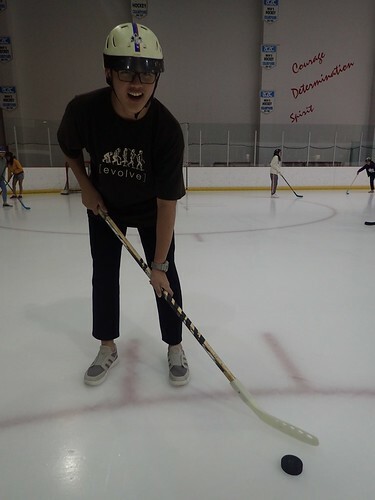 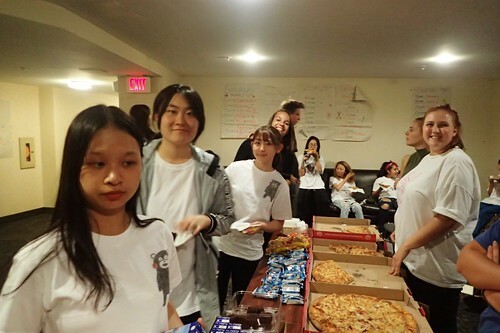 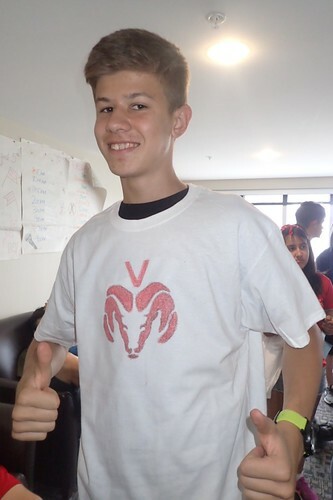 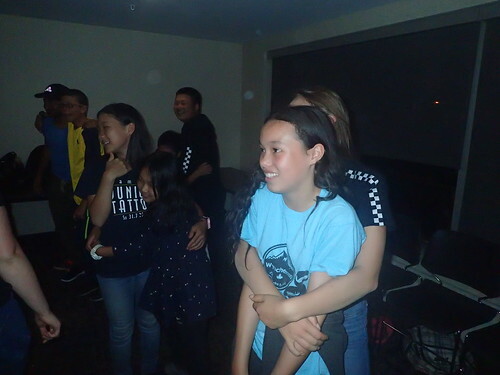 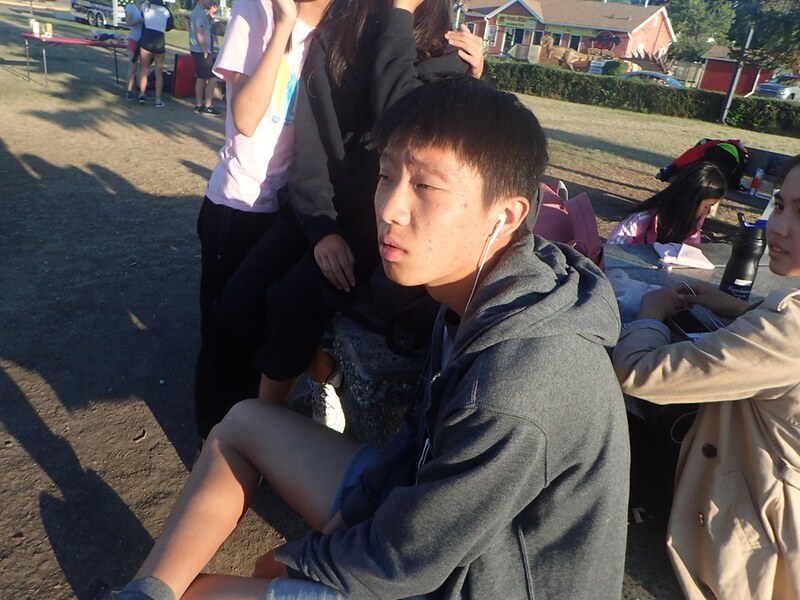 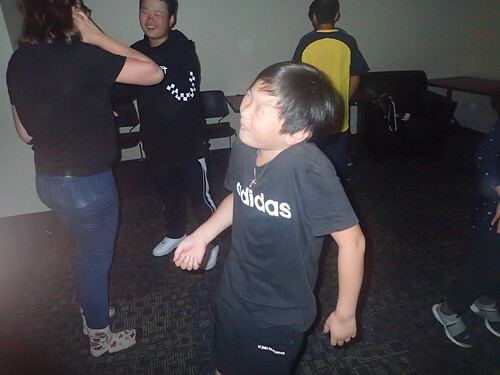 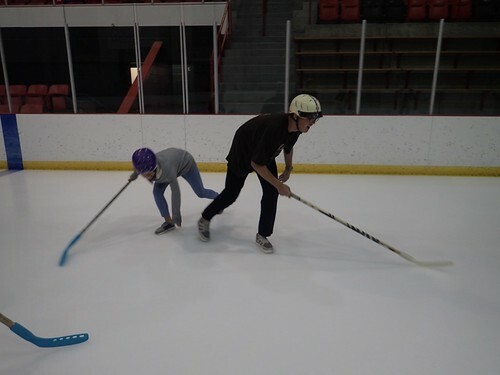 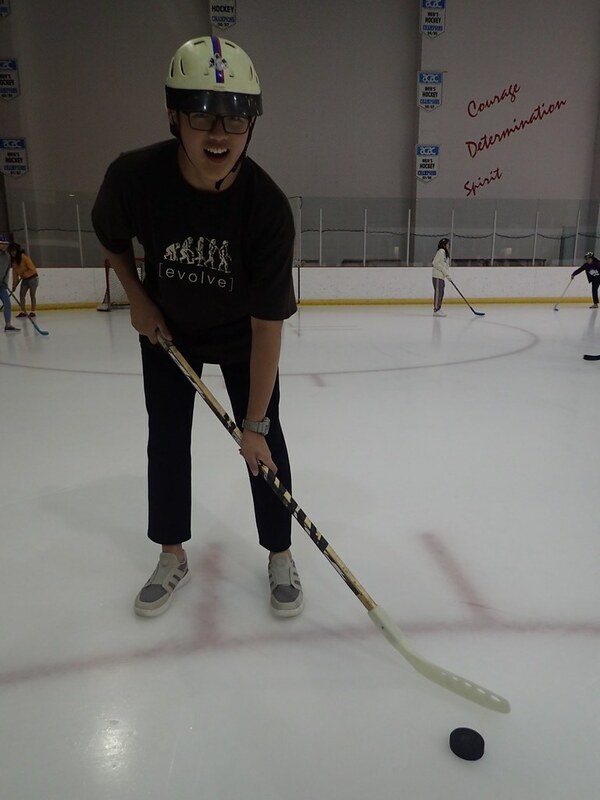 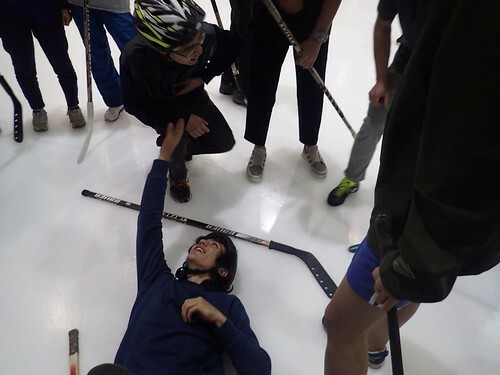 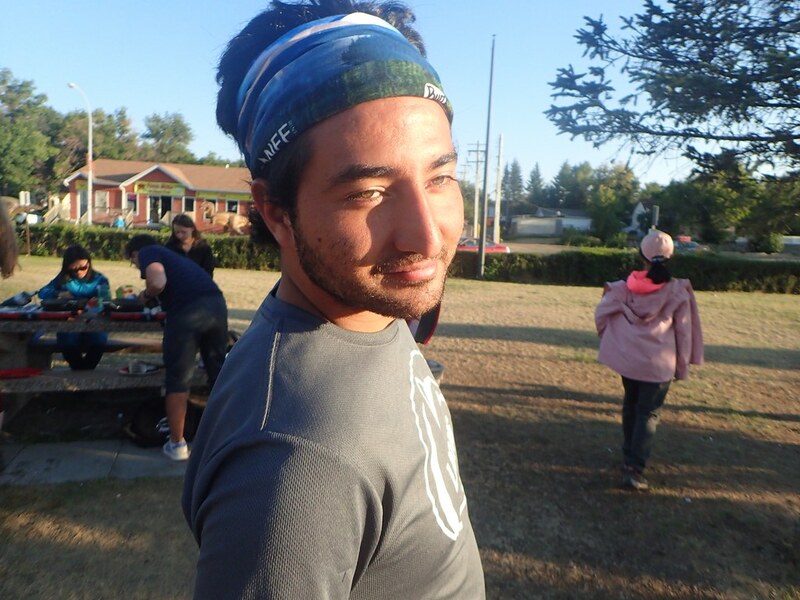 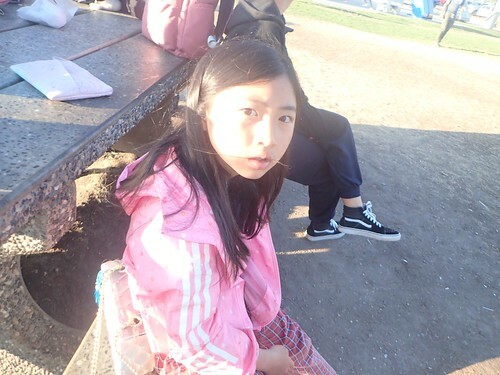 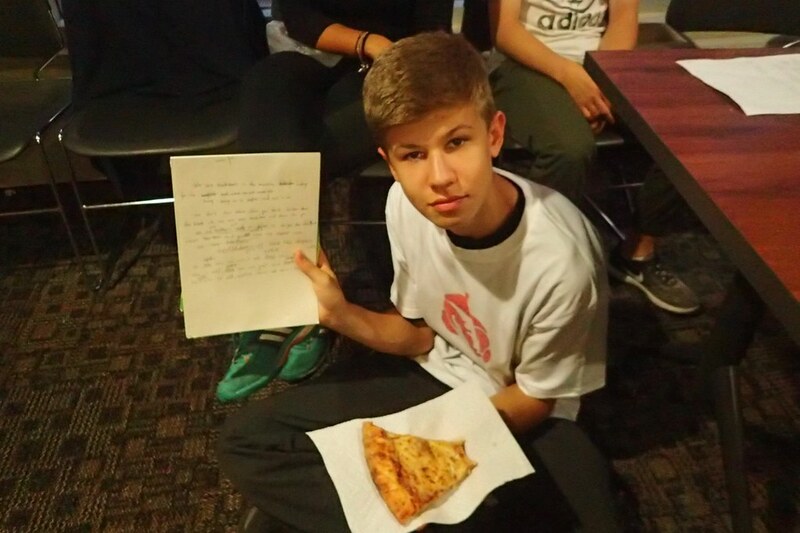 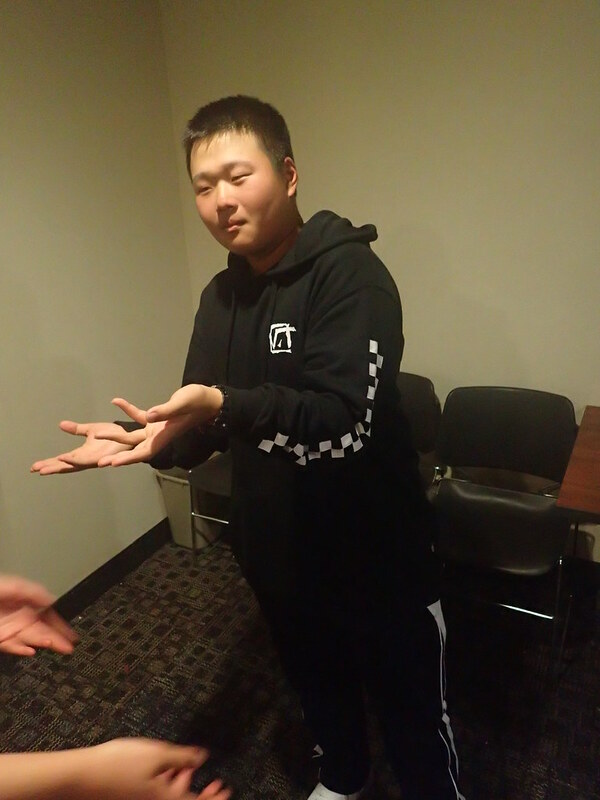 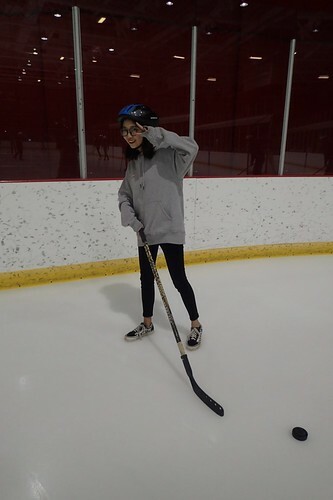 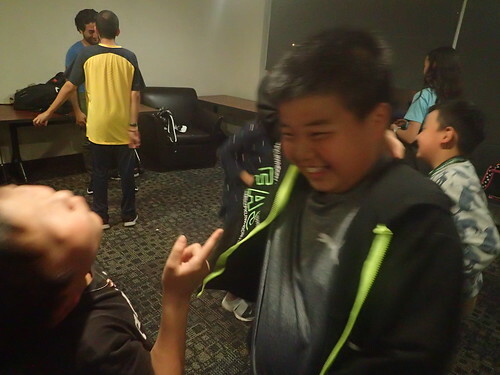 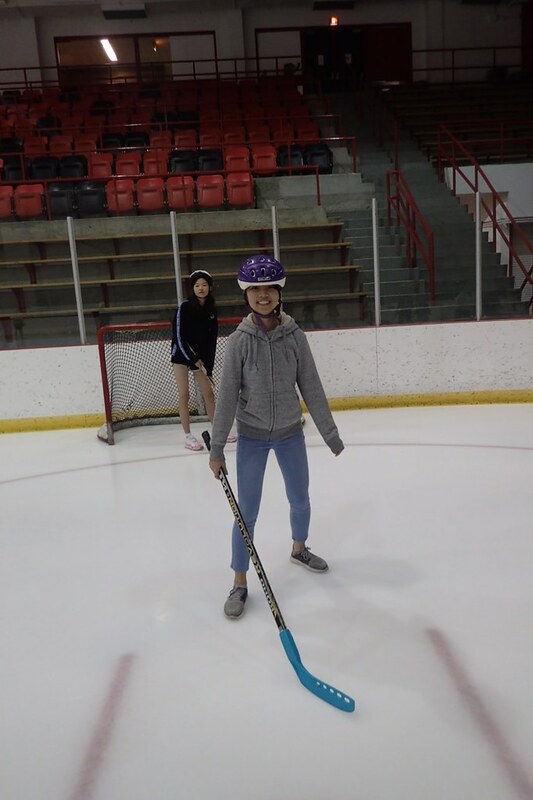 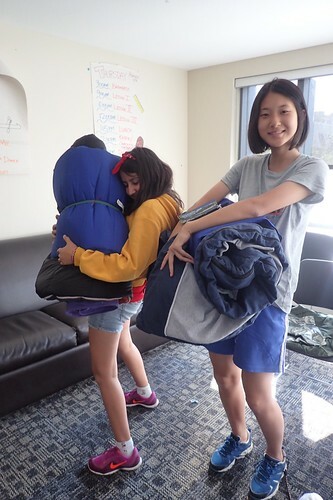 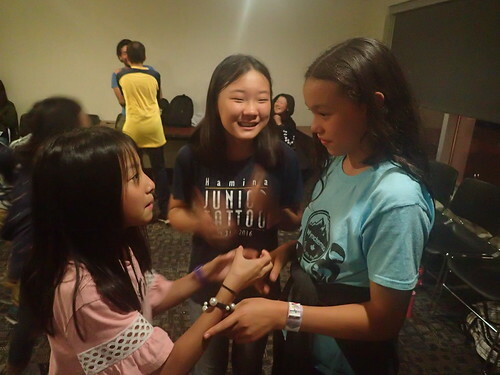 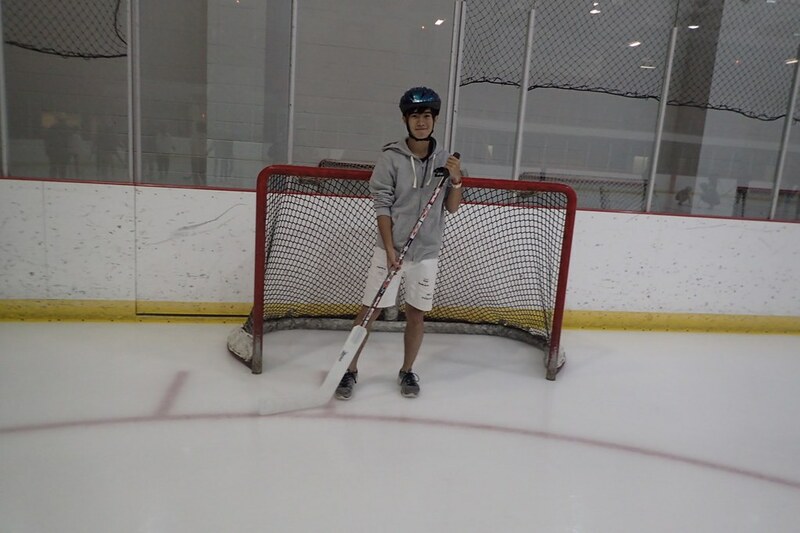 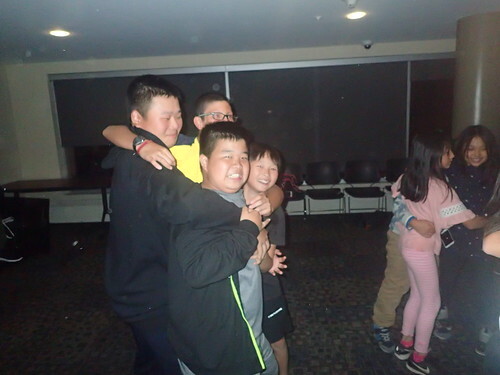 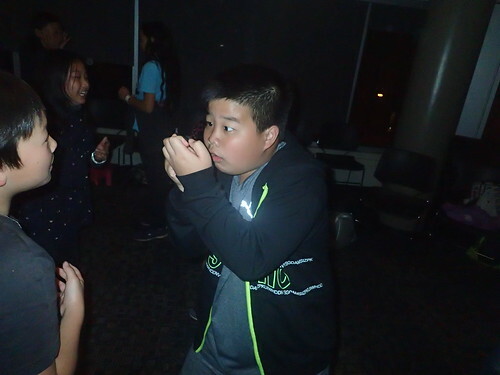 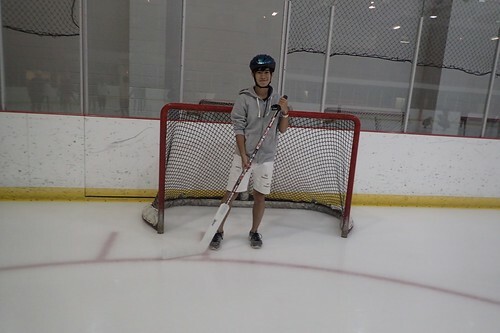 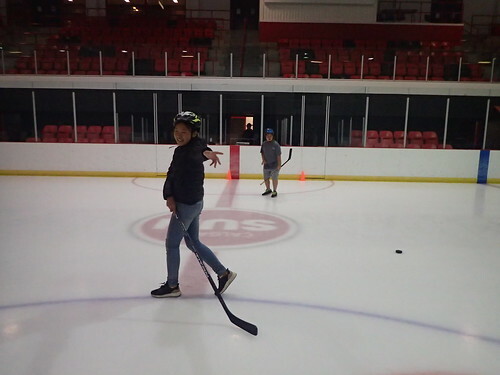 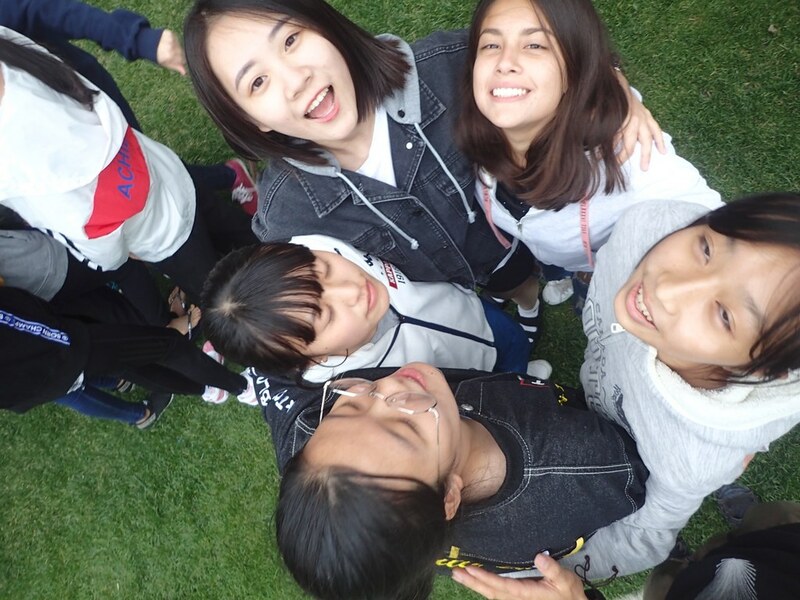 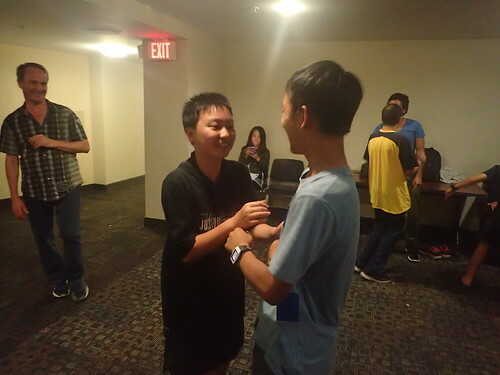 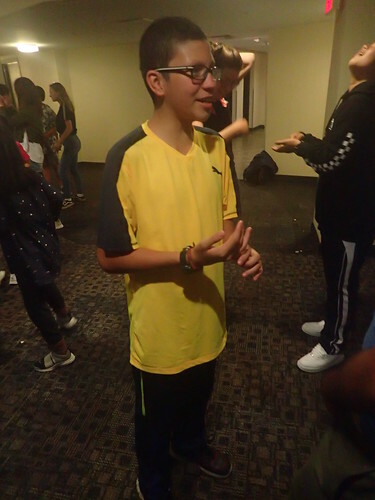 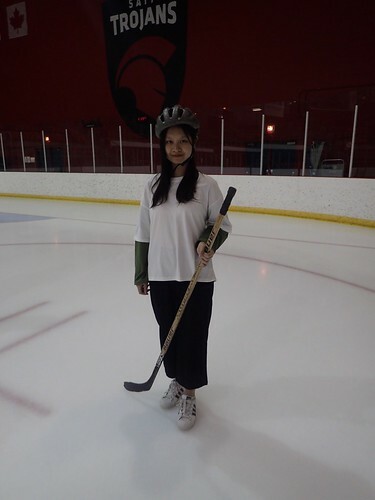 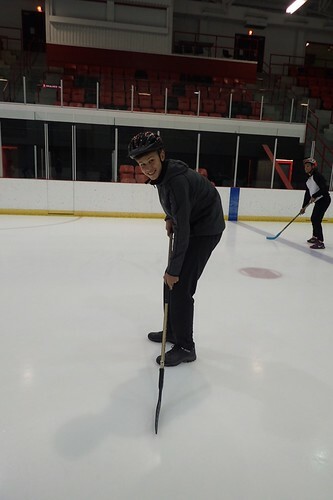 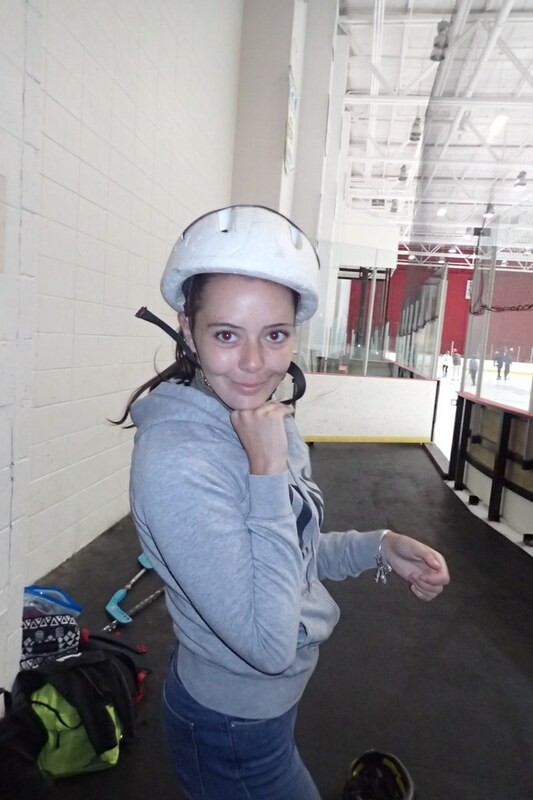 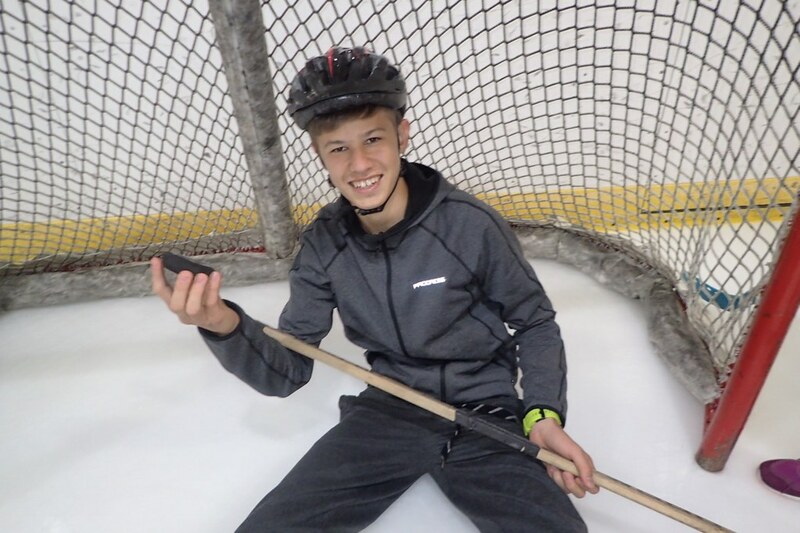 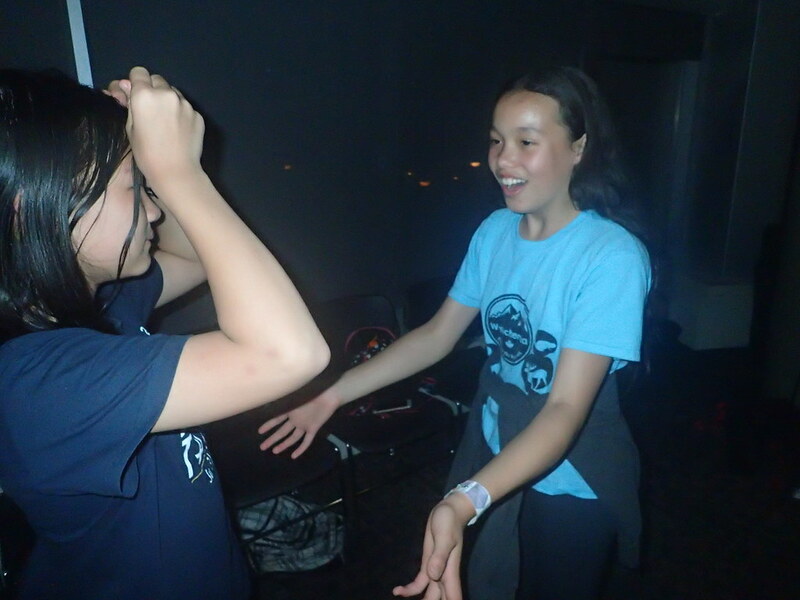 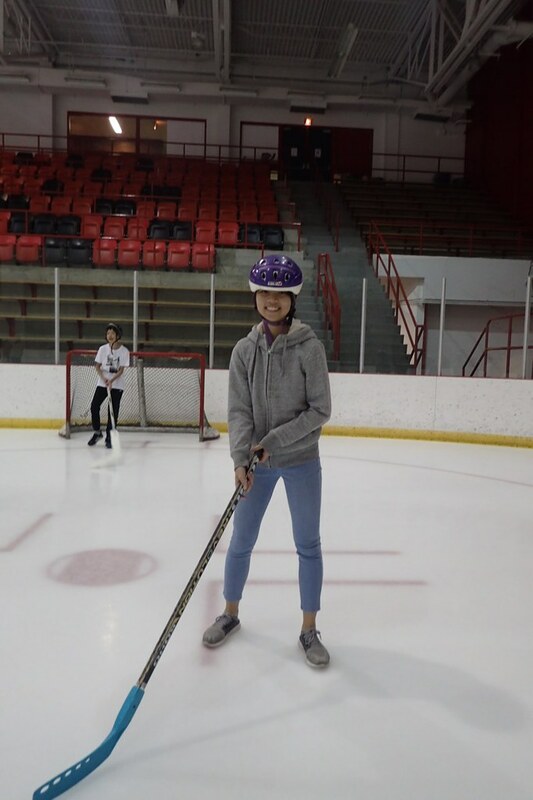 After hockey, the students had another surprising activity planned. The teachers had promised them to take them ice skating since they hadn’t had the chance yet. 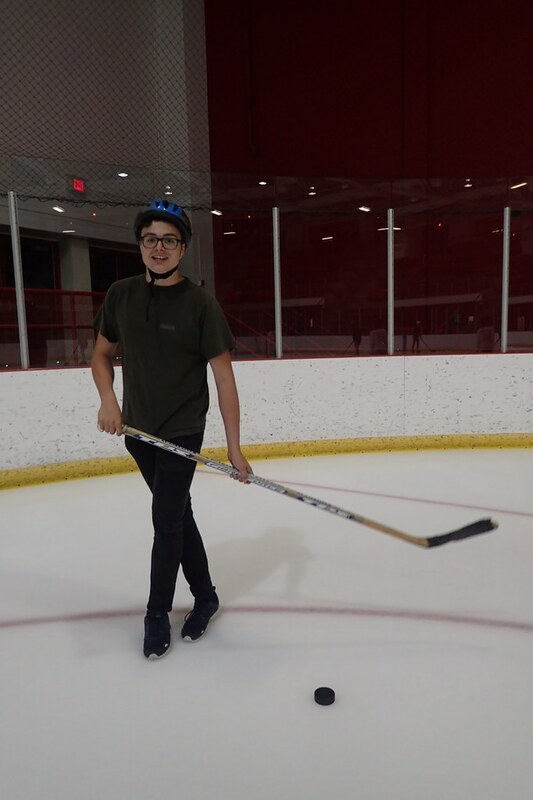 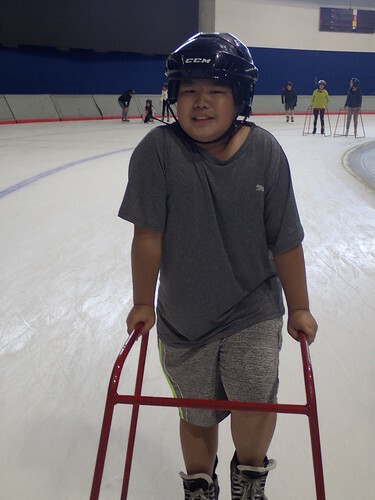 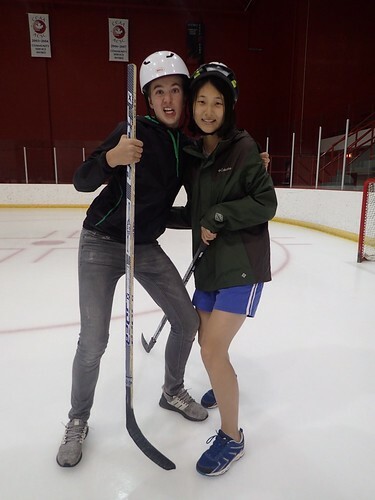 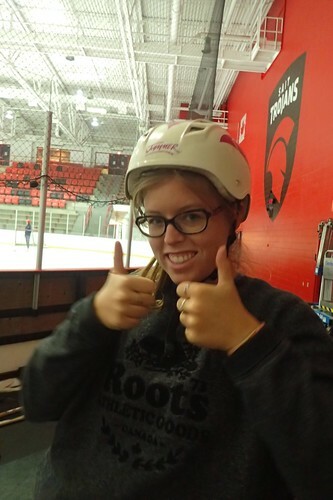 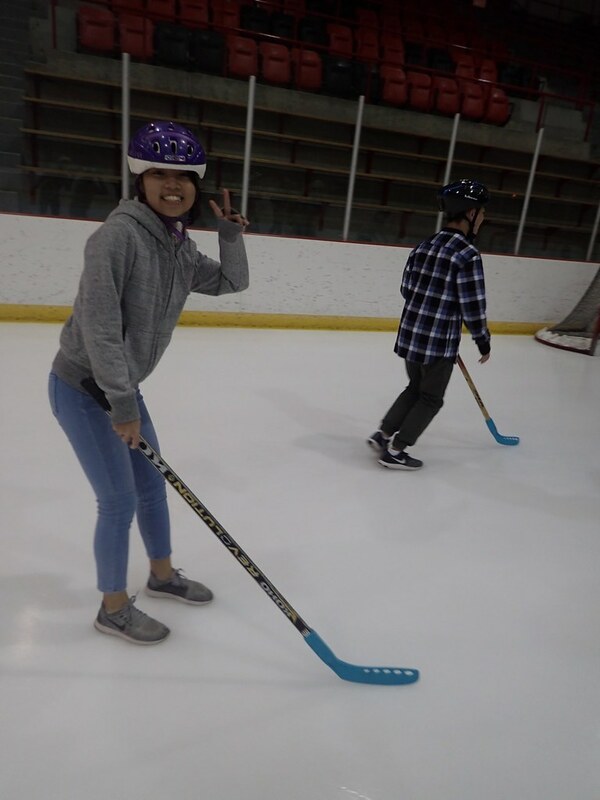 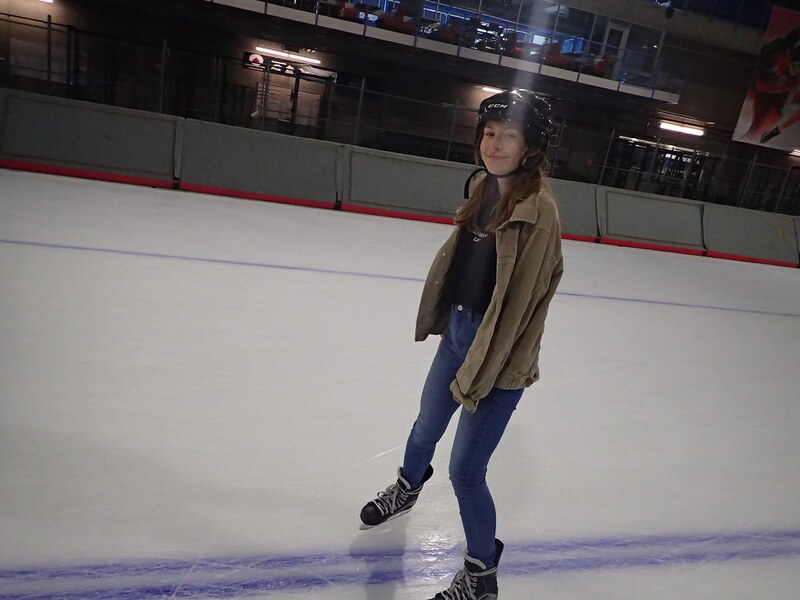 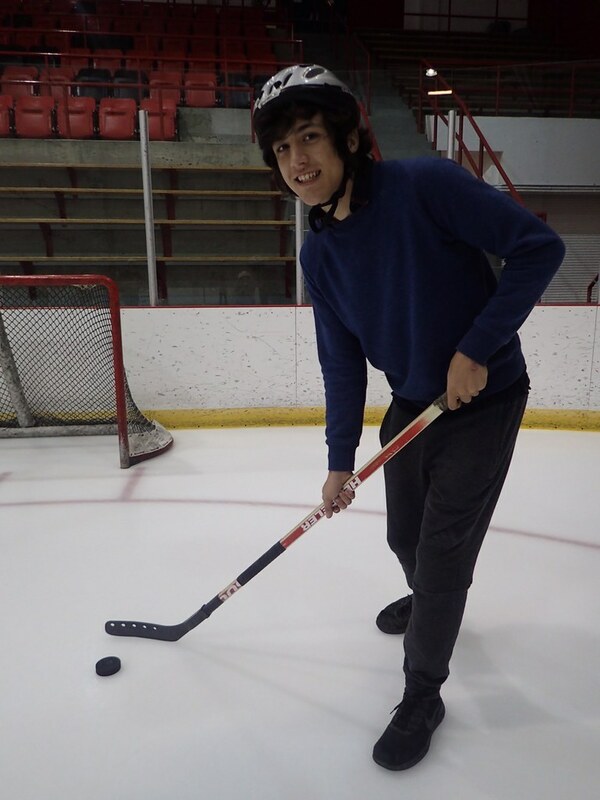 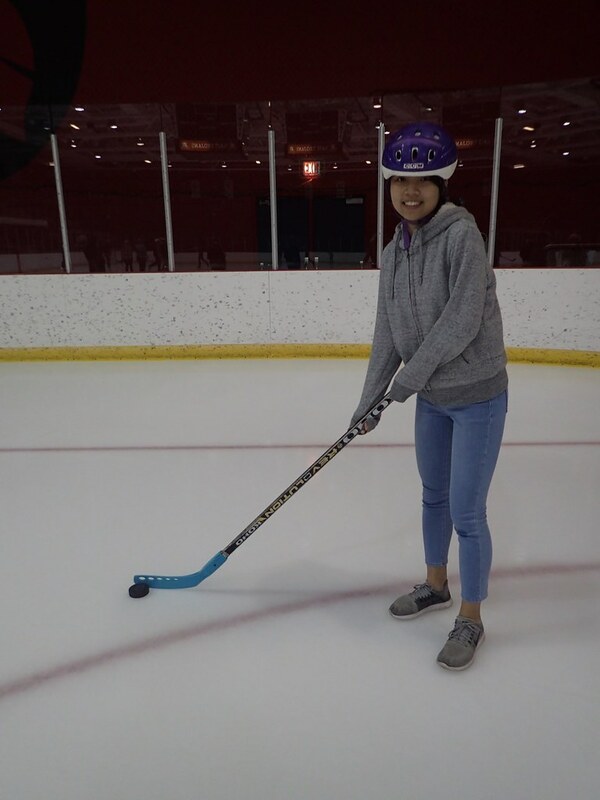 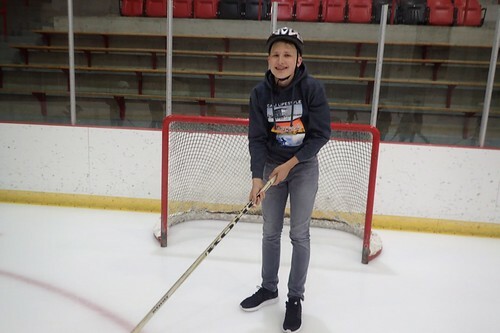 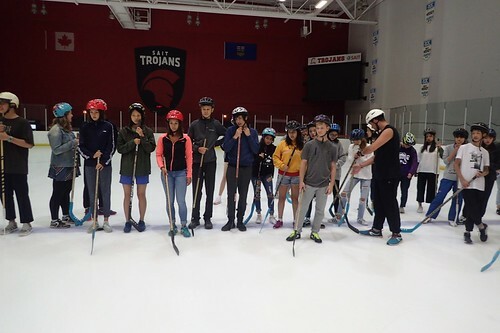 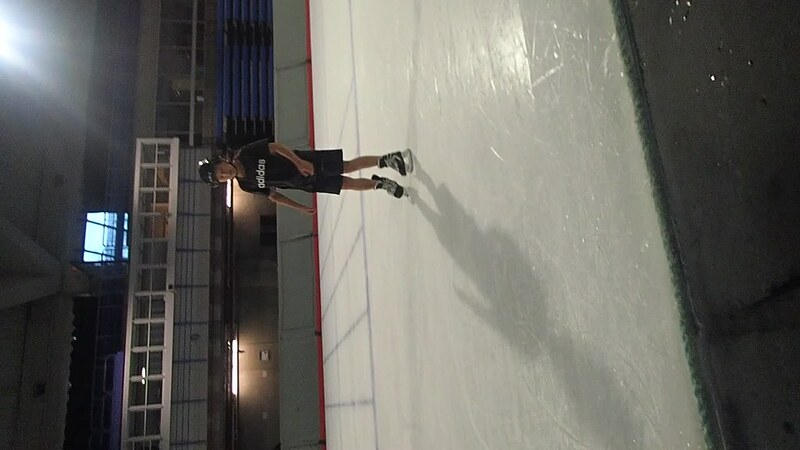 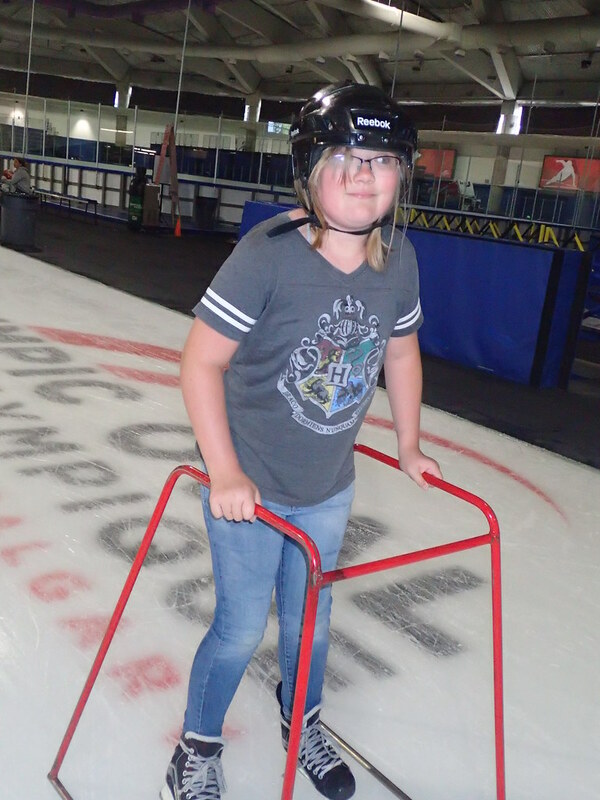 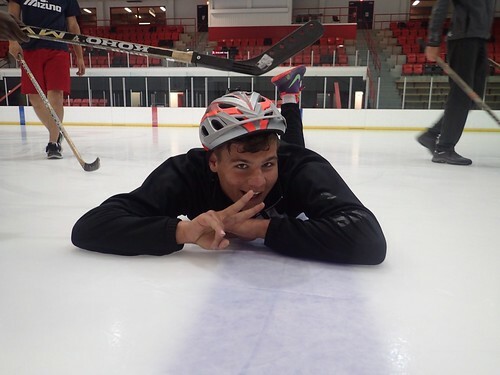 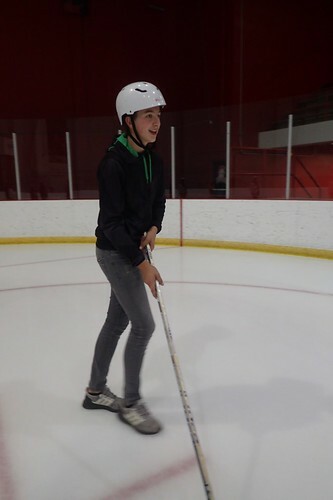 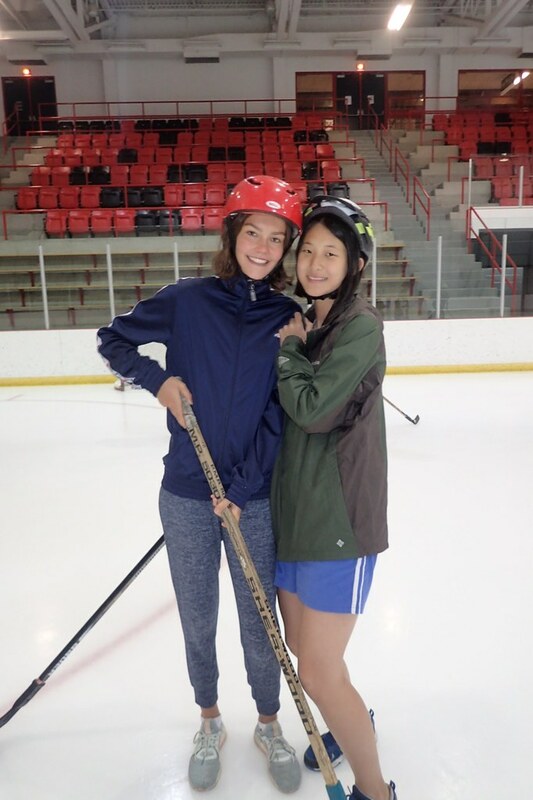 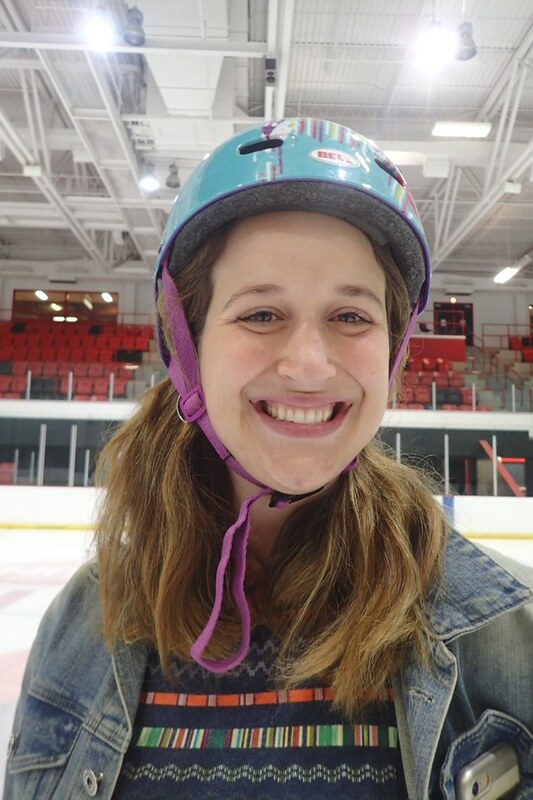 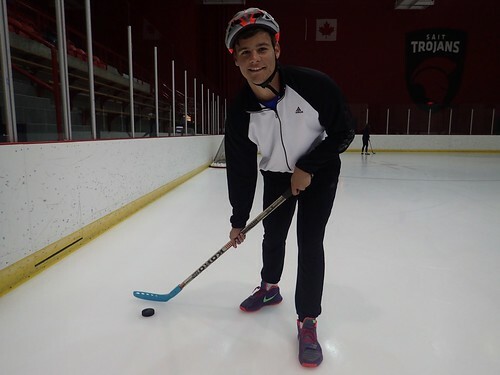 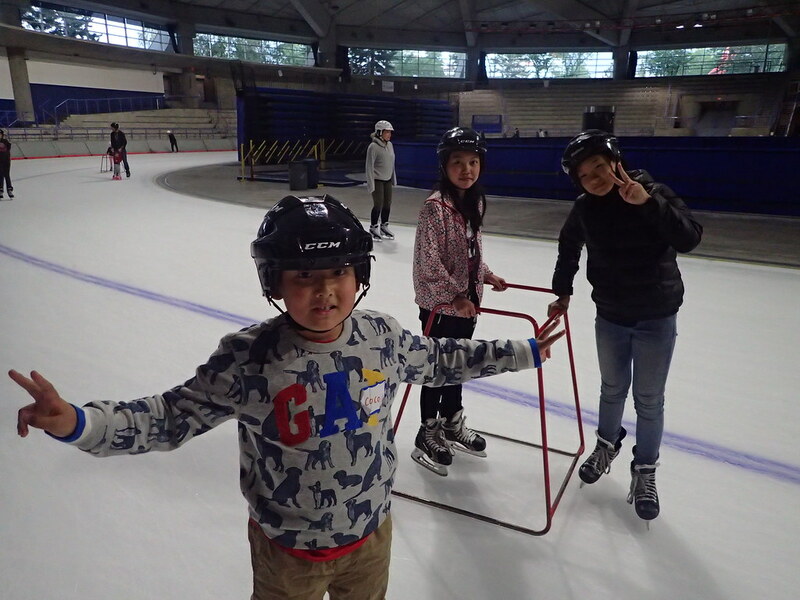 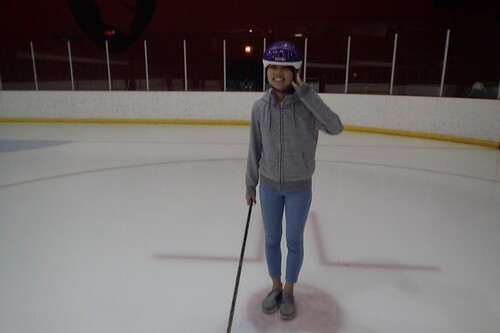 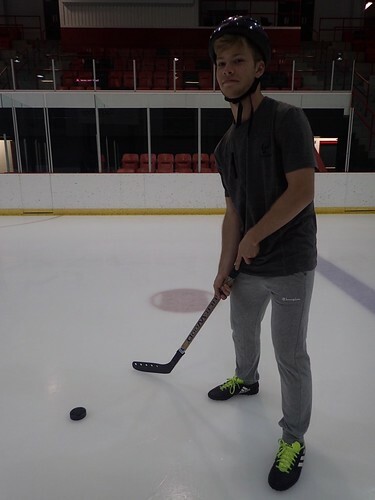 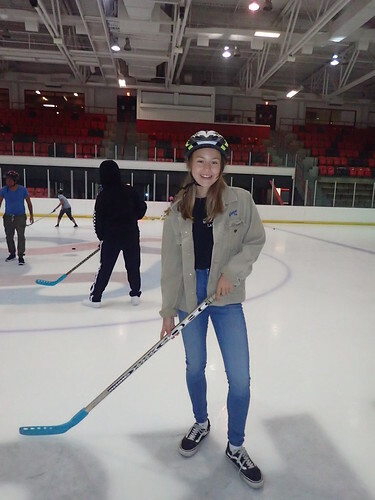 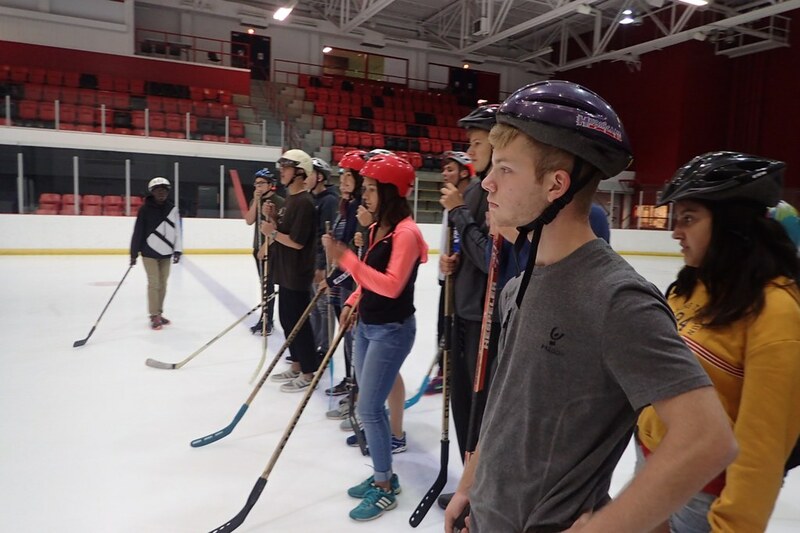 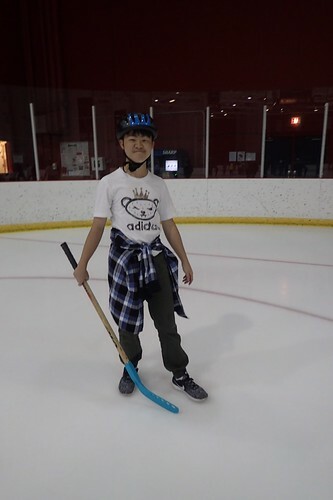 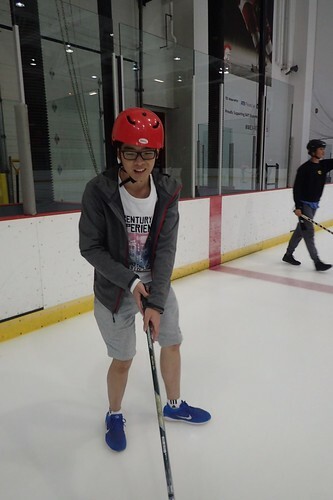 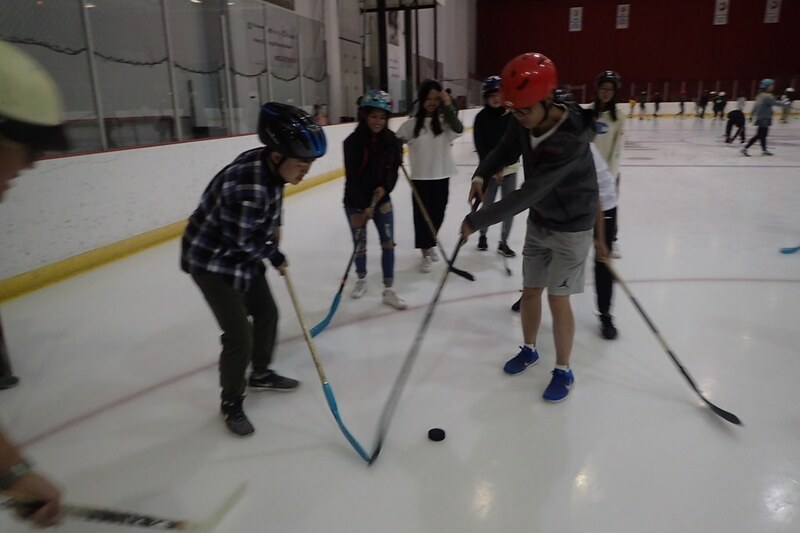 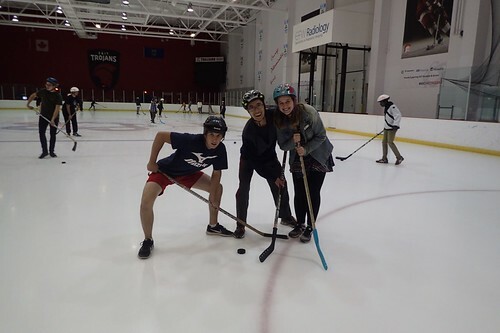 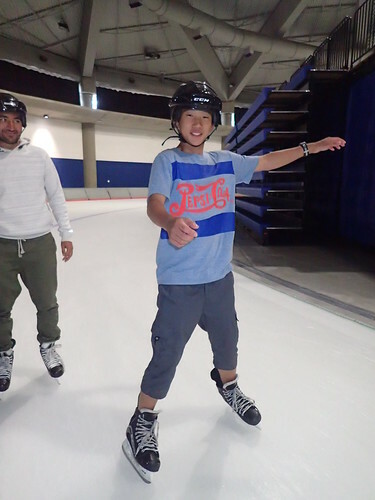 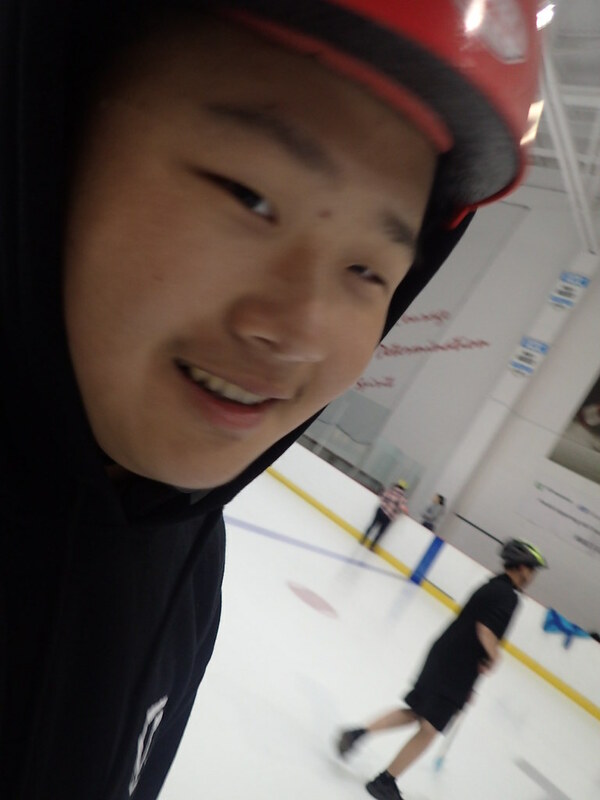 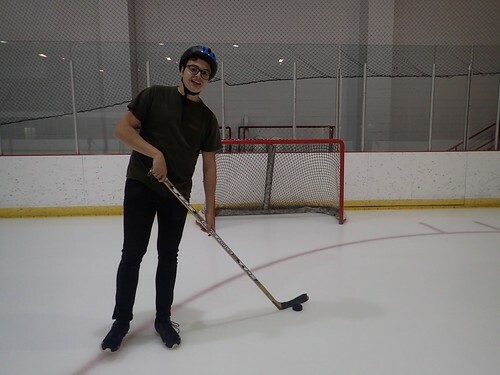 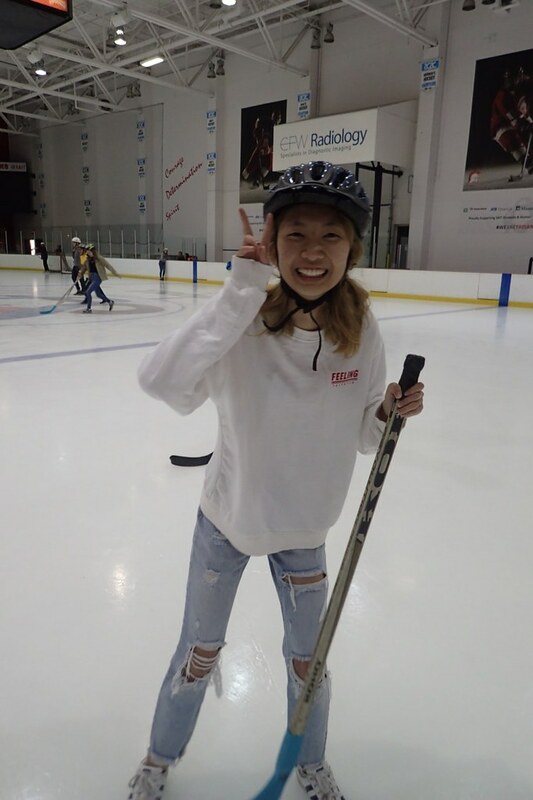 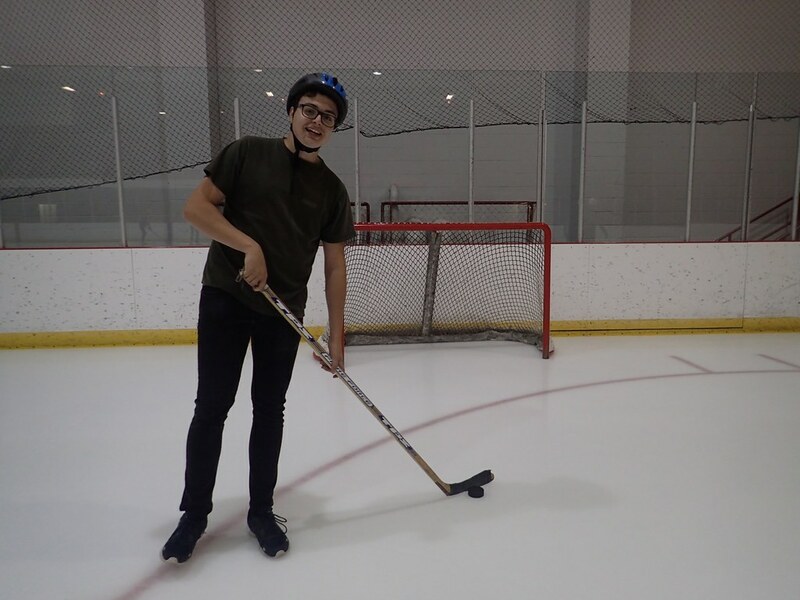 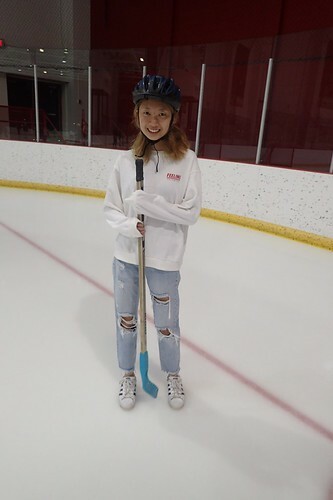 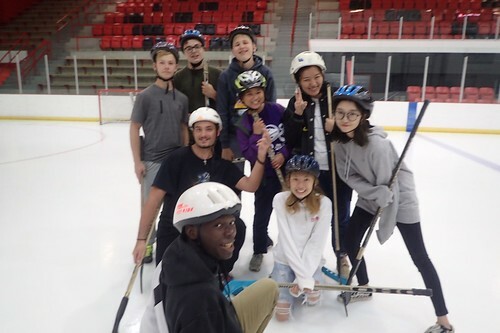 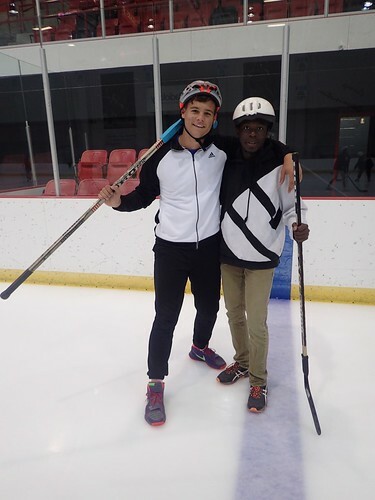 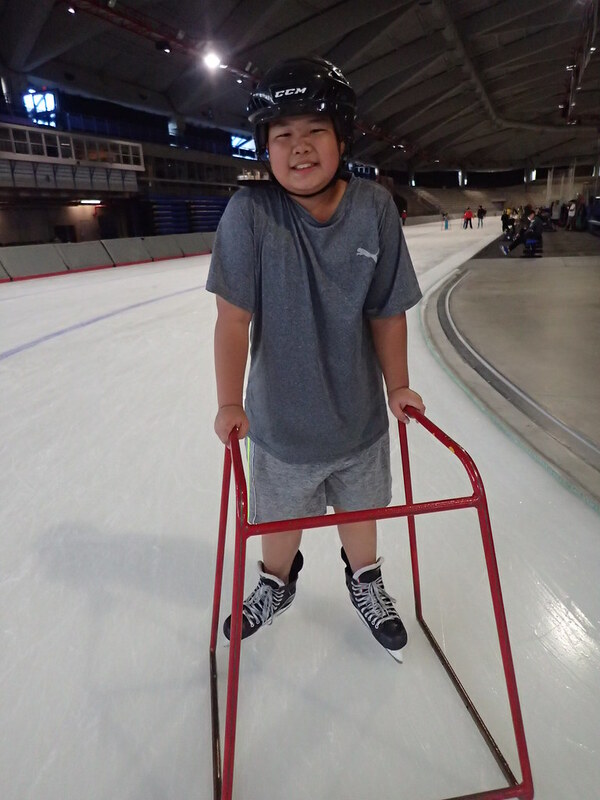 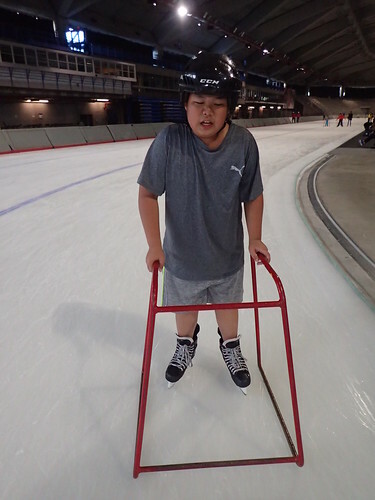 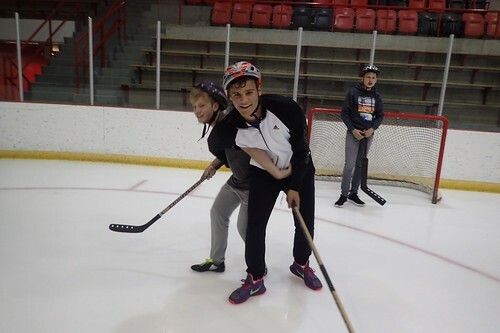 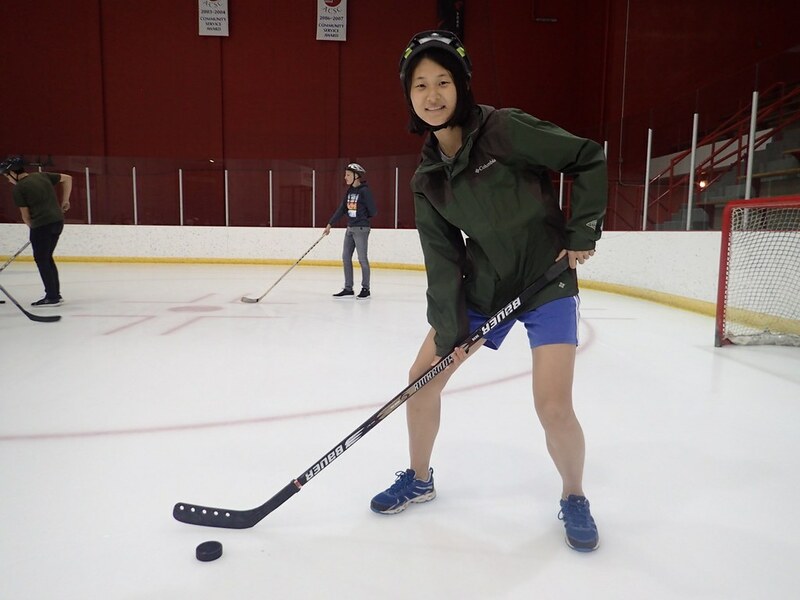 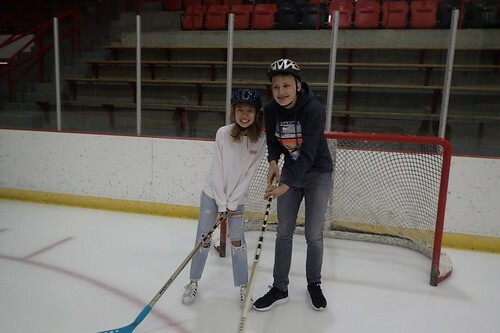 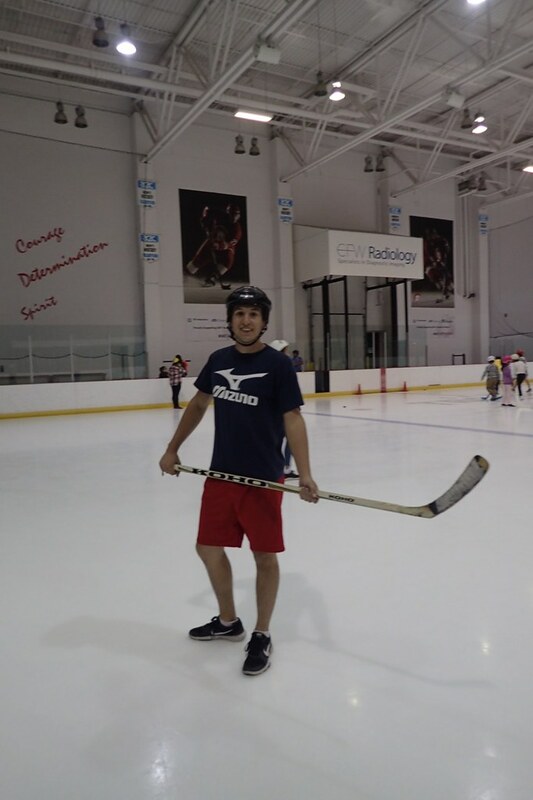 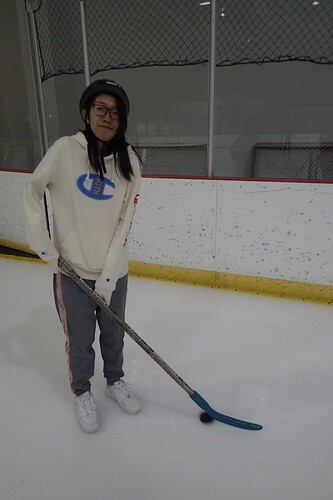 Today, they finally got the chance to go ice skating on the Olympic Oval at the University of Calgary! 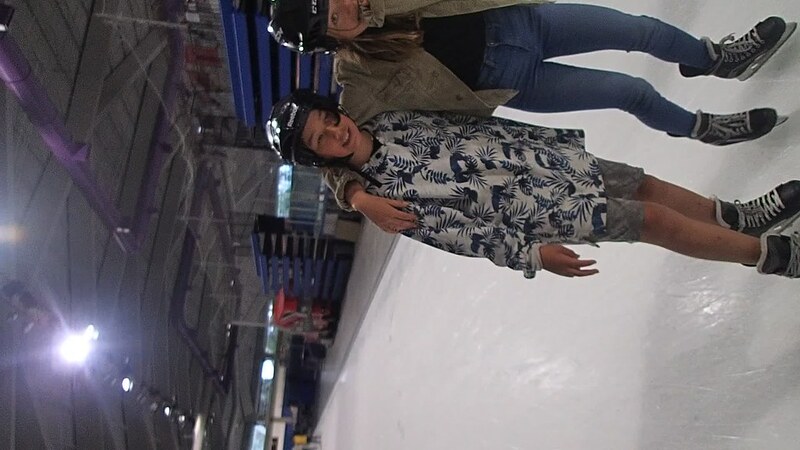 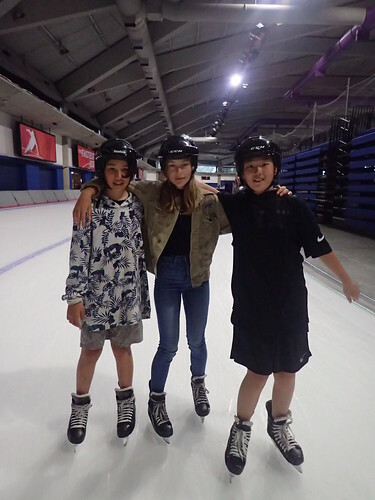 They were so excited to find this out and had a great time skating. 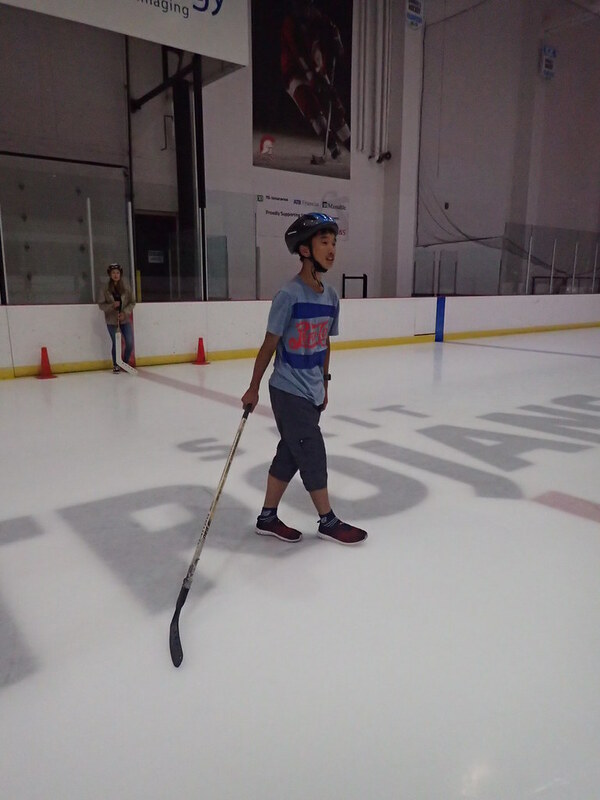 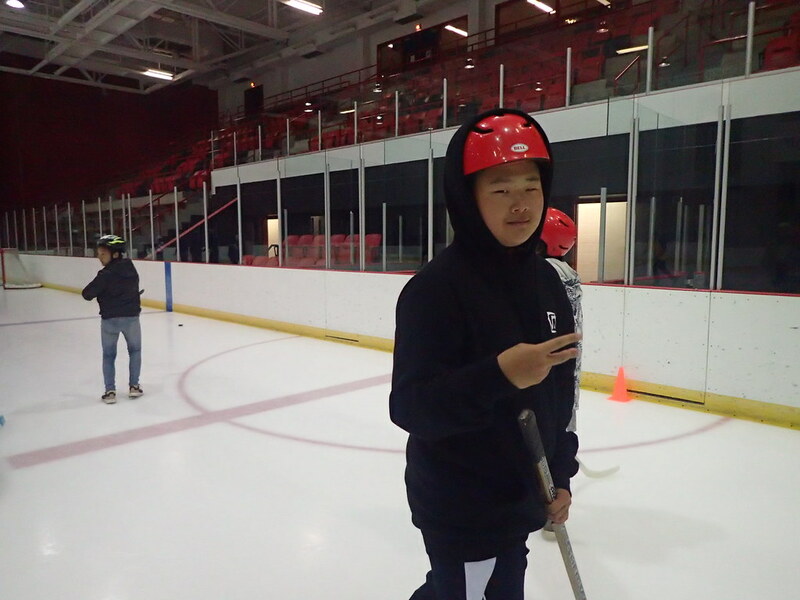 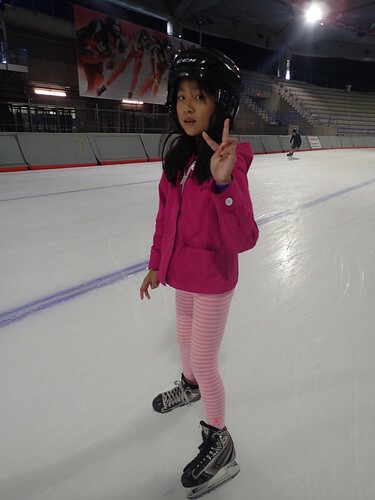 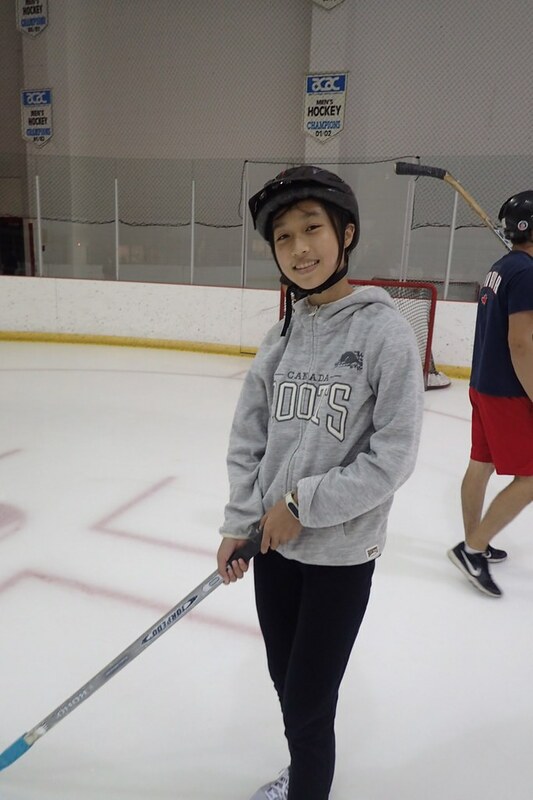 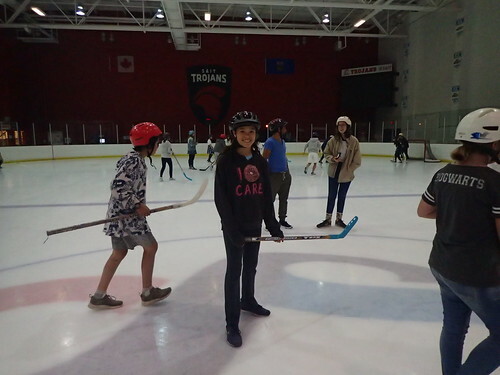 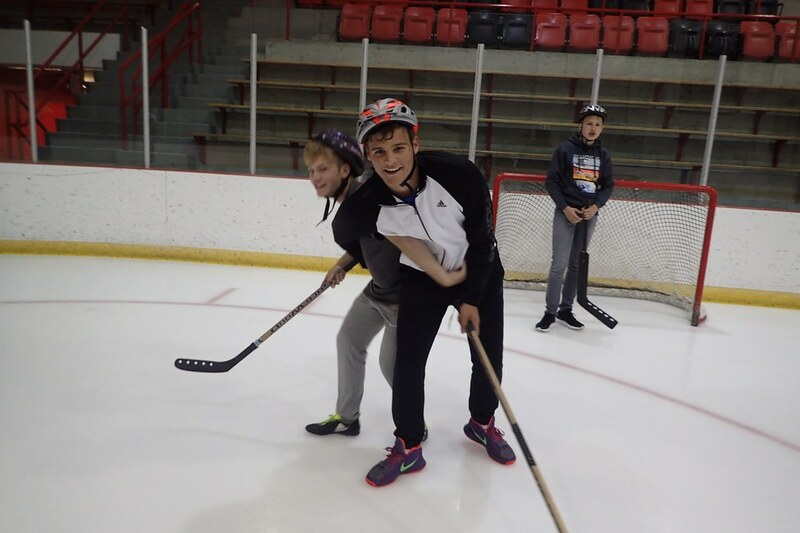 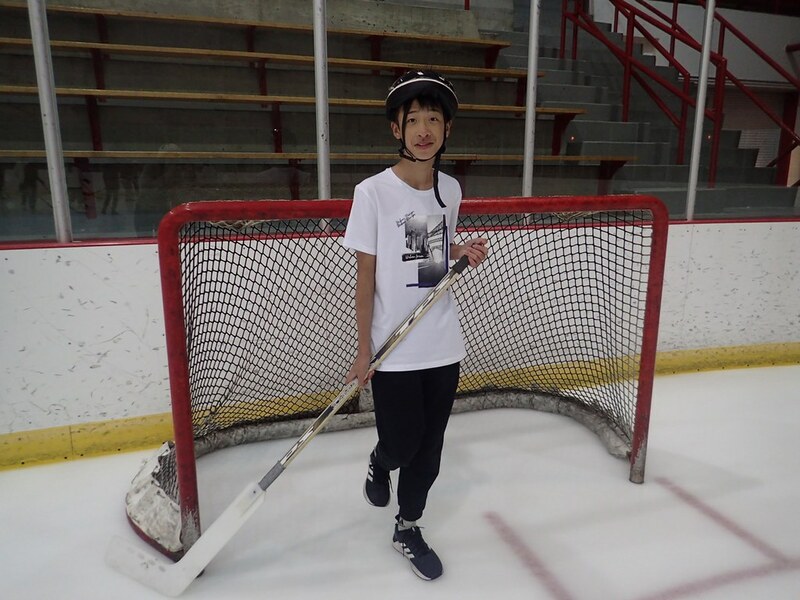 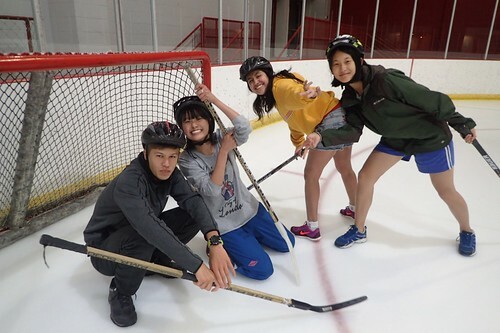 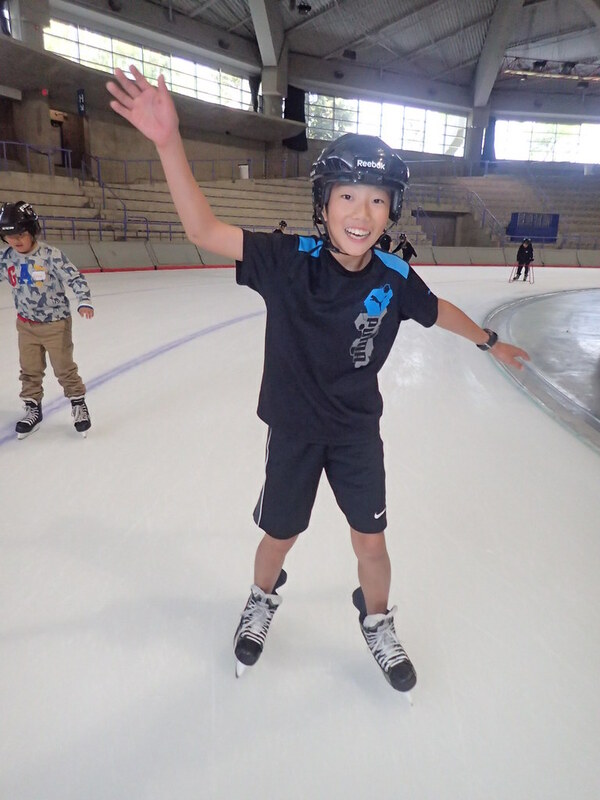 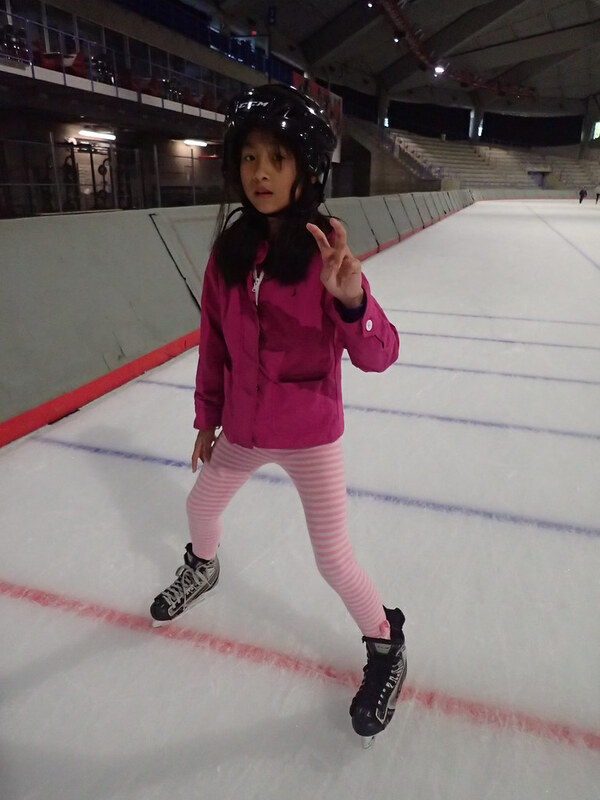 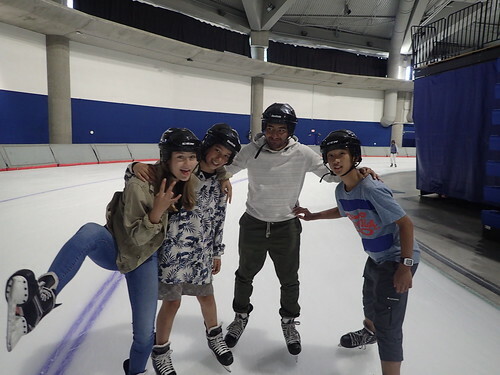 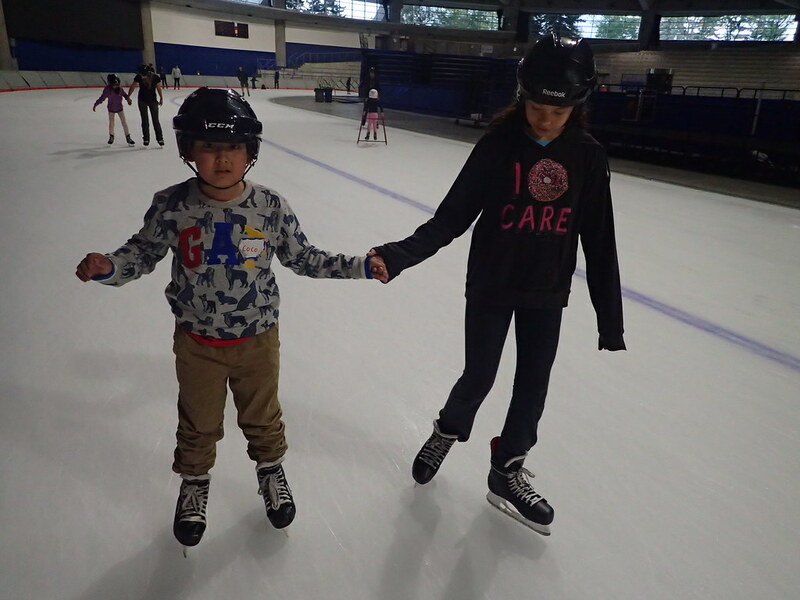 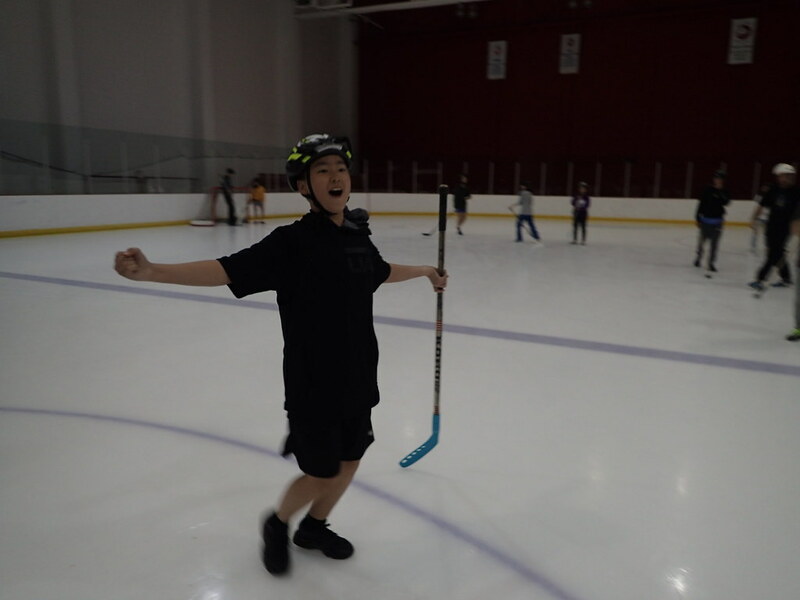 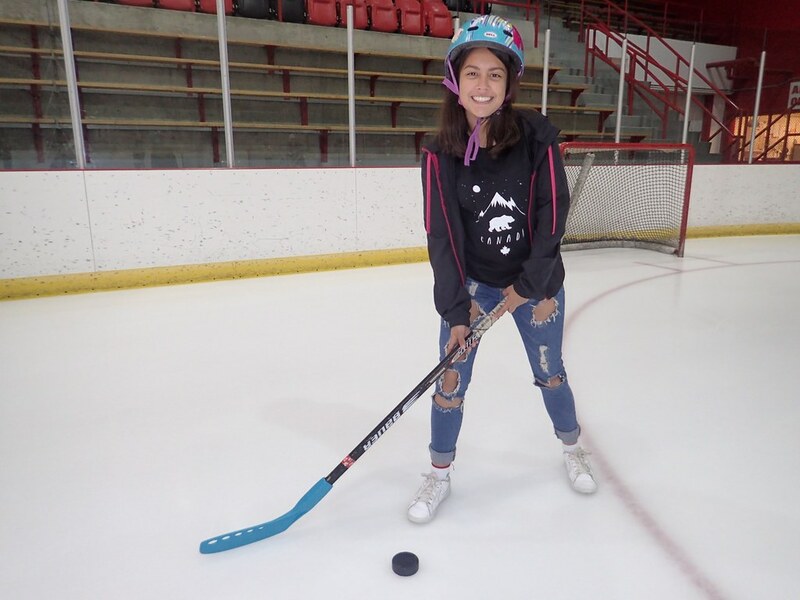 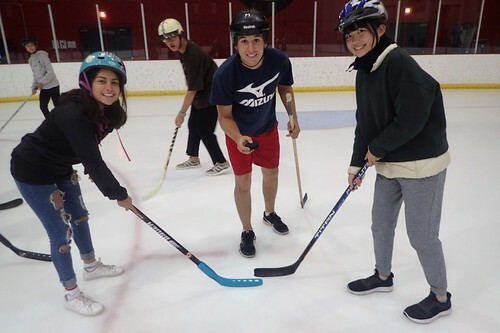 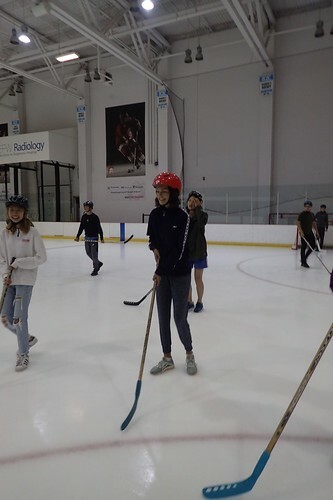 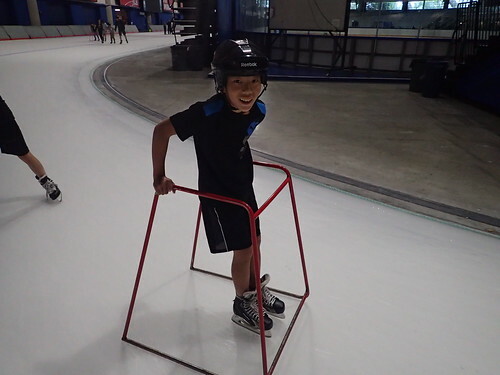 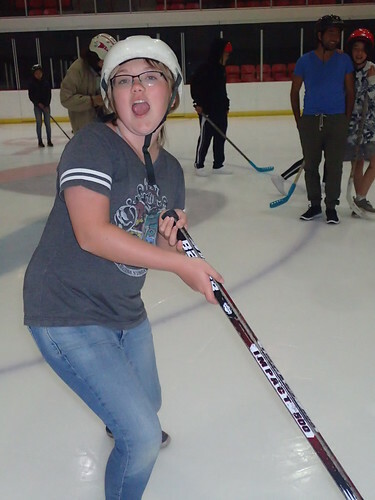 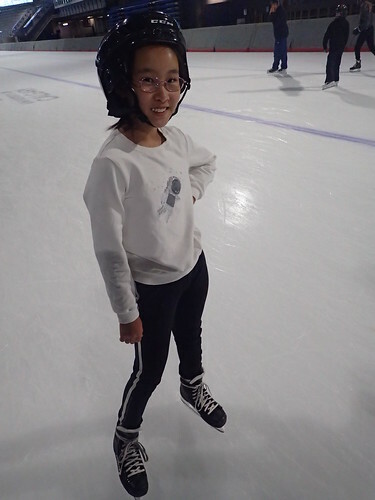 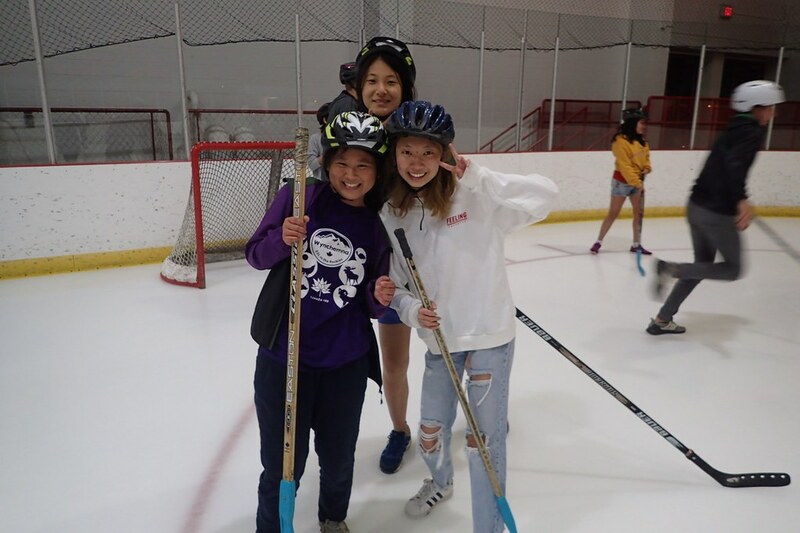 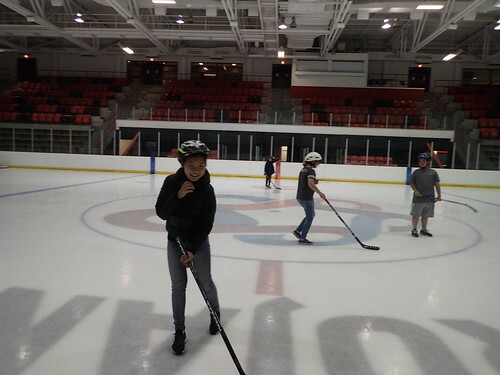 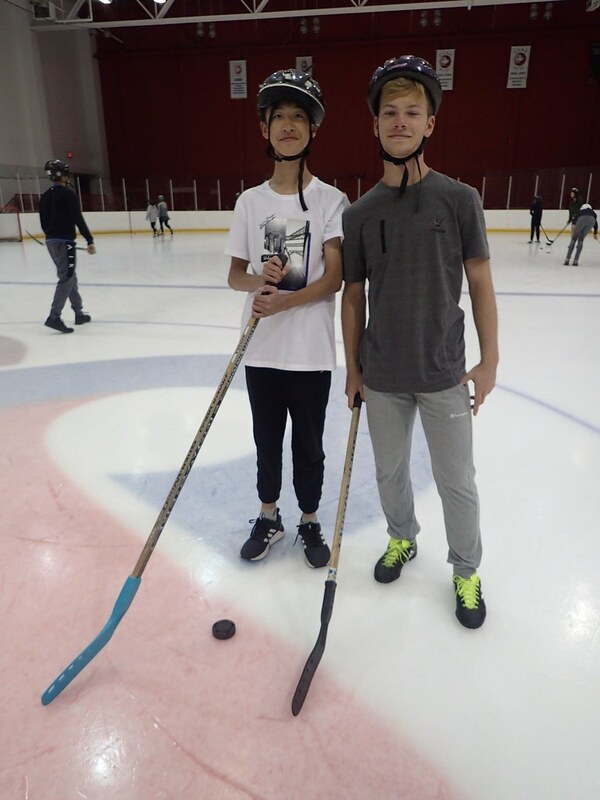 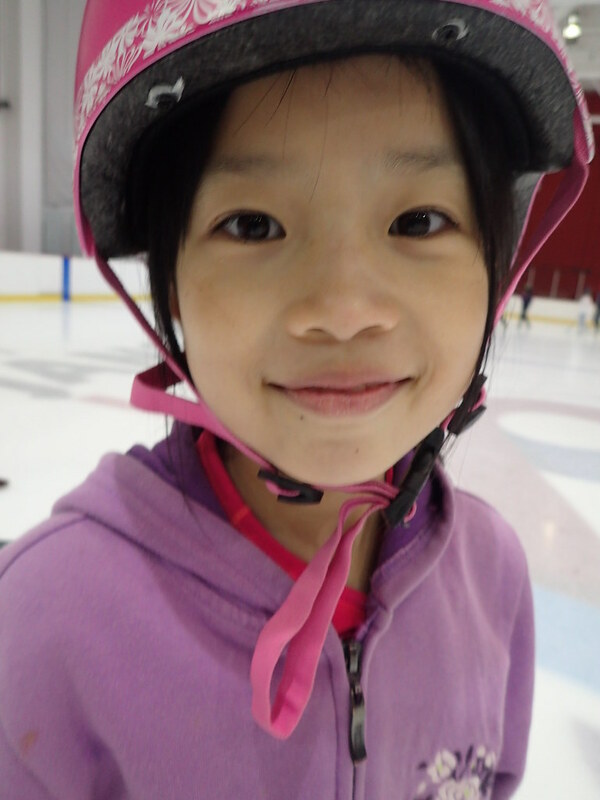 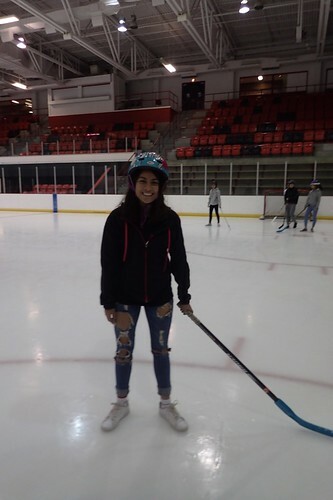 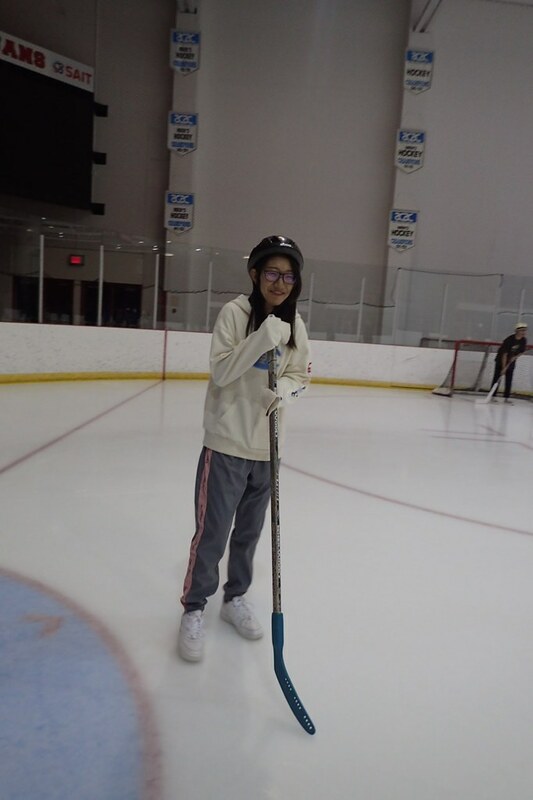 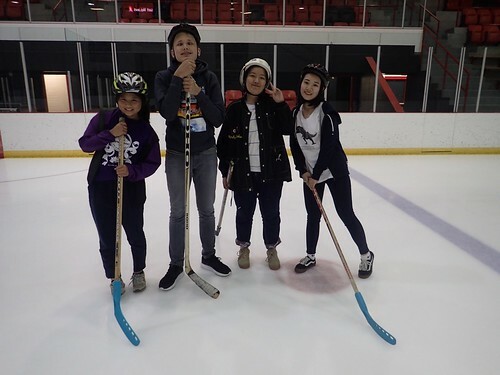 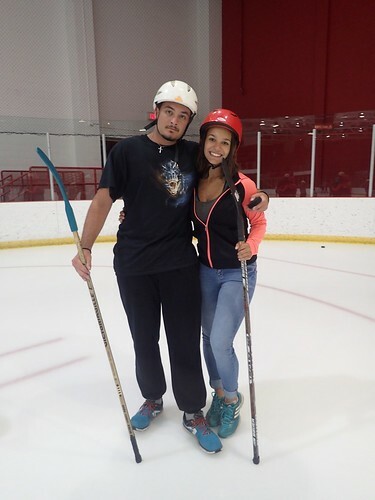 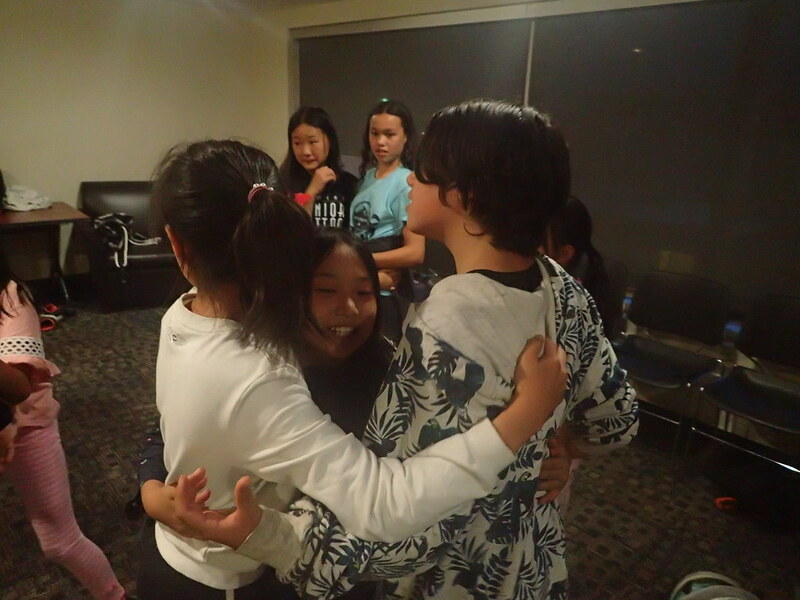 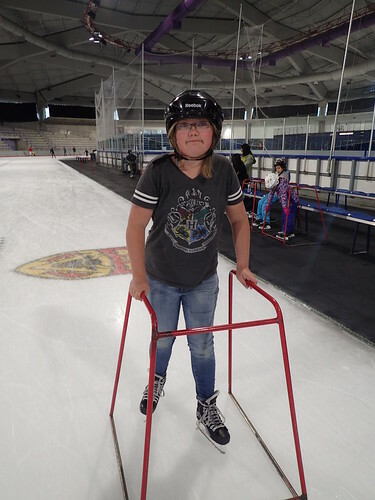 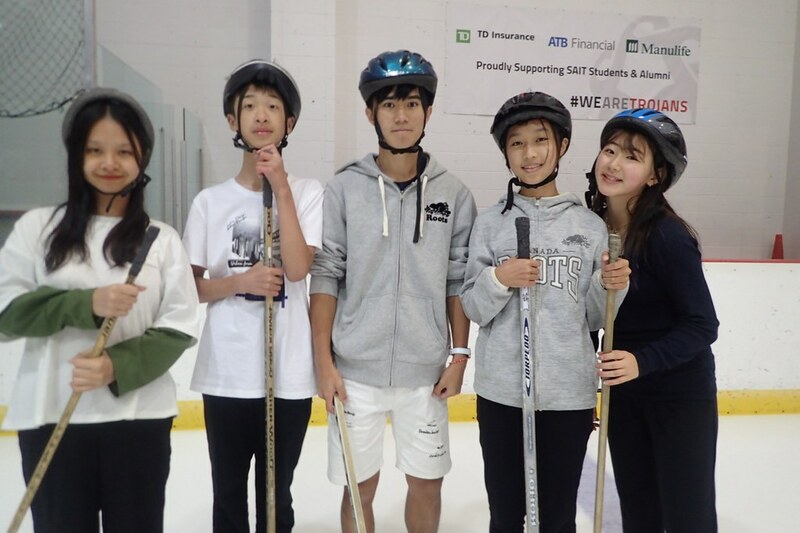 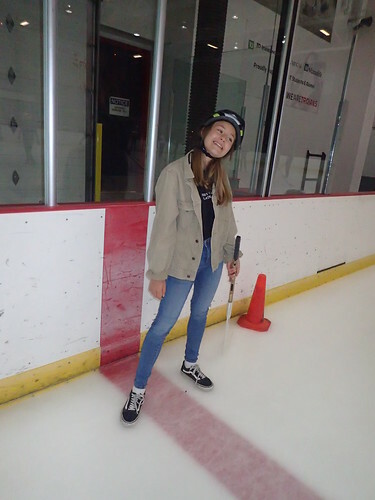 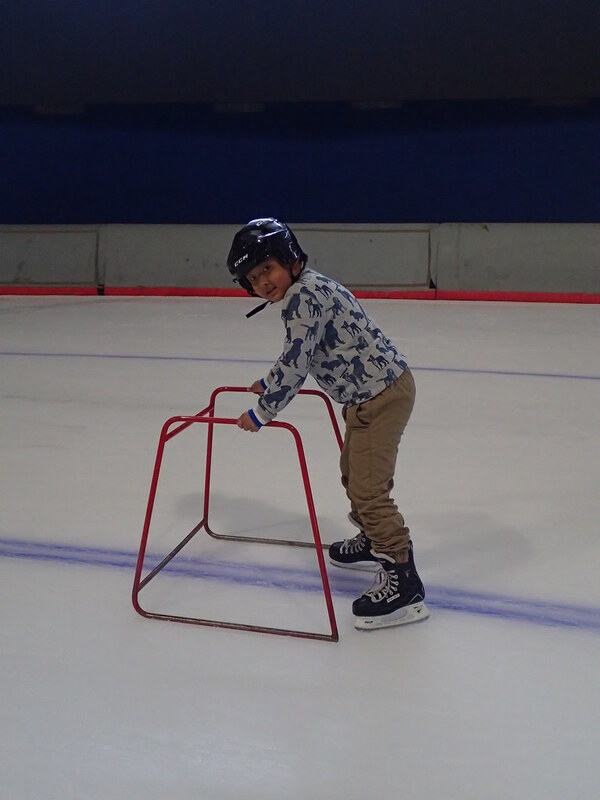 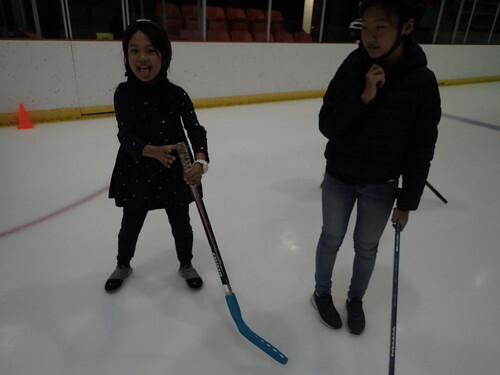 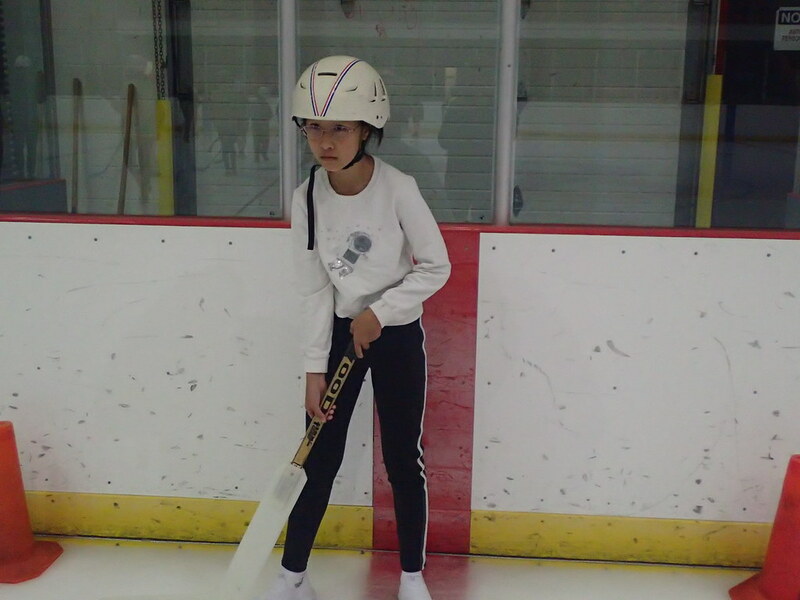 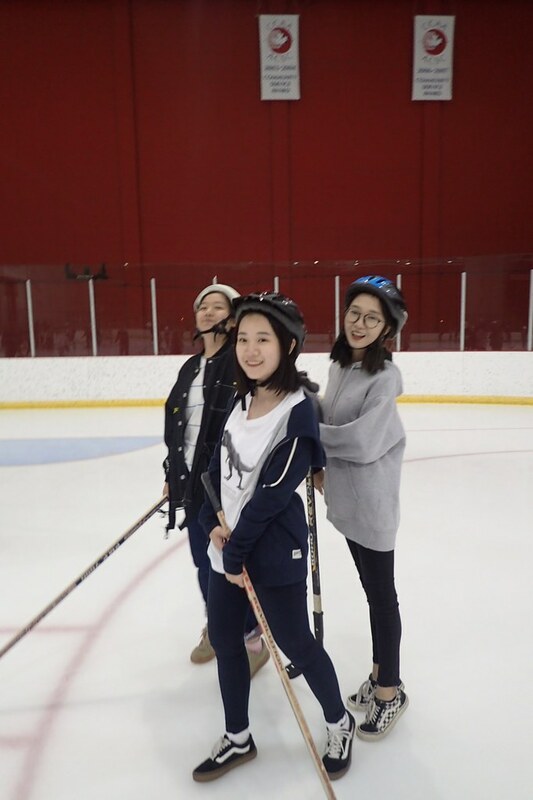 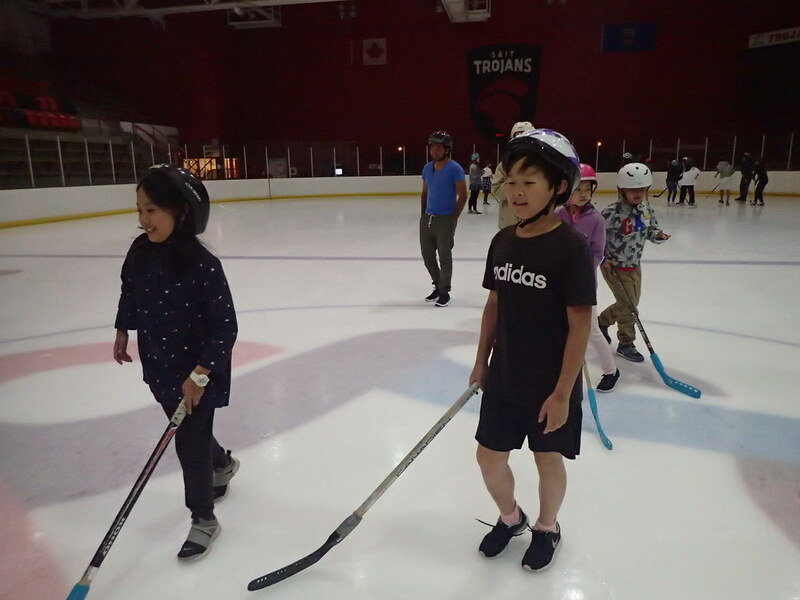 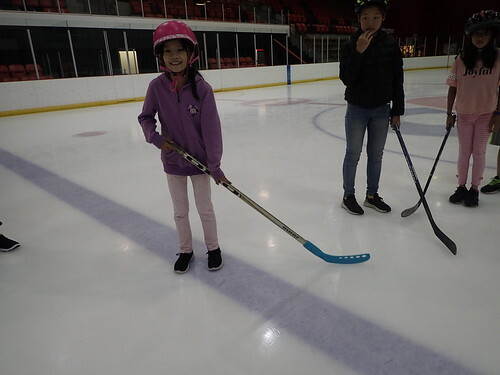 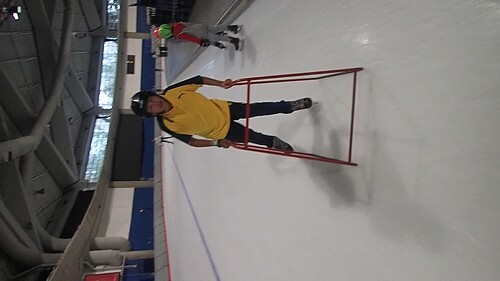 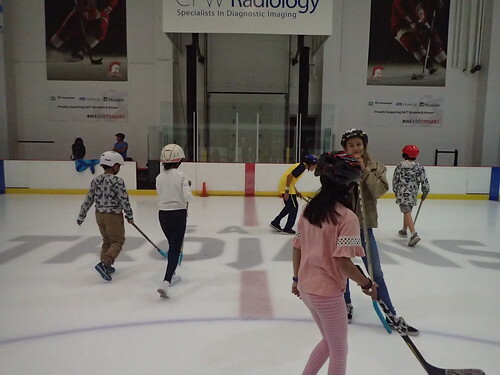 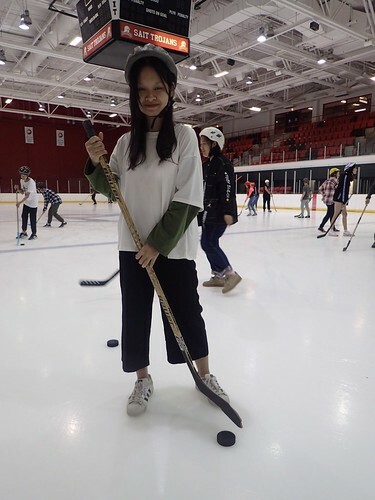 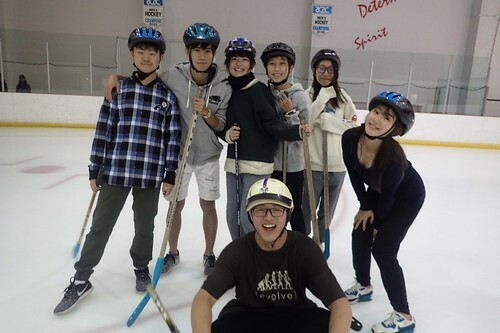 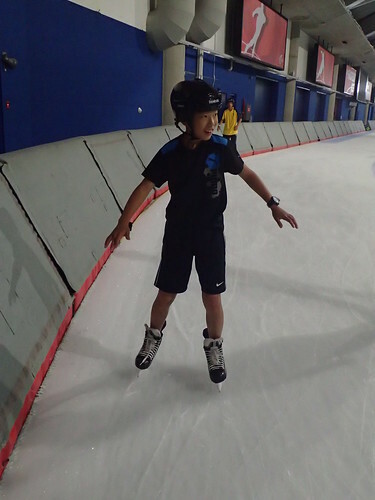 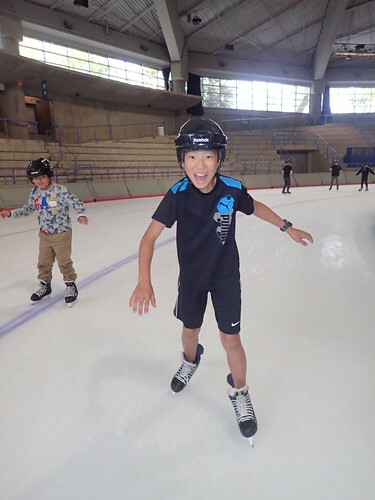 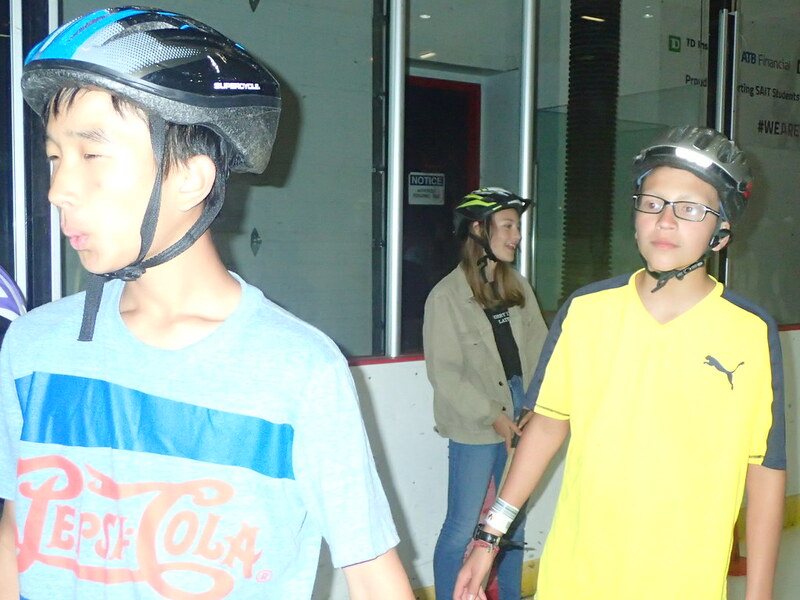 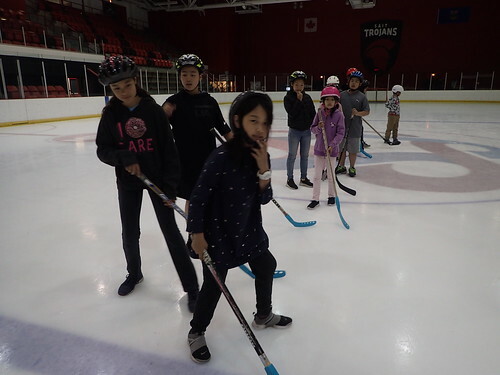 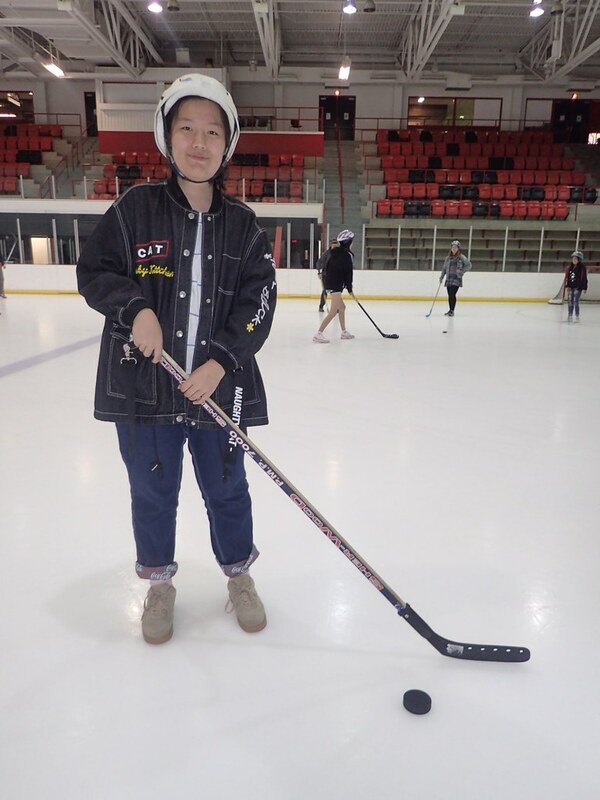 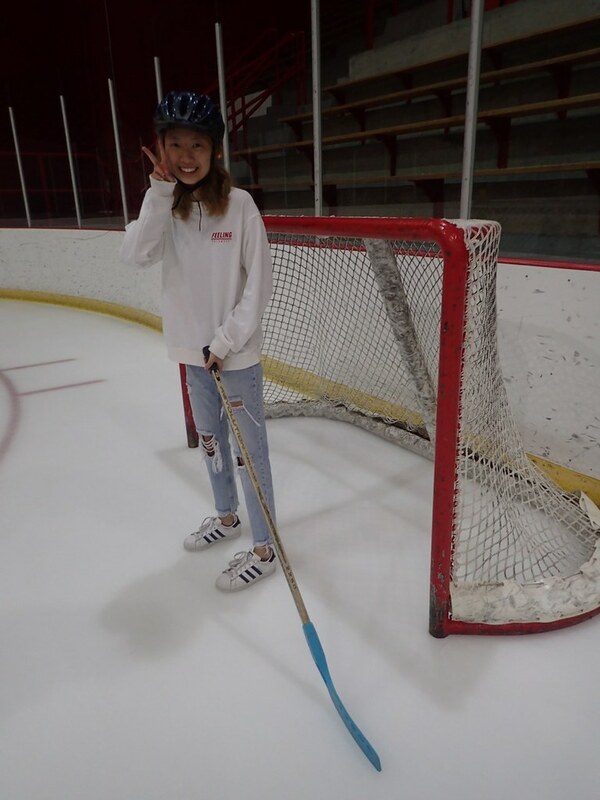 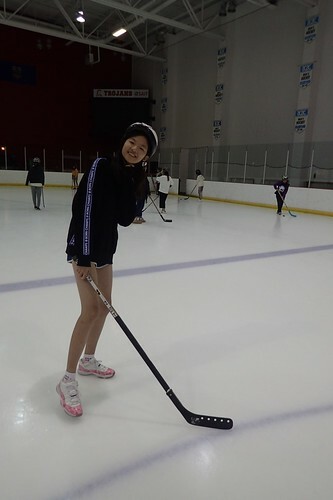 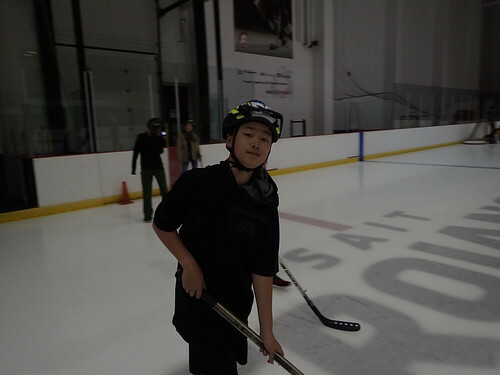 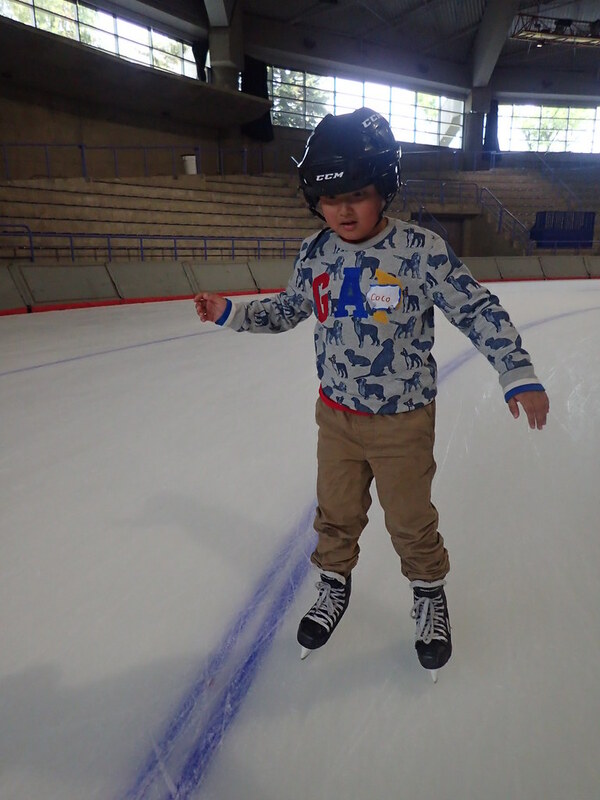 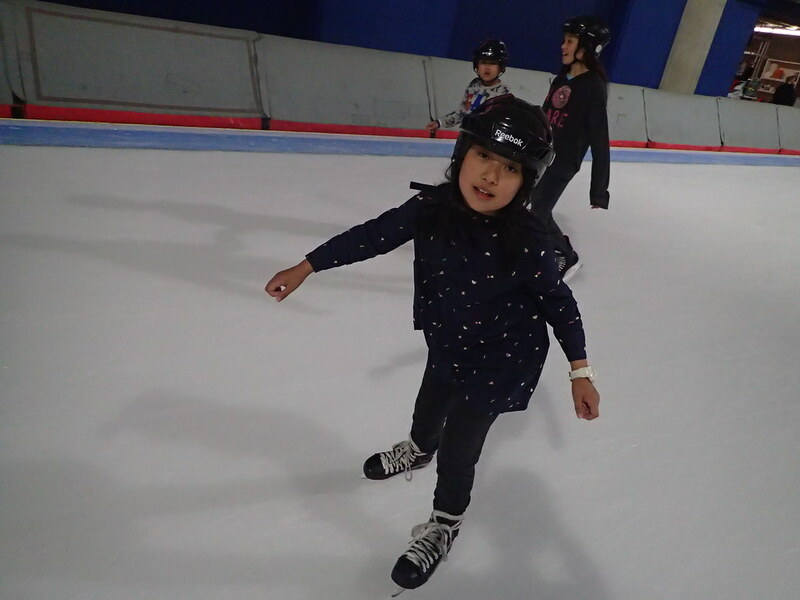 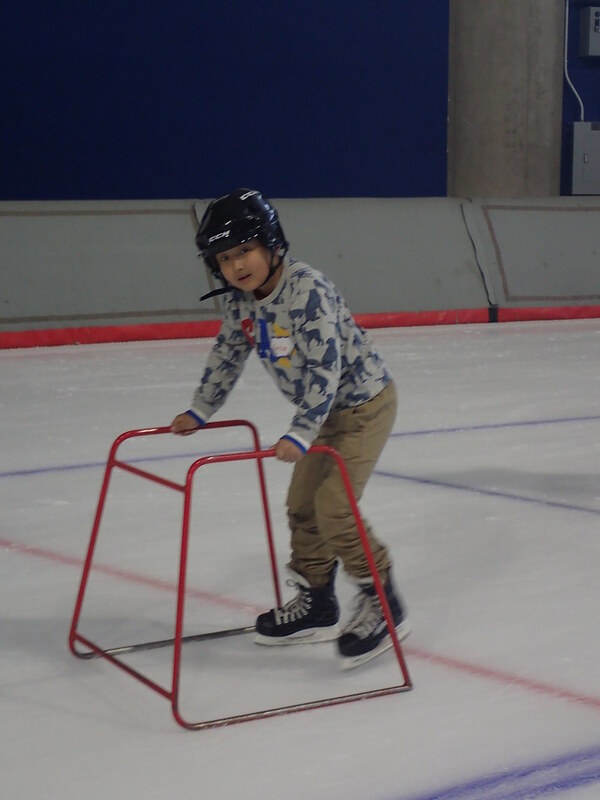 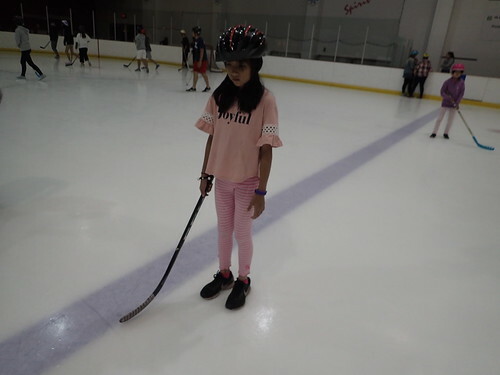 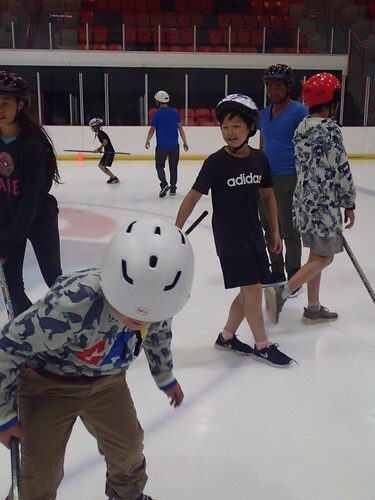 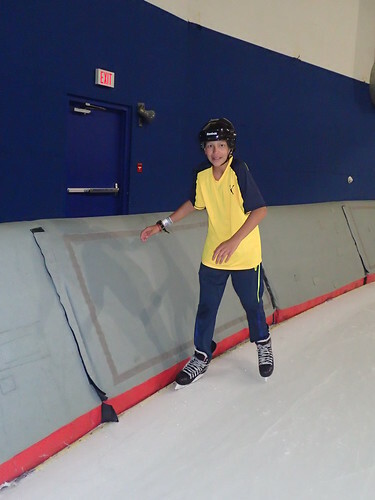 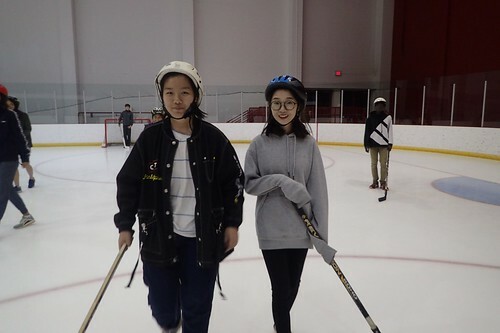 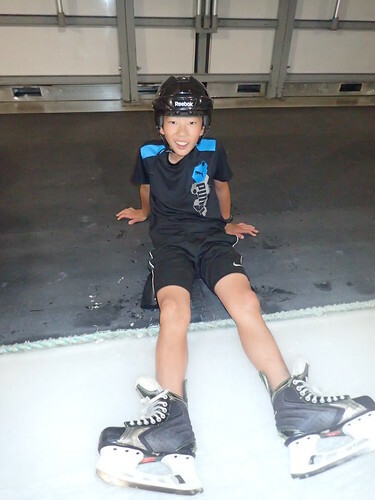 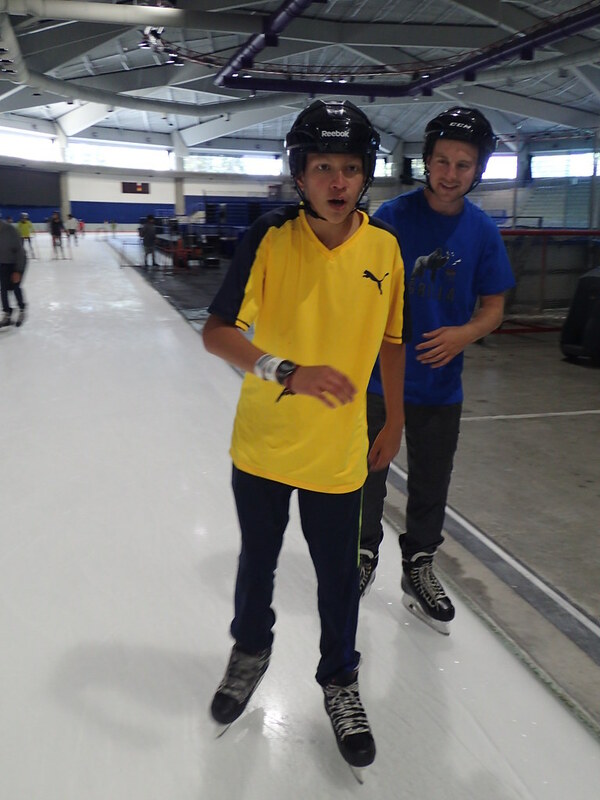 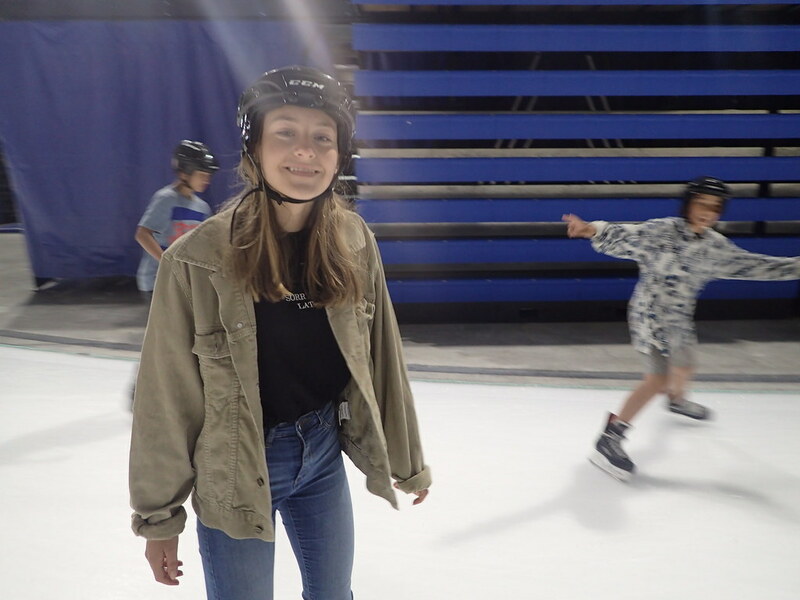 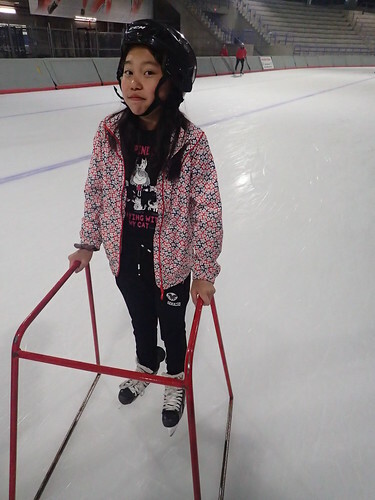 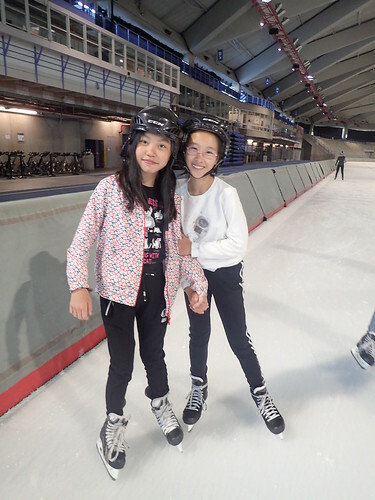 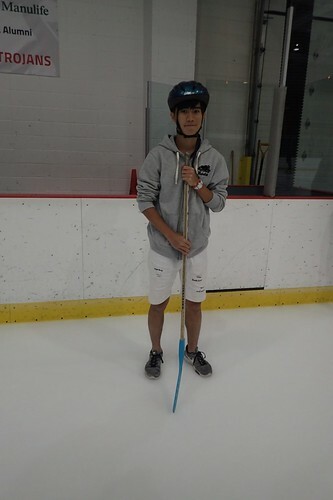 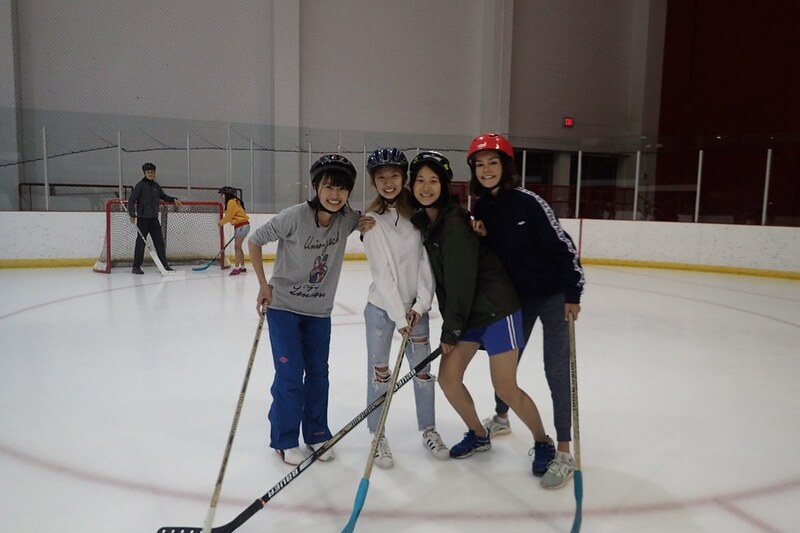 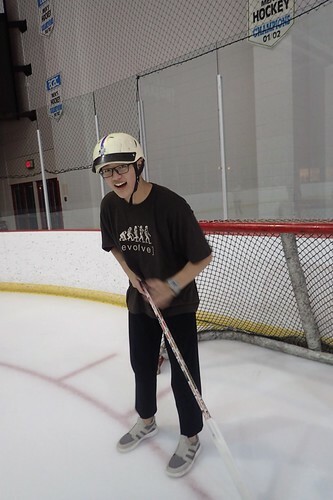 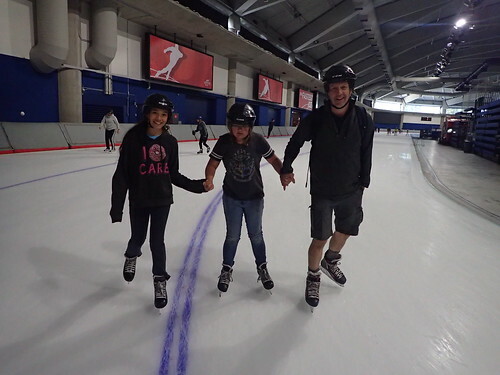 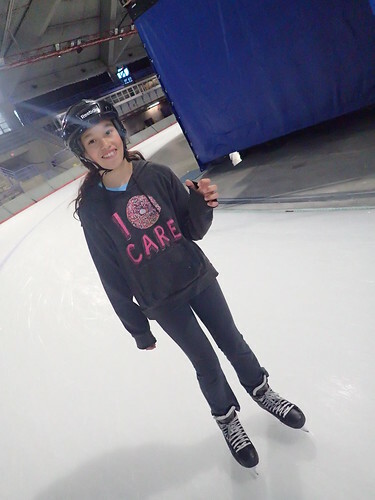 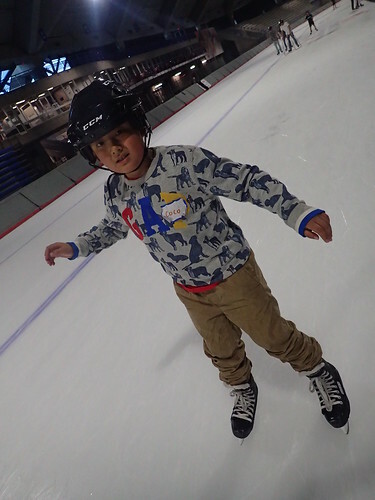 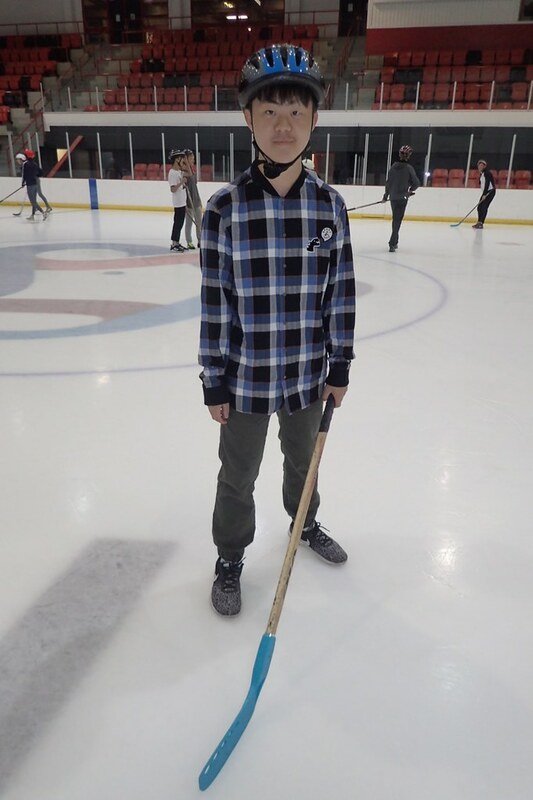 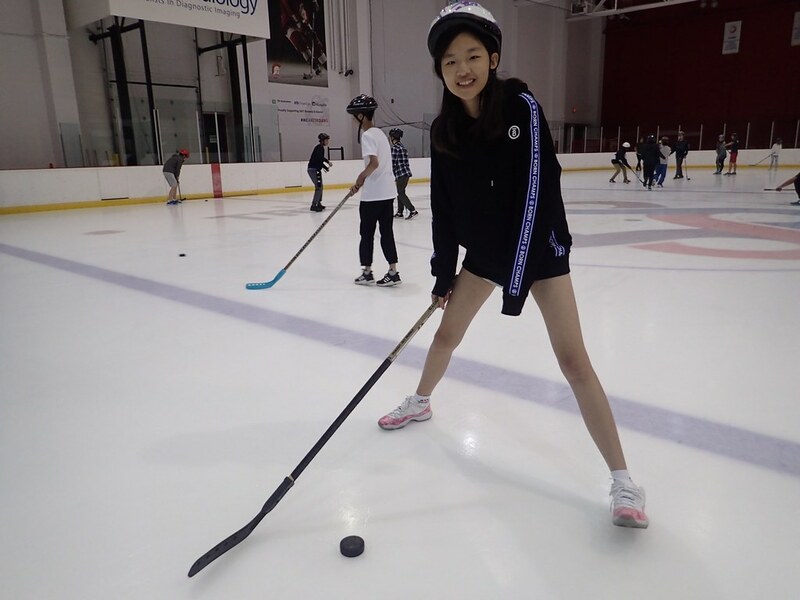 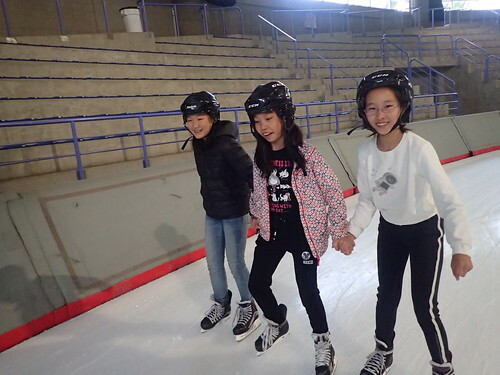 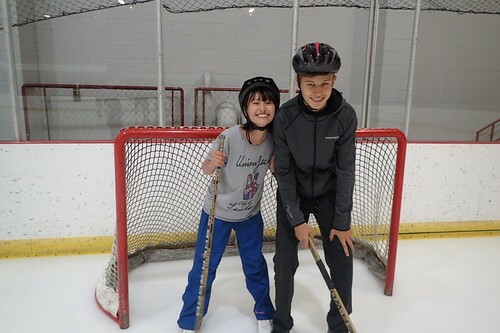 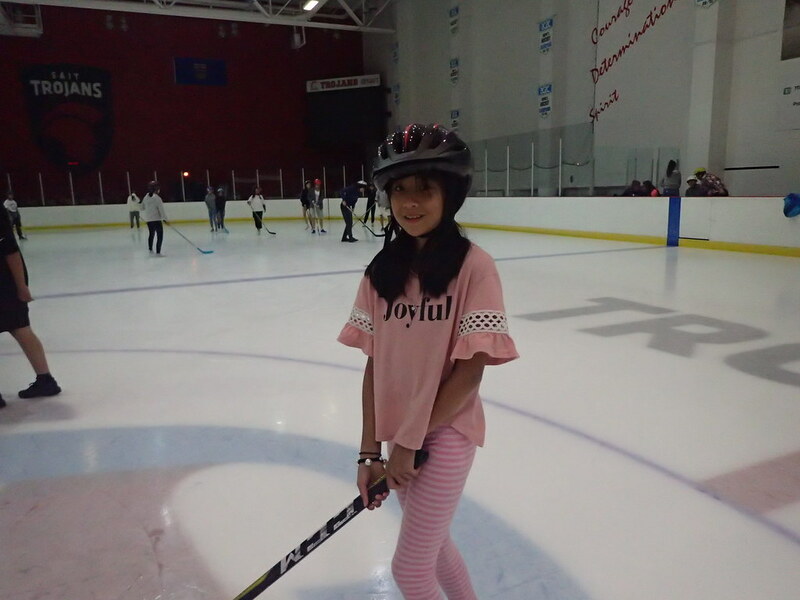 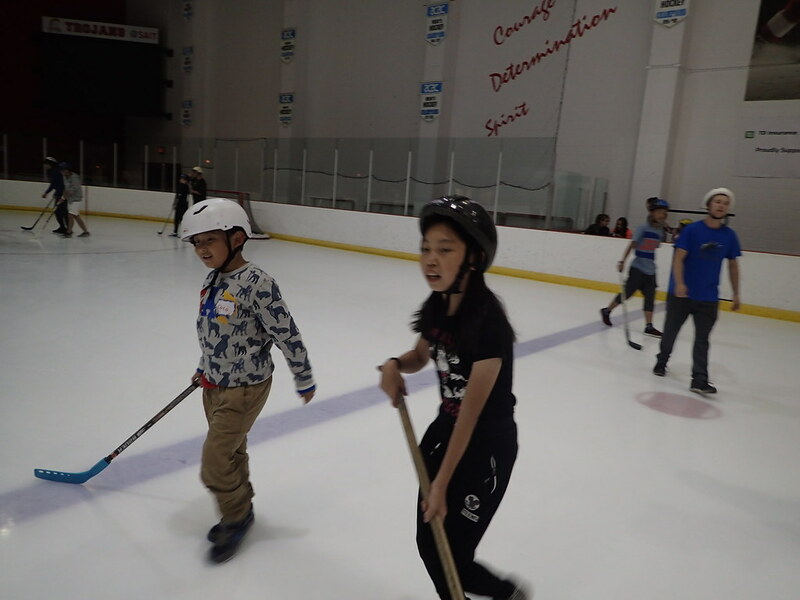 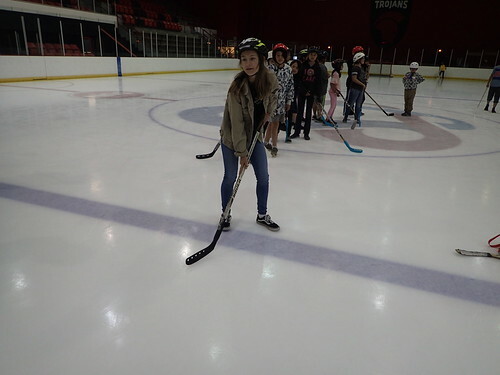 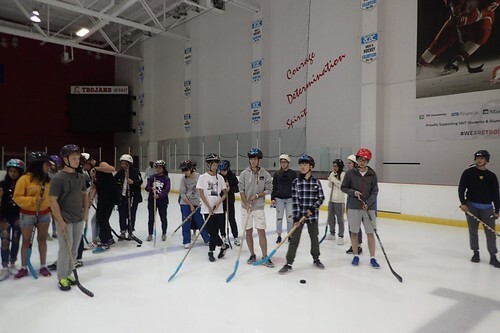 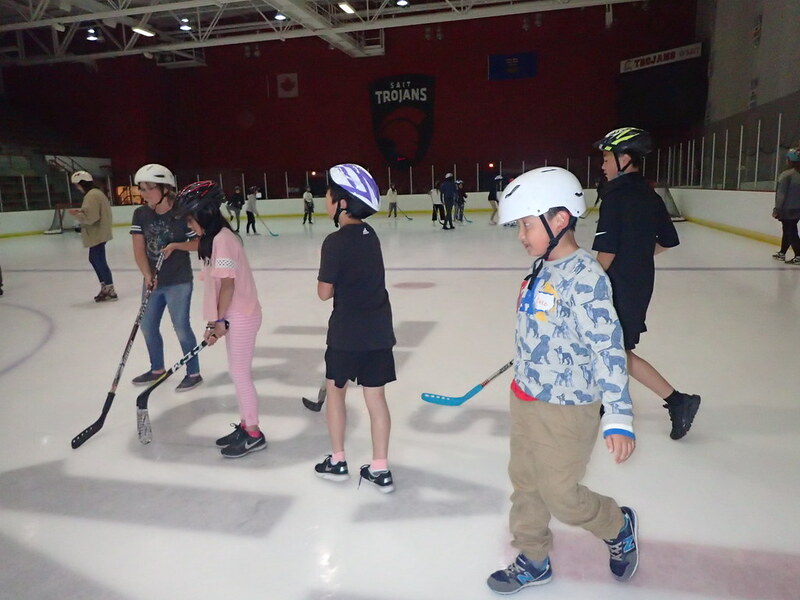 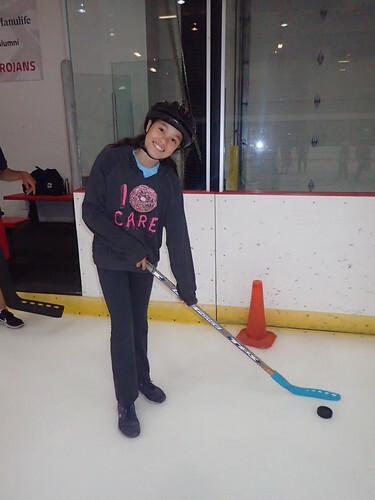 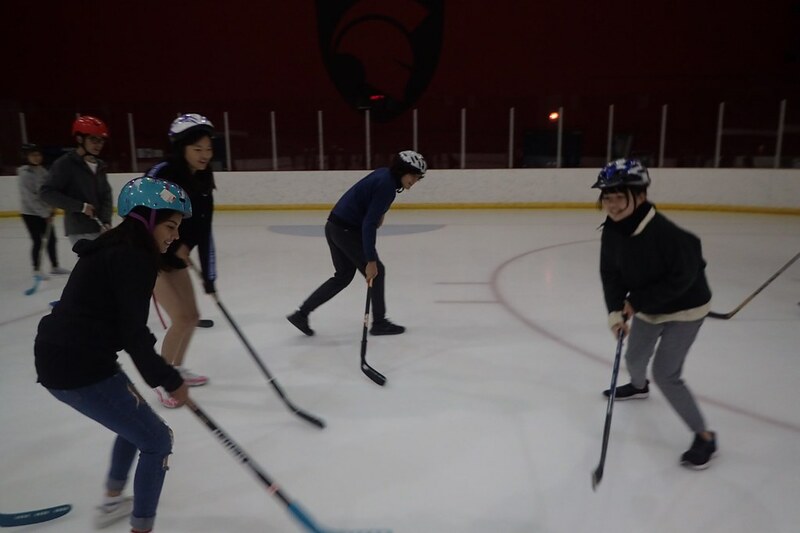 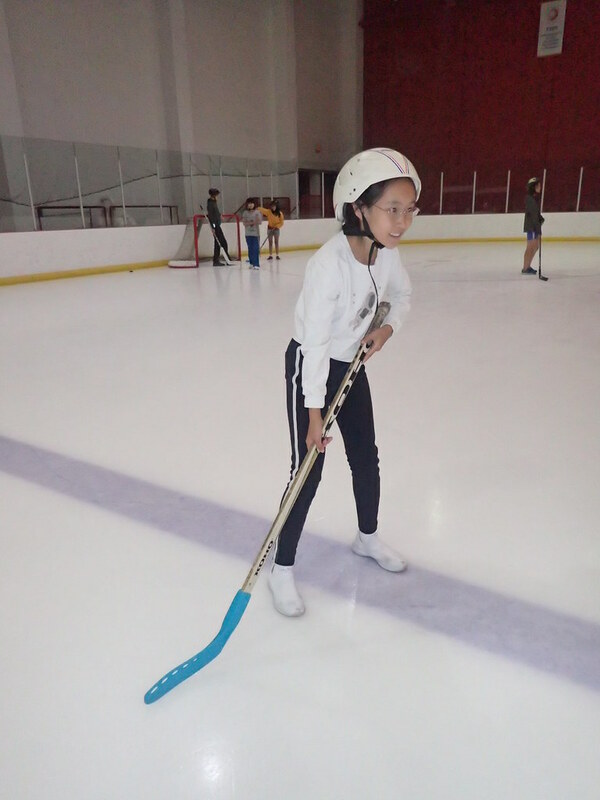 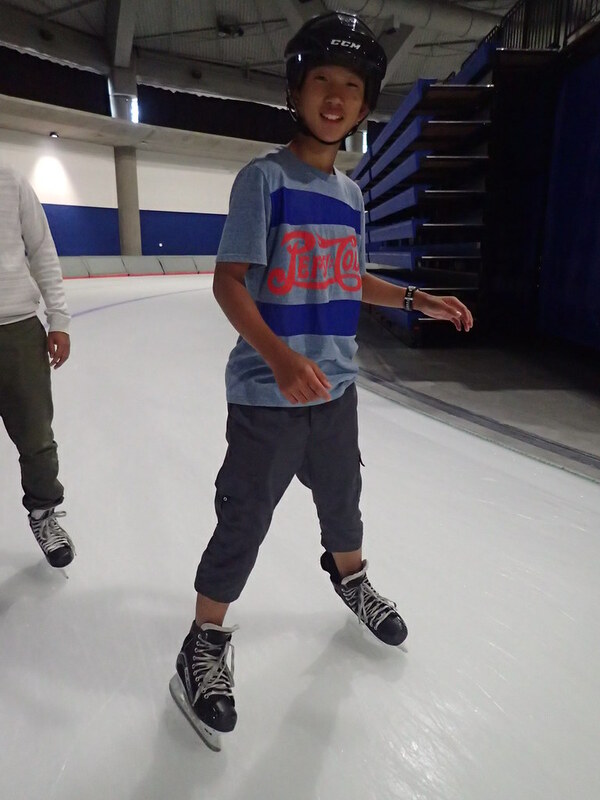 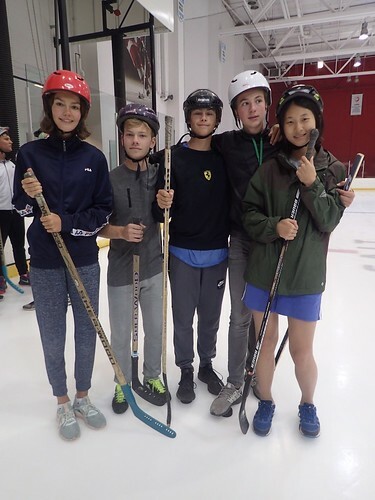 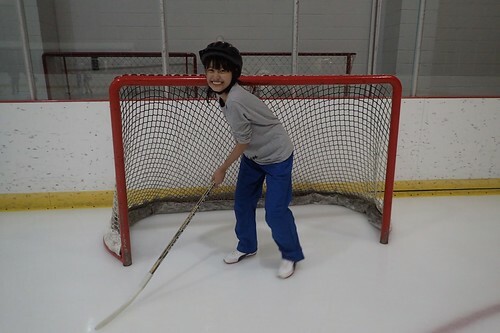 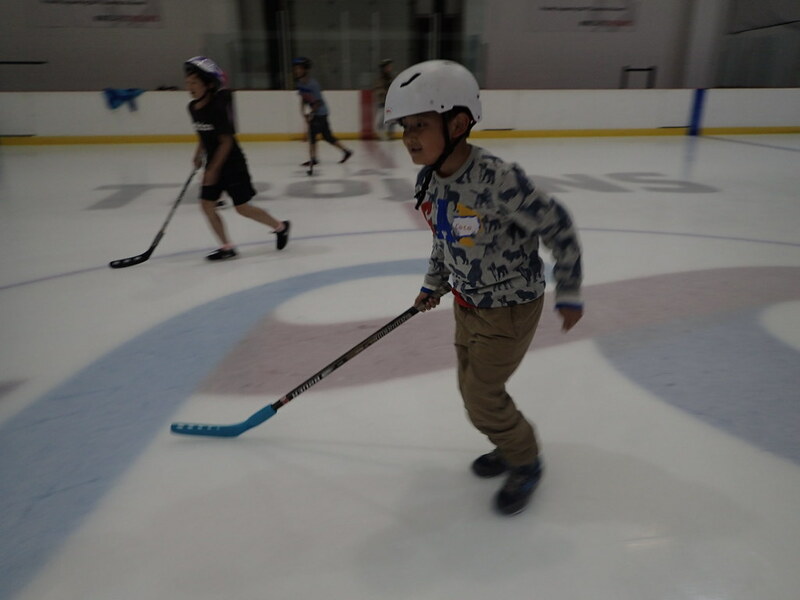 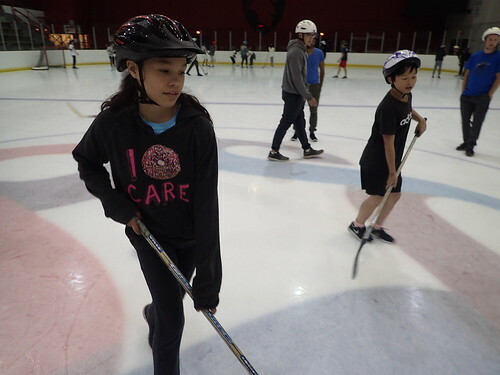 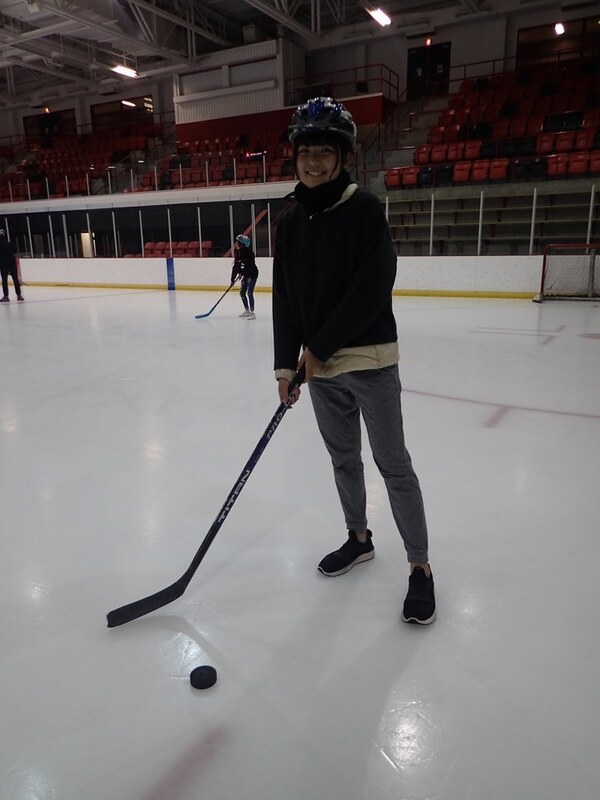 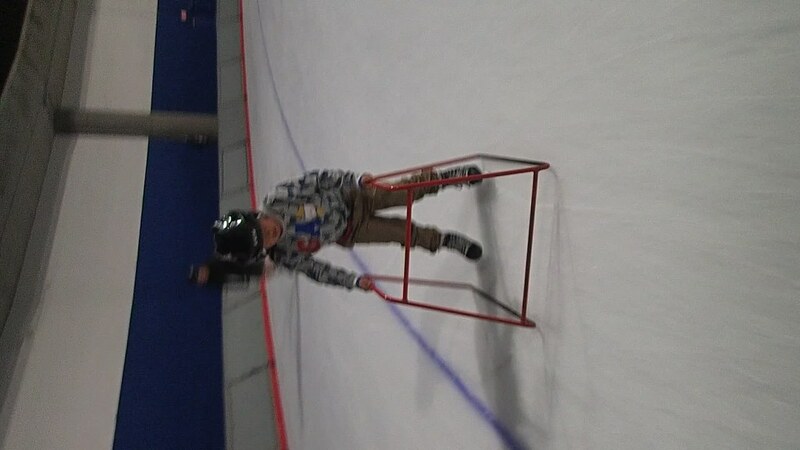 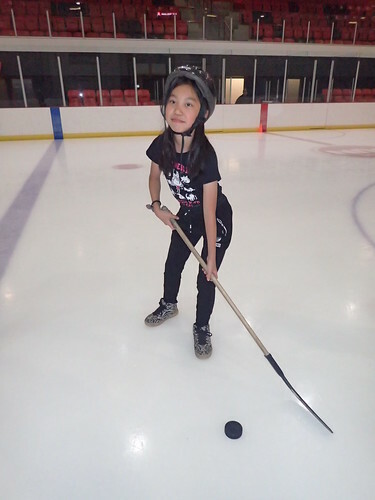 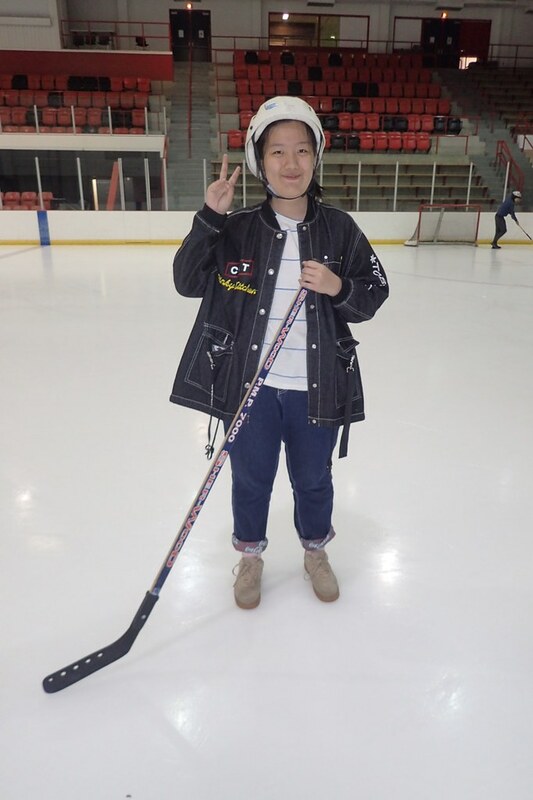 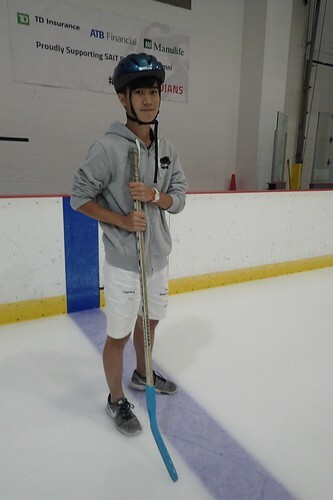 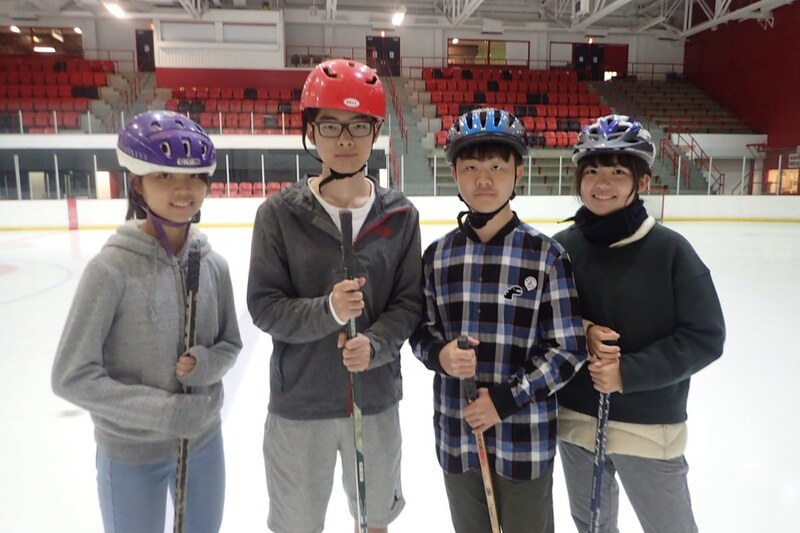 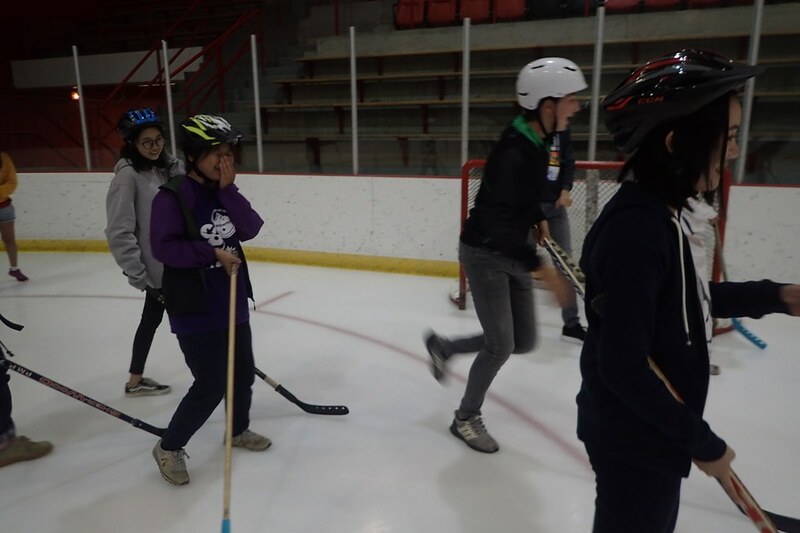 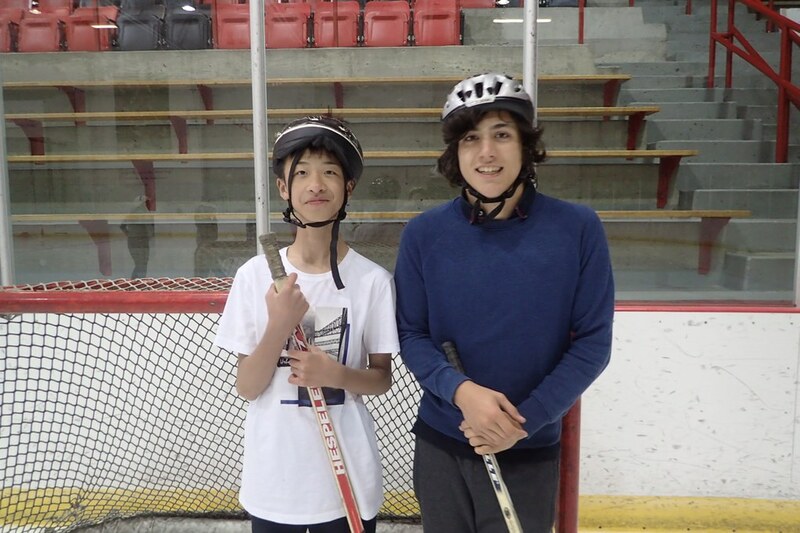 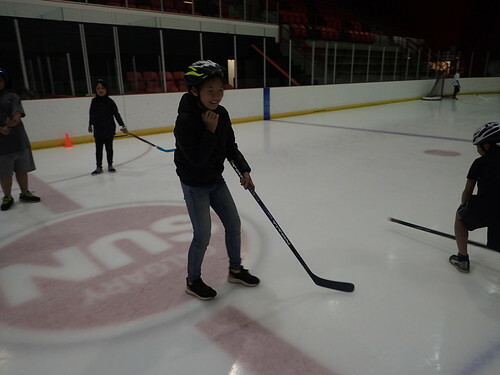 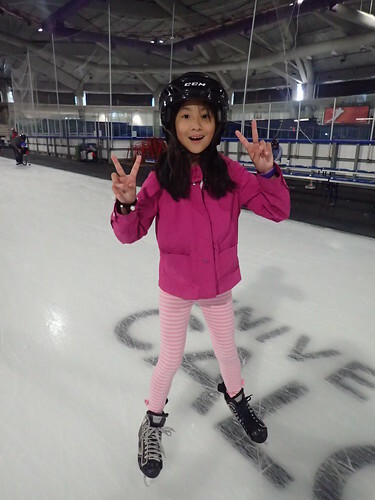 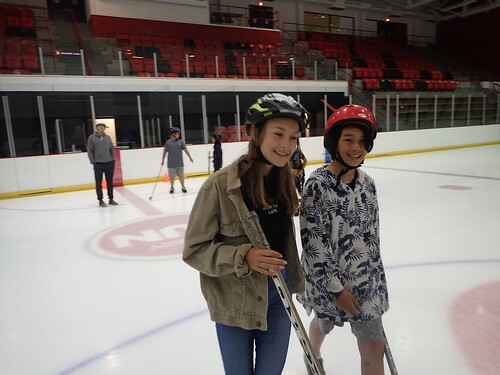 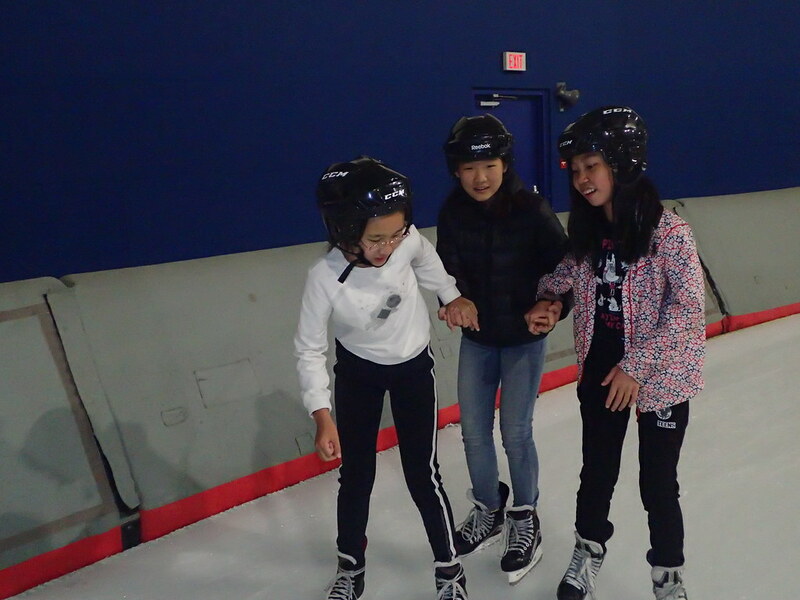 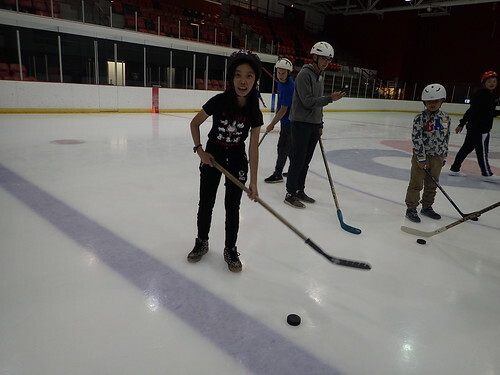 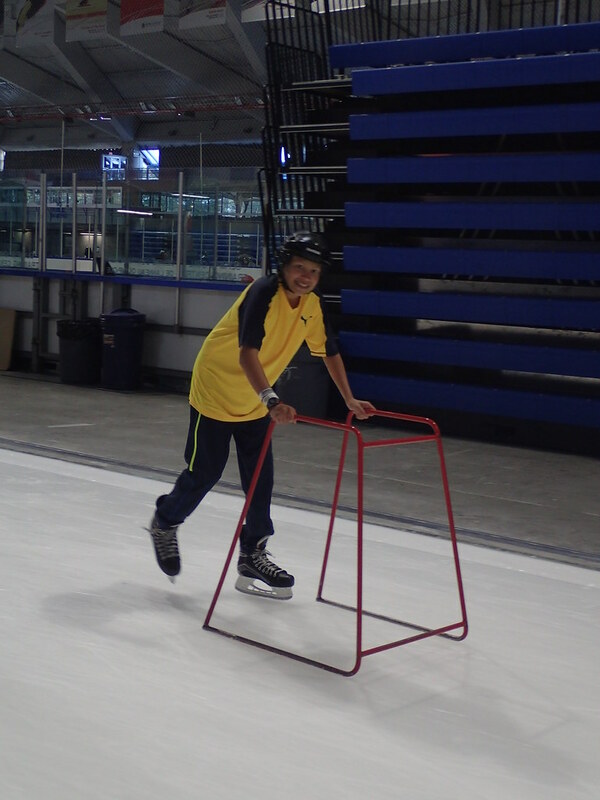 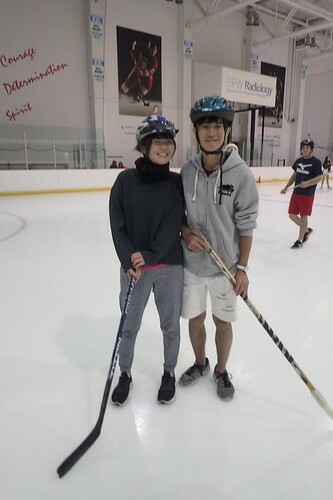 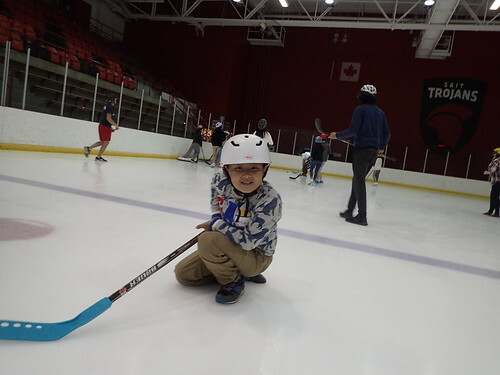 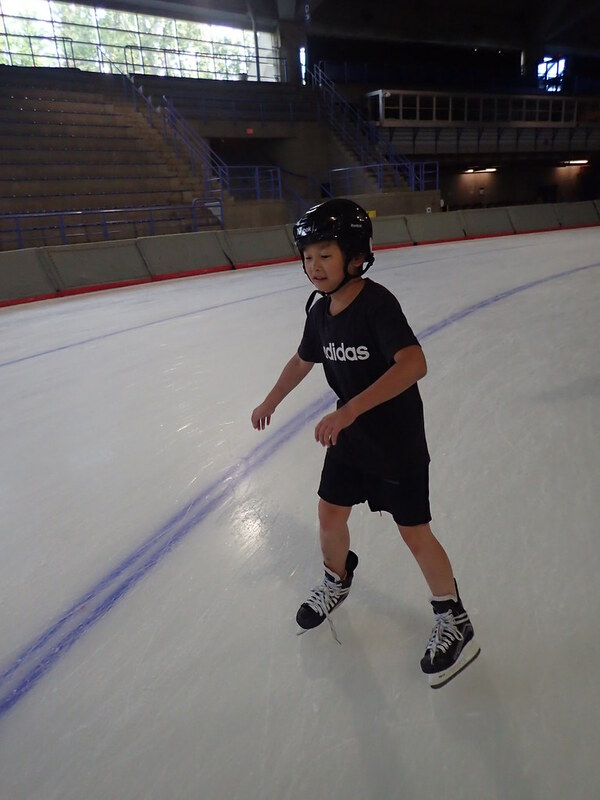 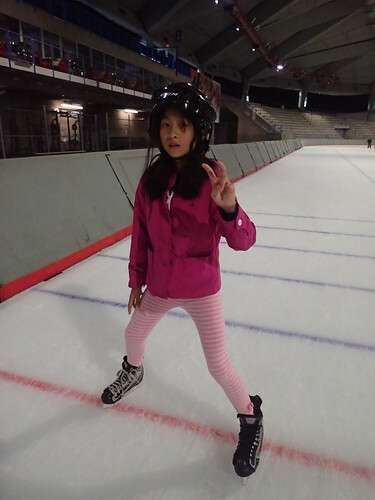 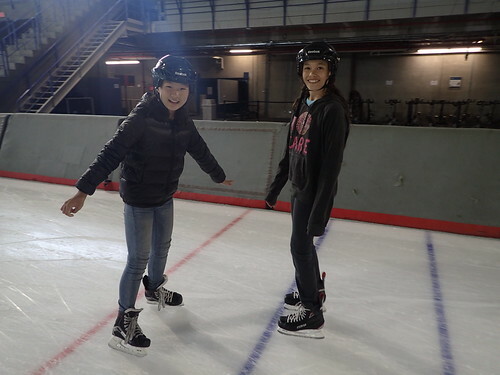 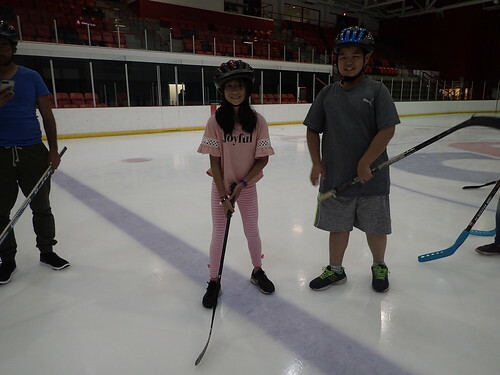 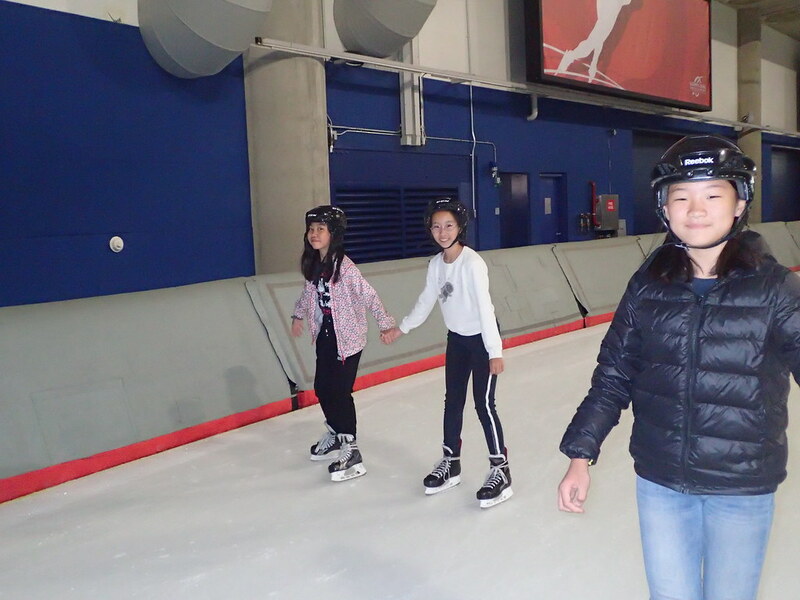 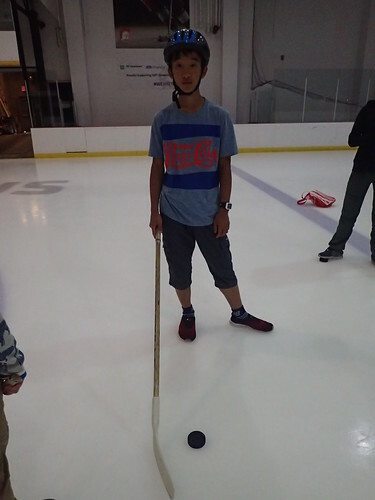 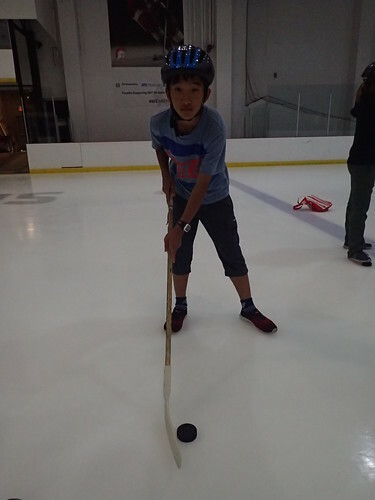 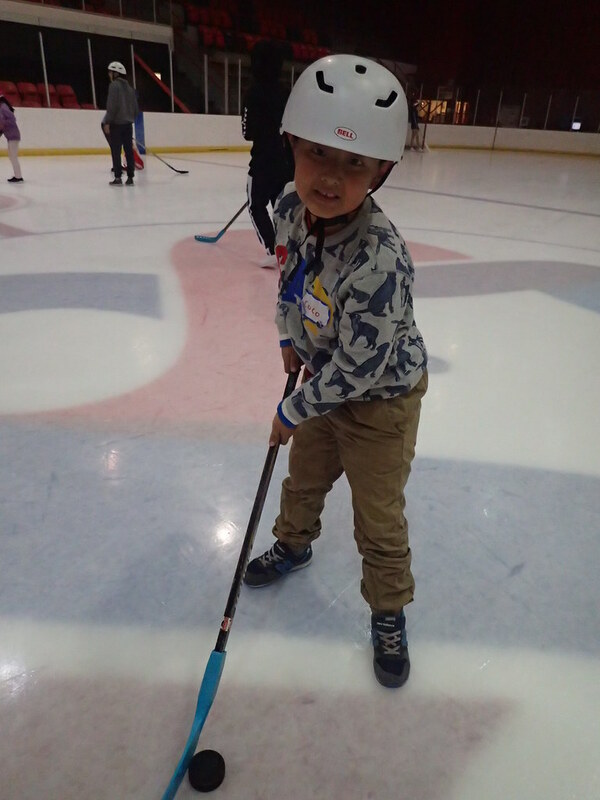 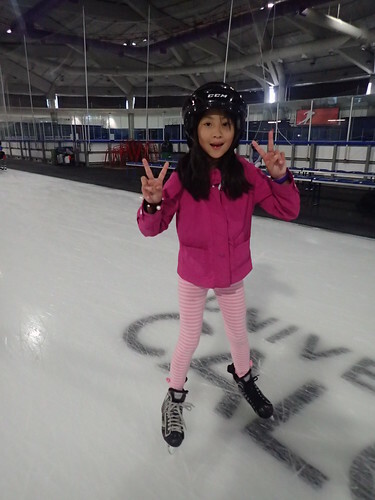 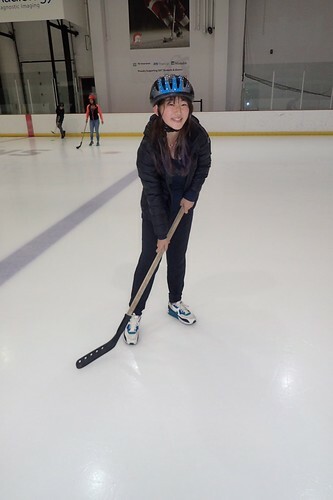 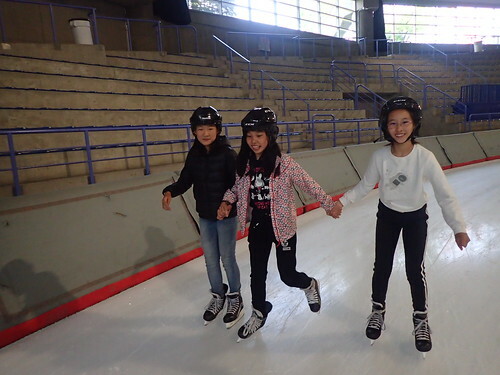 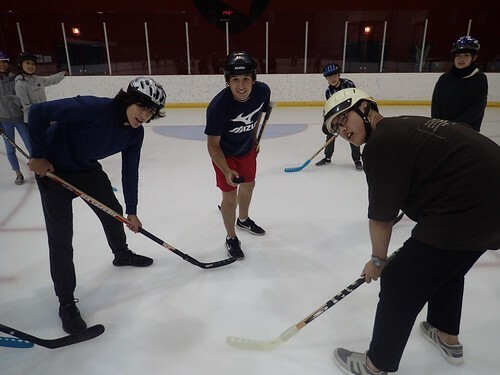 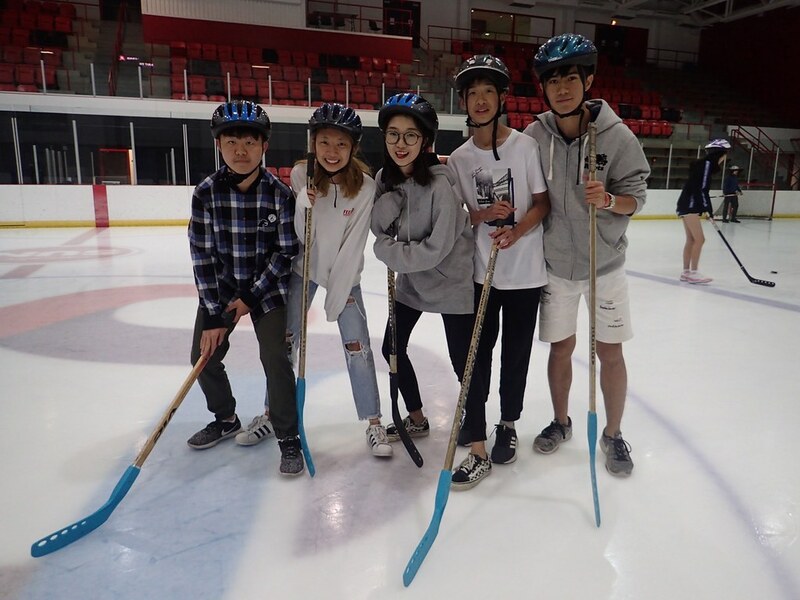 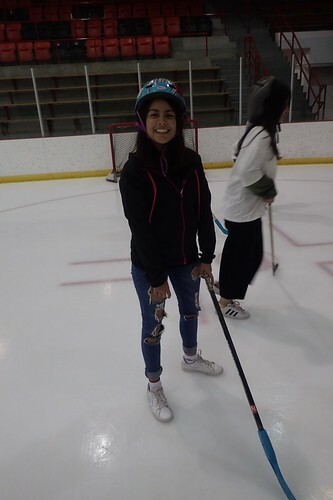 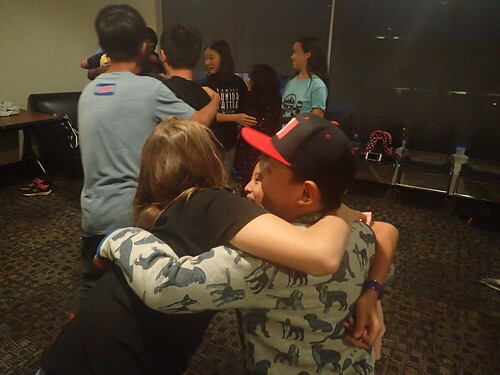 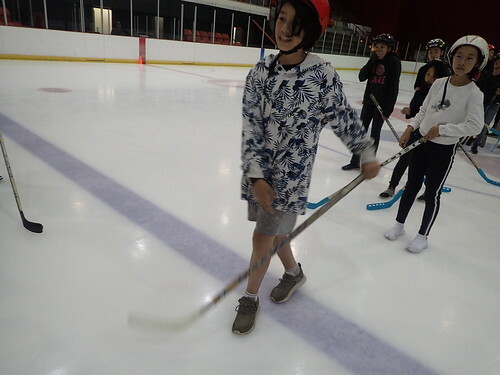 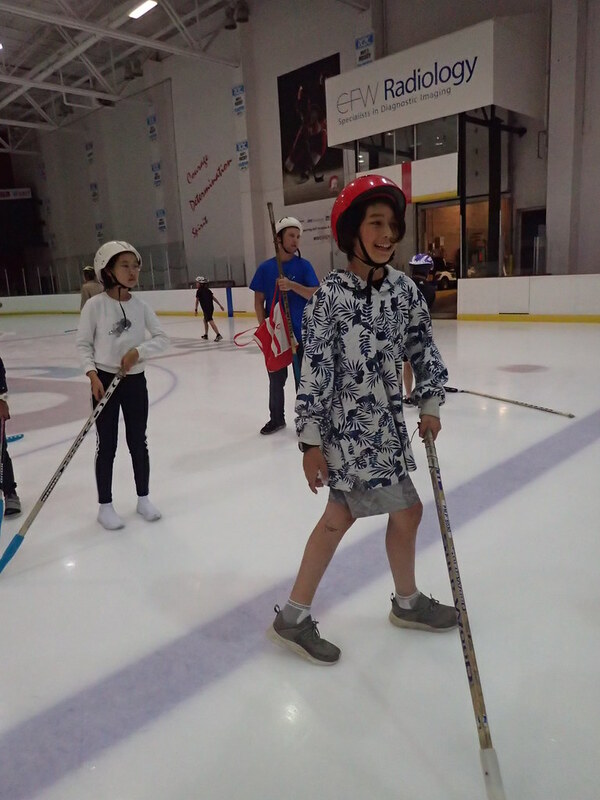 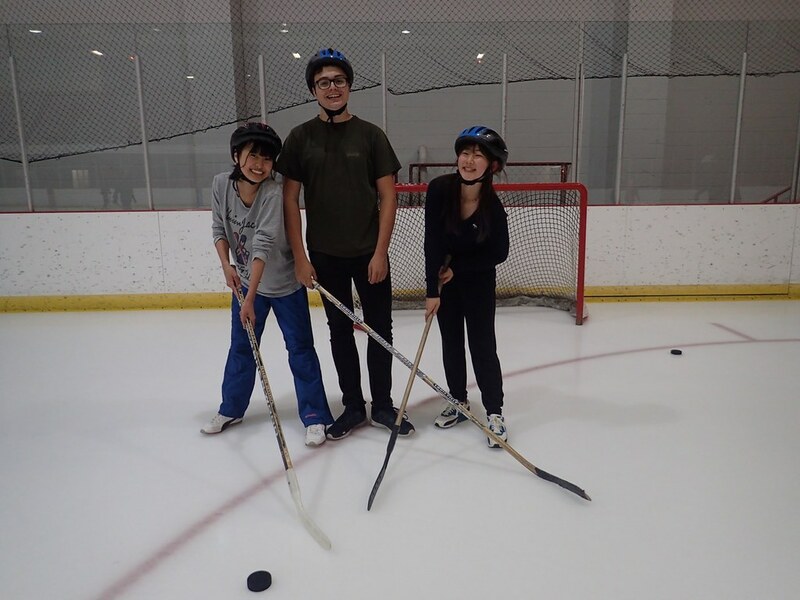 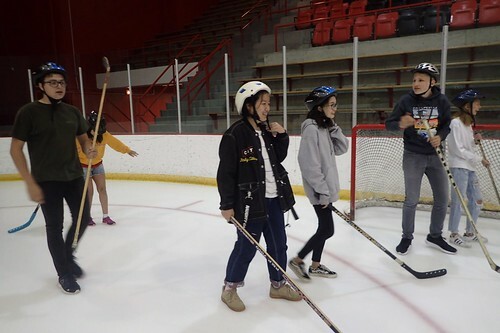 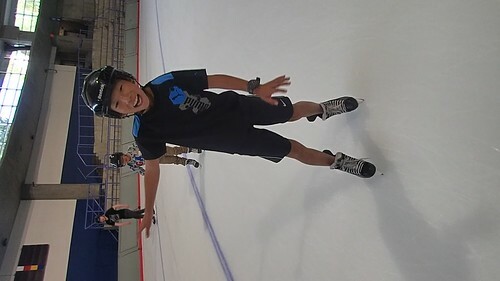 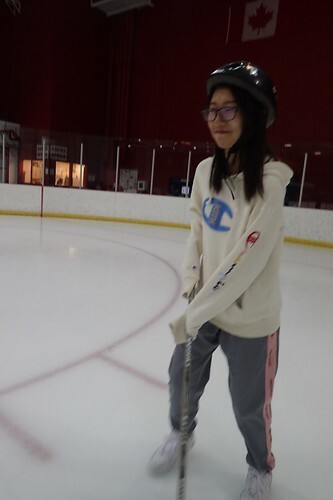 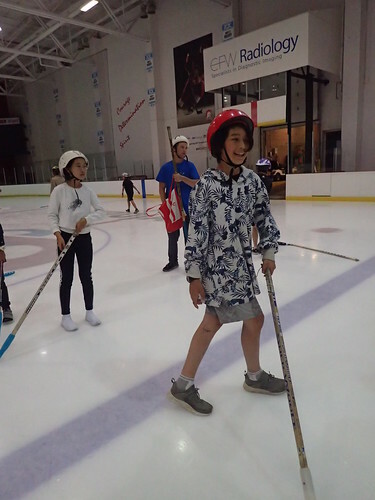 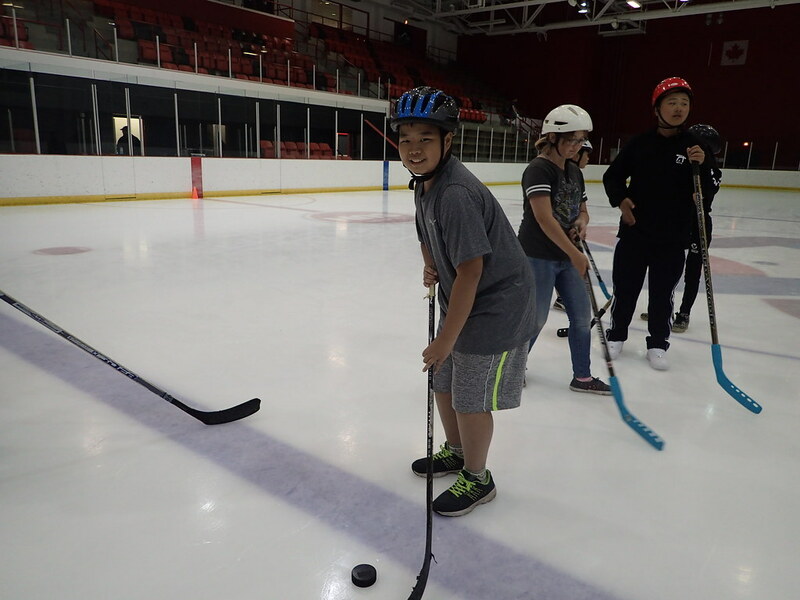 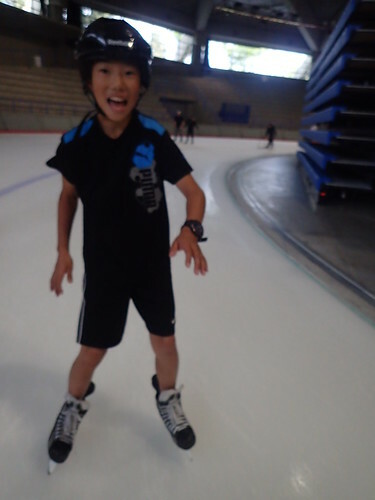 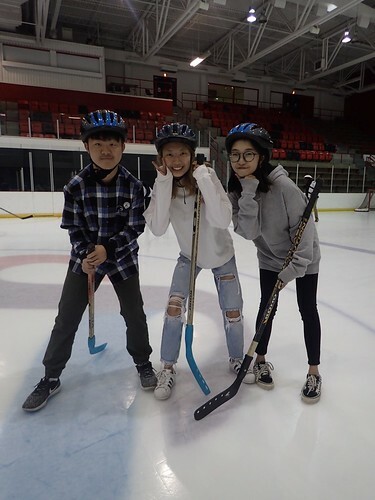 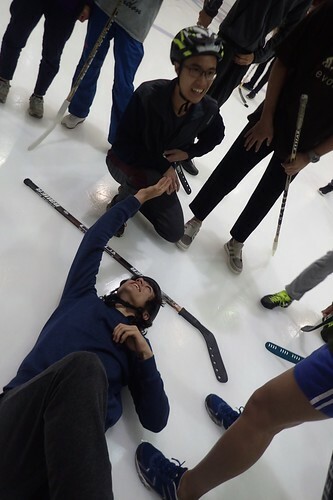 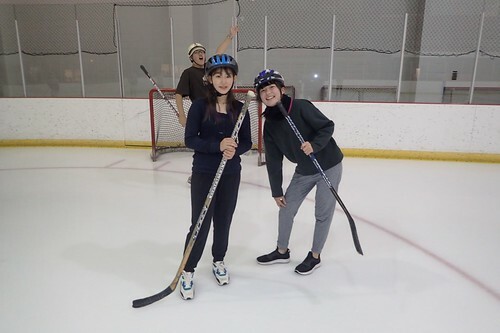 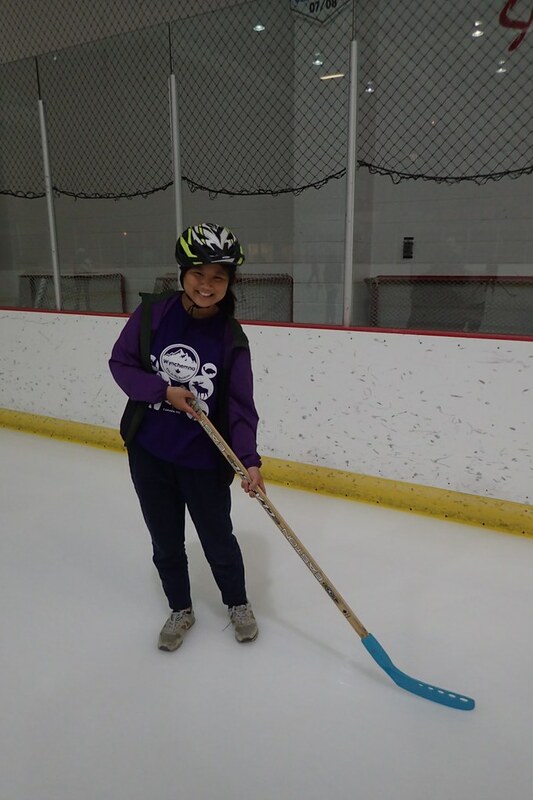 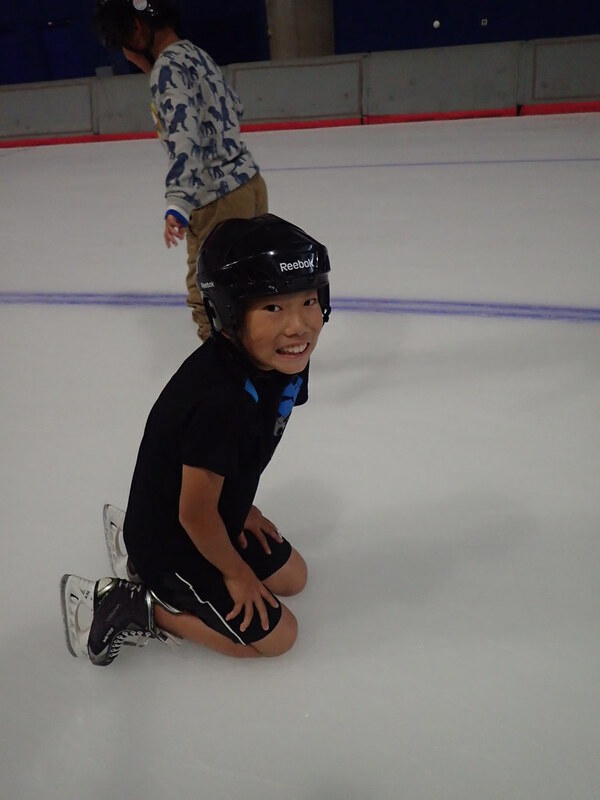 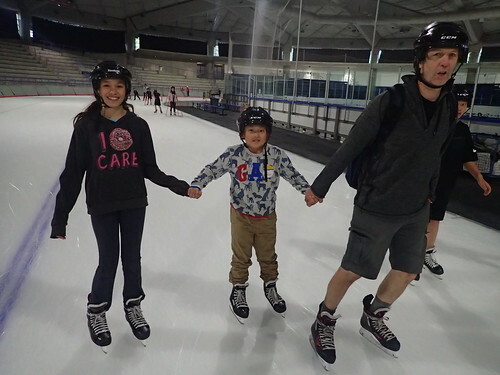 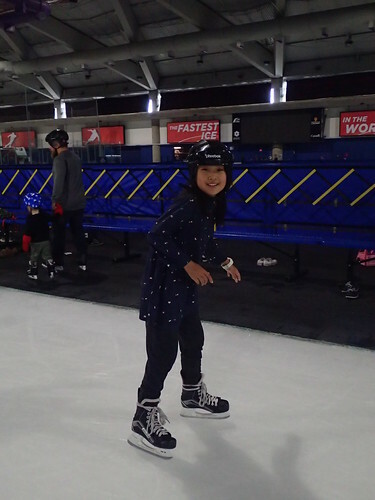 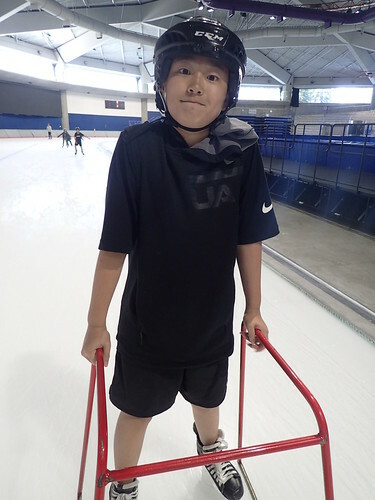 It was the first time skating for a few of them and they really enjoyed learning how to skate. 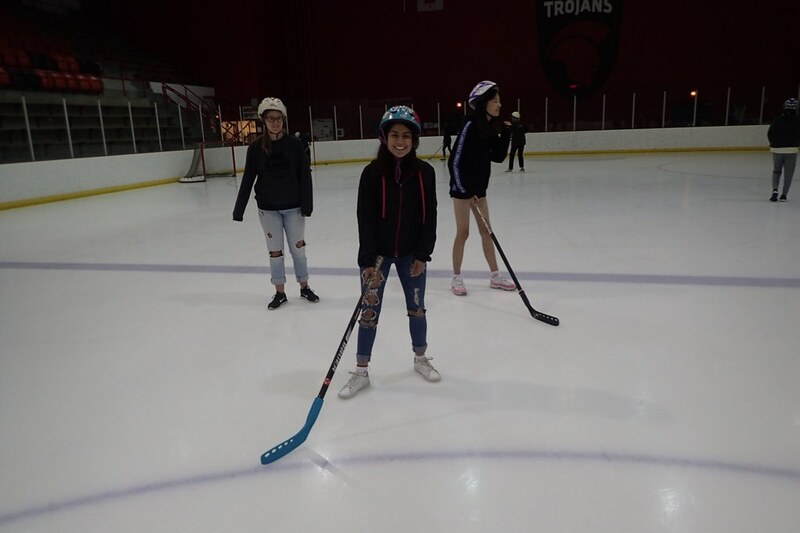 They headed back to SAIT after ice skating for the final two lessons of day and had to head back out to have supper at Swiss Chalet! 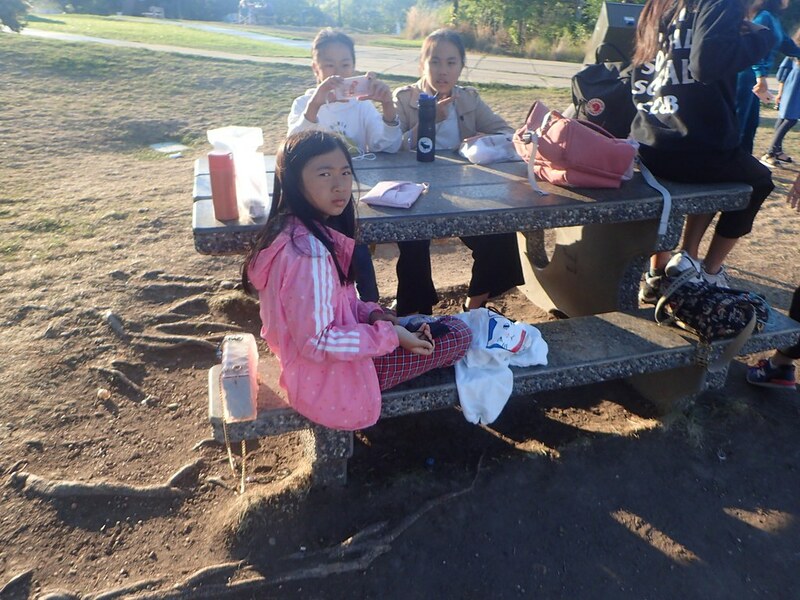 They enjoyed a caesar salad, chicken and mashed potato with gravy meal. 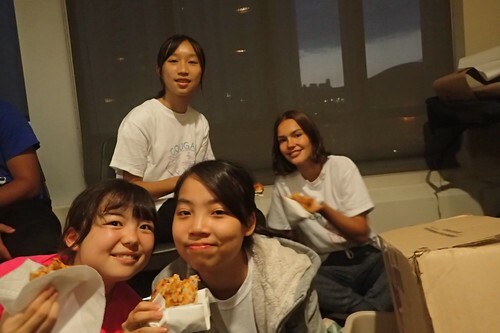 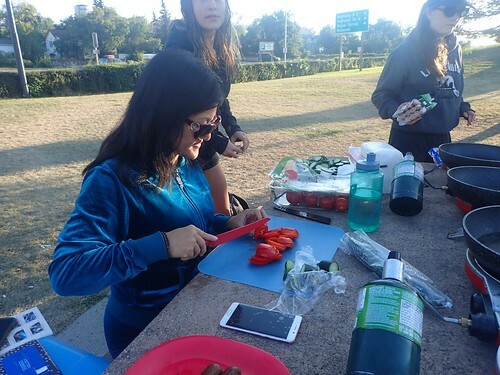 The vegetarians enjoyed a rice and vegetable stir fry. 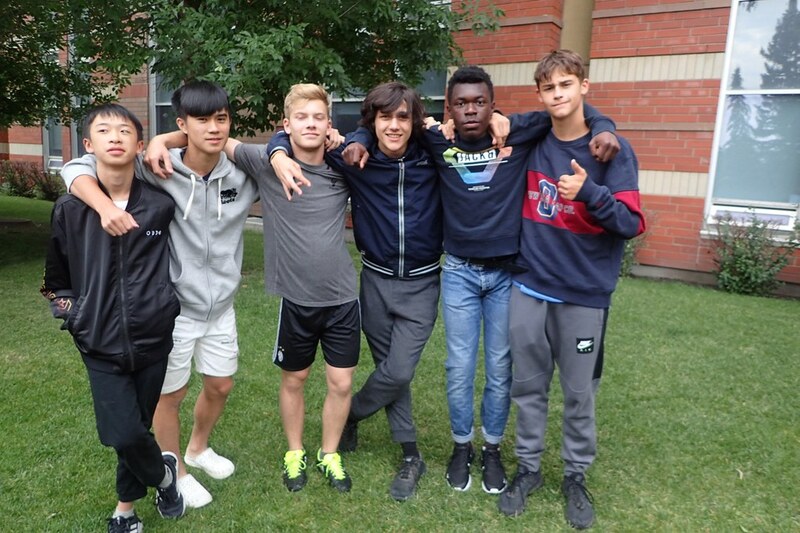 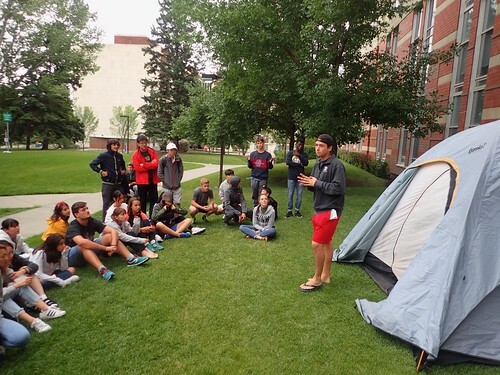 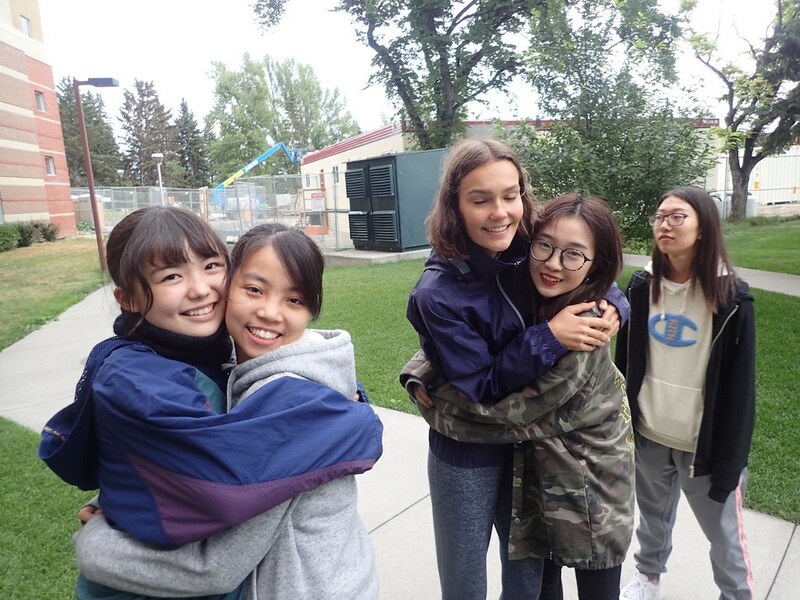 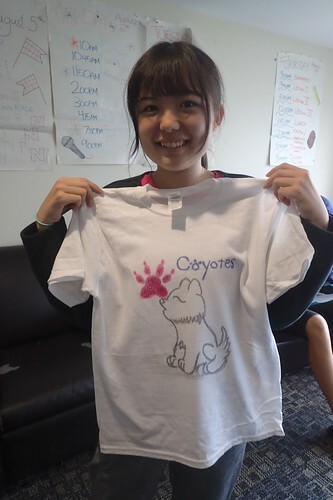 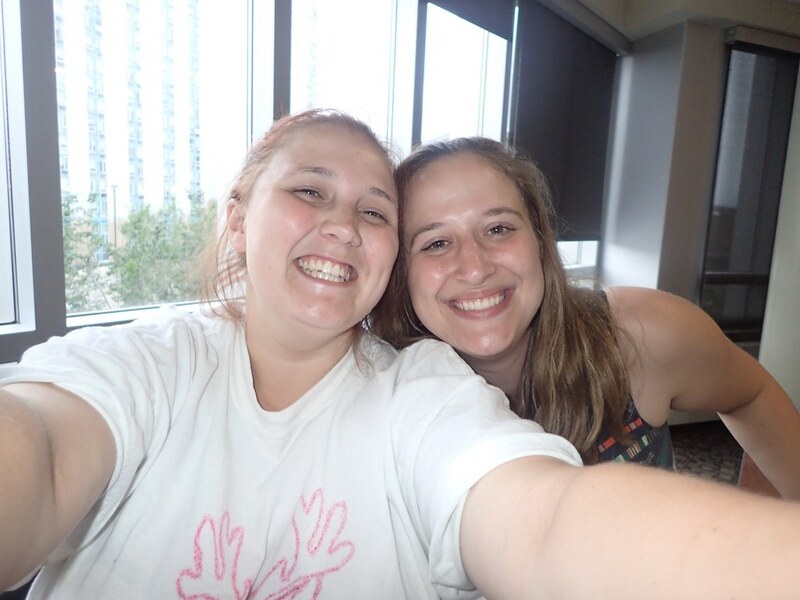 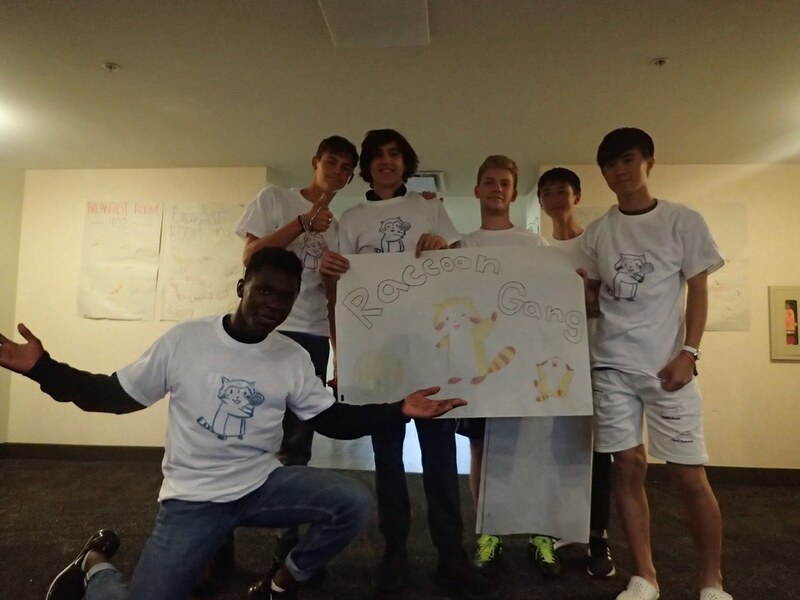 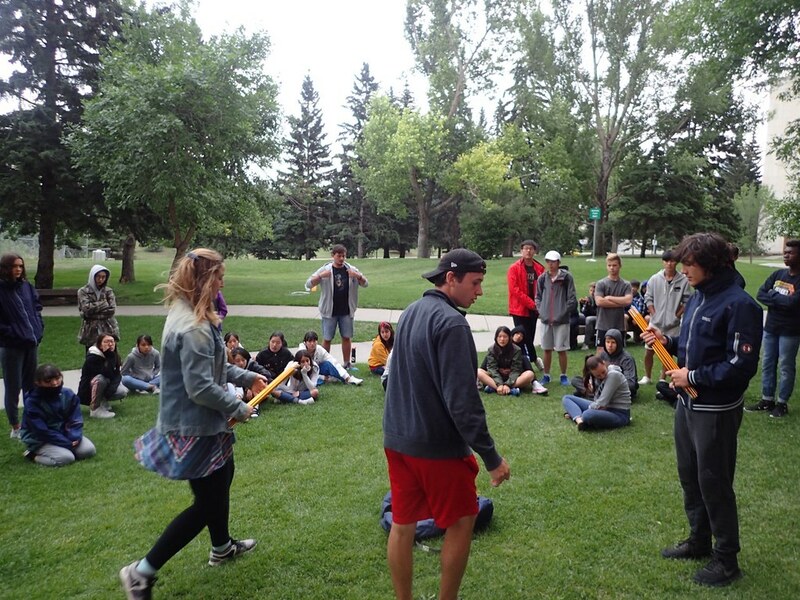 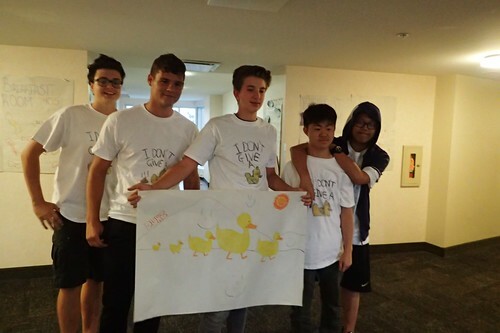 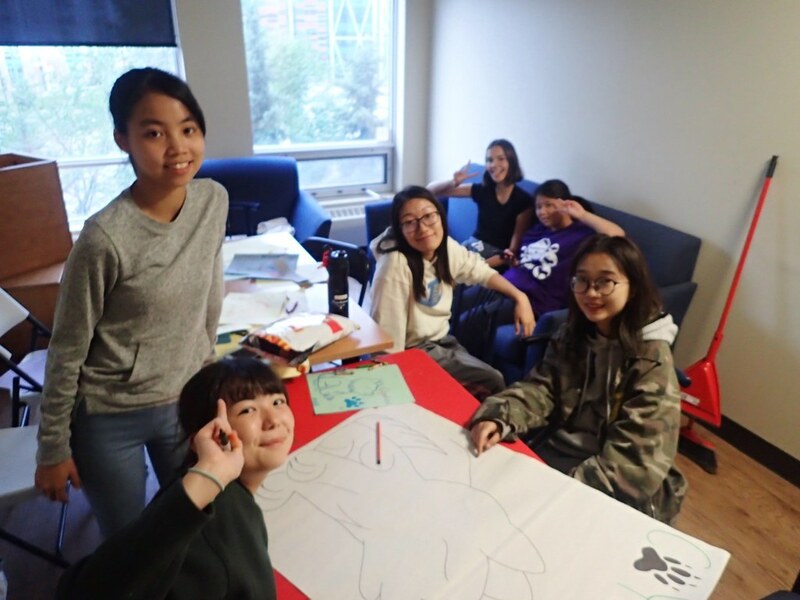 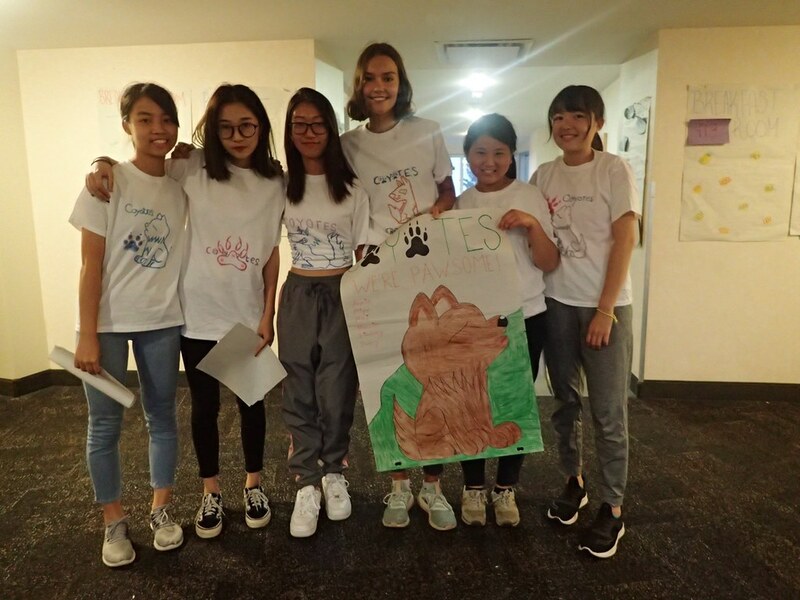 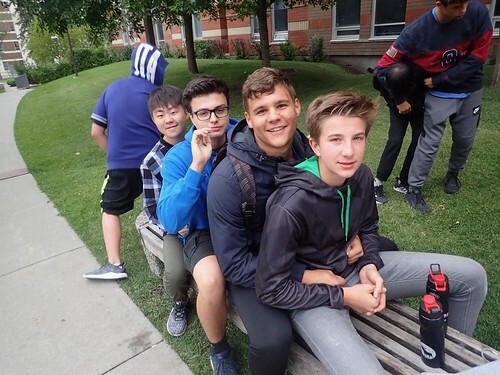 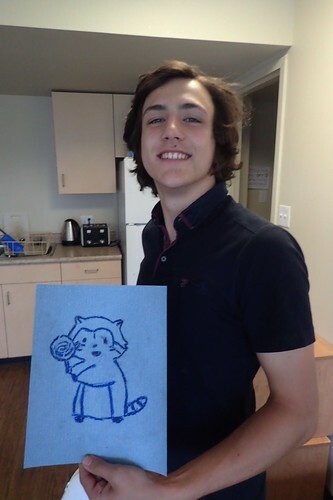 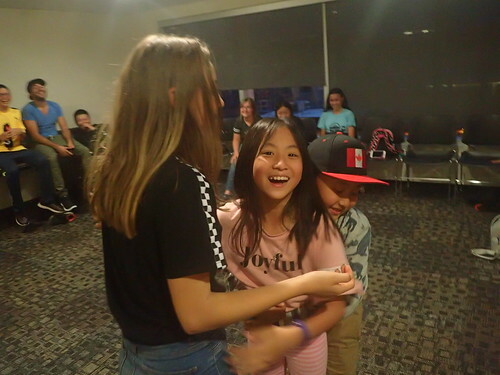 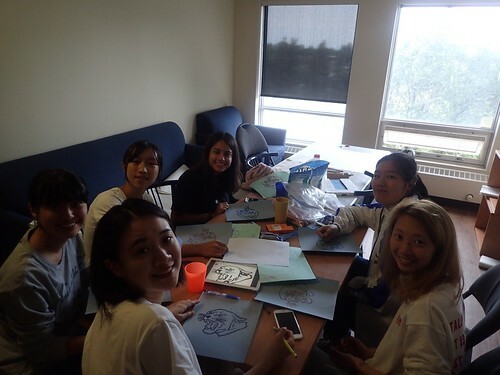 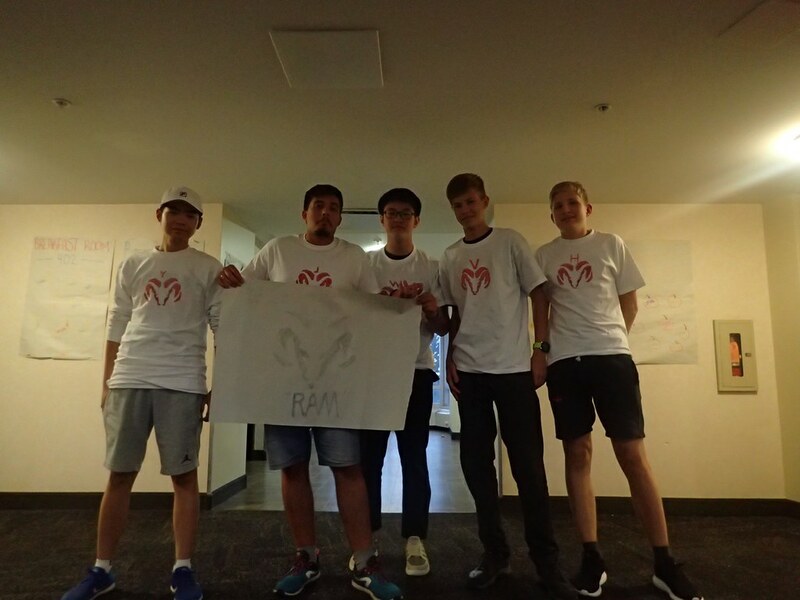 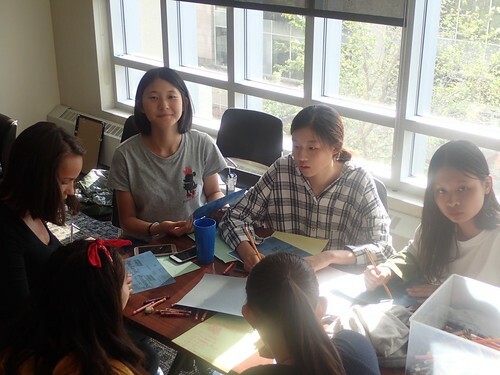 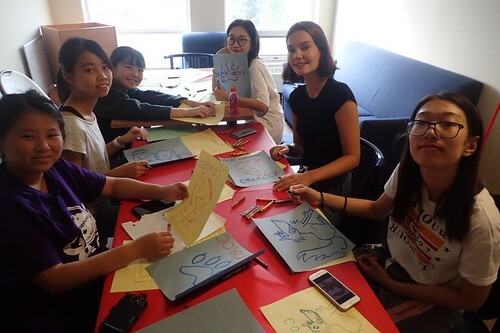 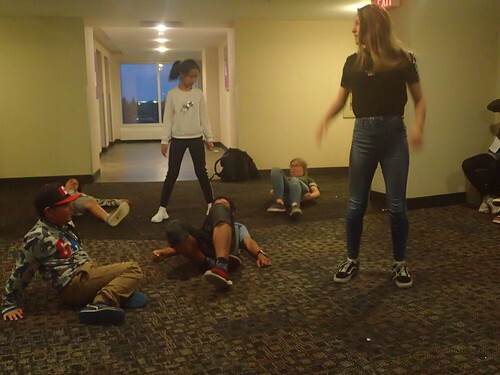 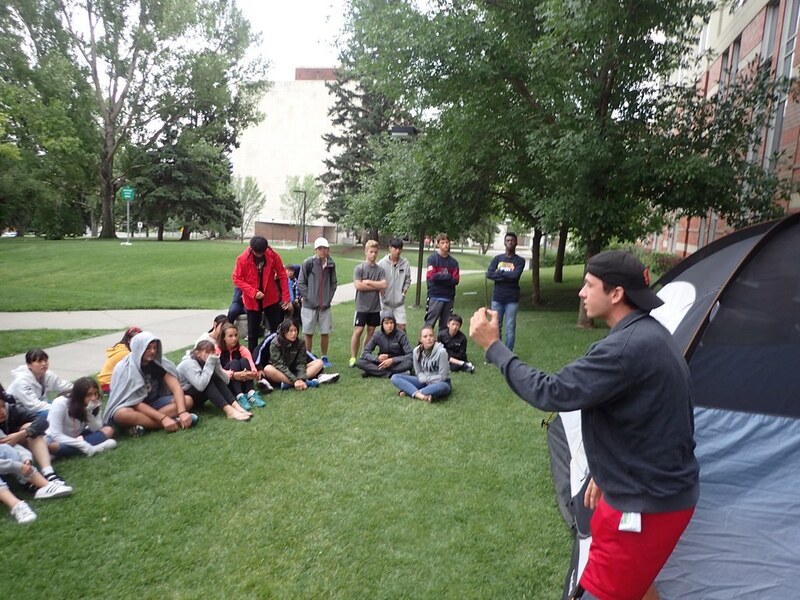 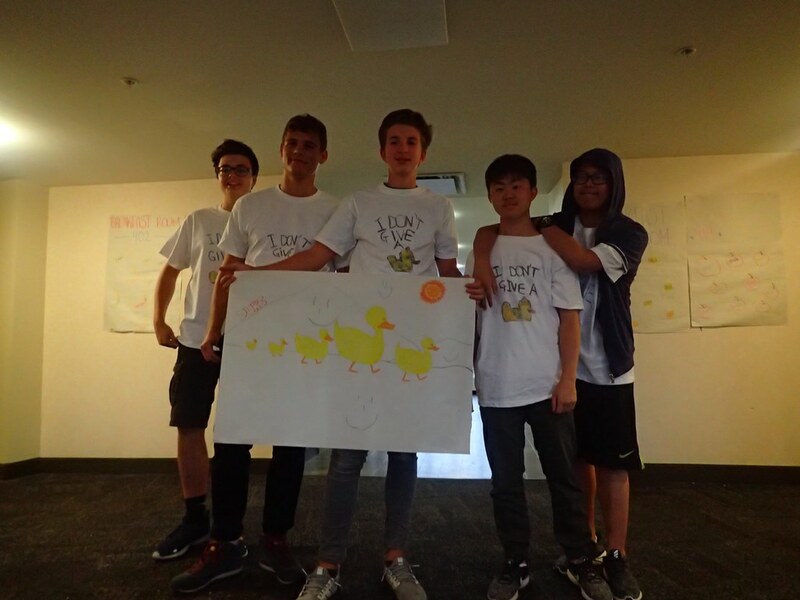 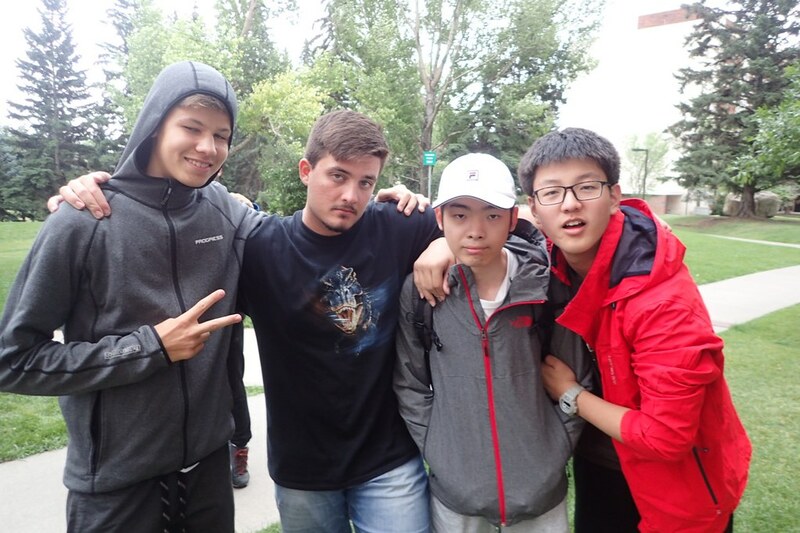 The day wasn’t over yet for these Foxes though… They came back to SAIT for a Loose Moose workshop where they really enjoyed fun activities. 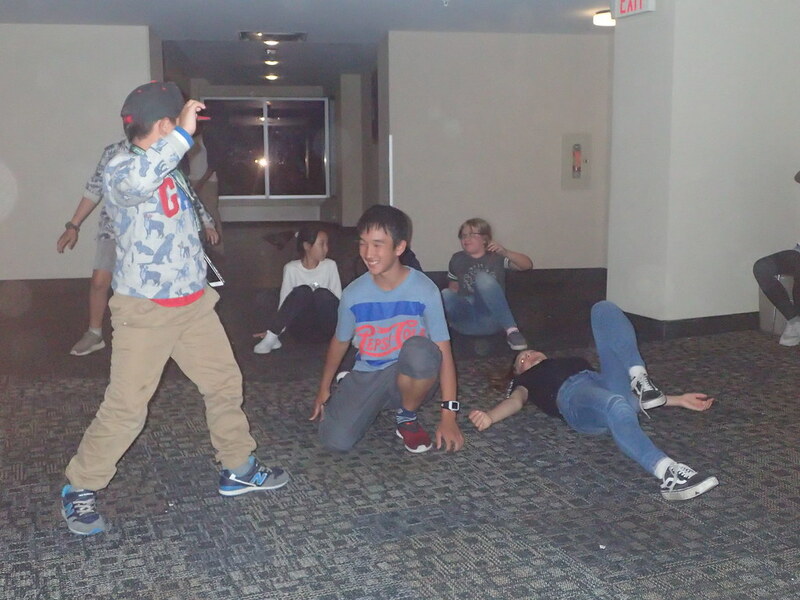 The day was way too long for them so they made it to bed very fast and are fast asleep.